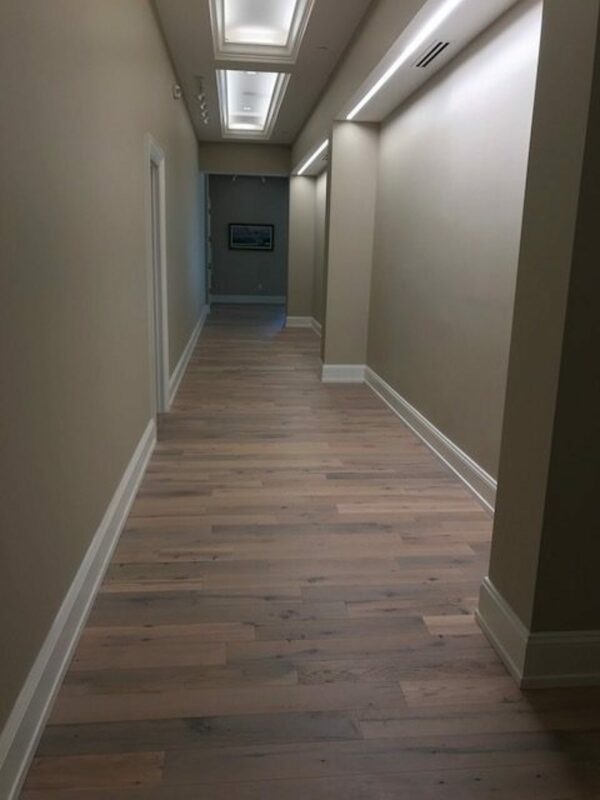 Take a look at our best projects. 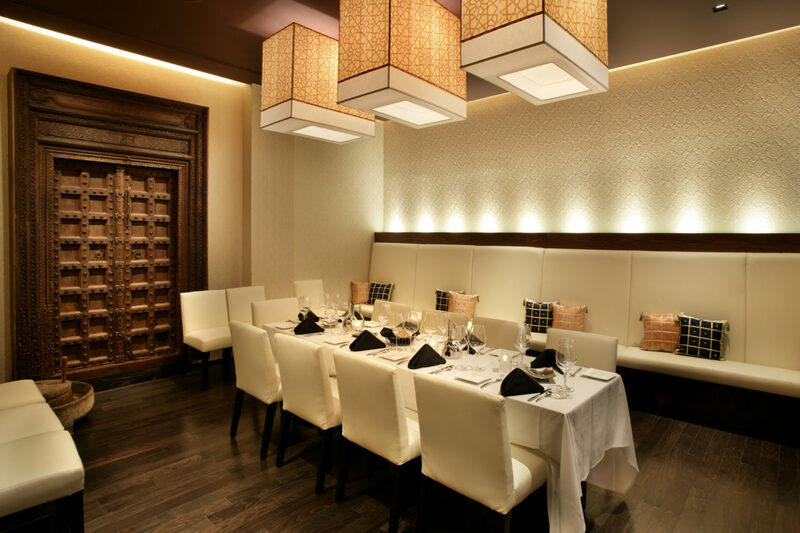 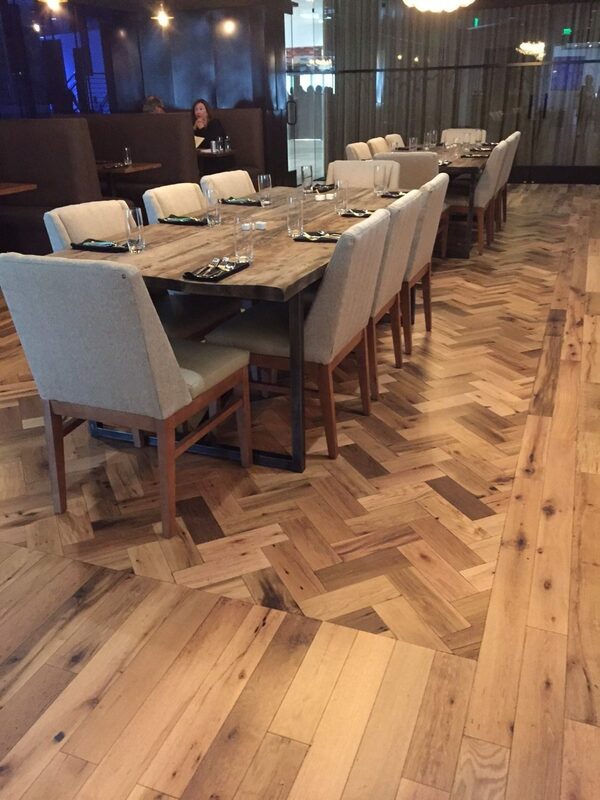 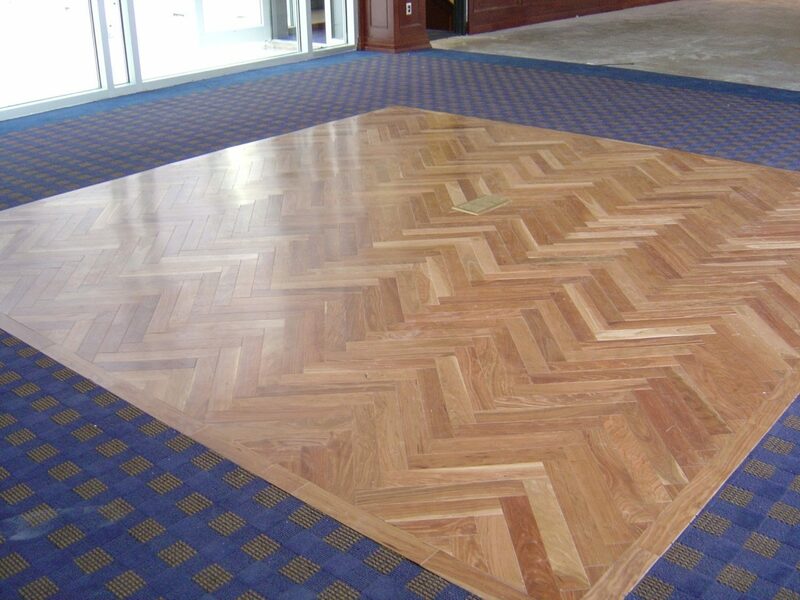 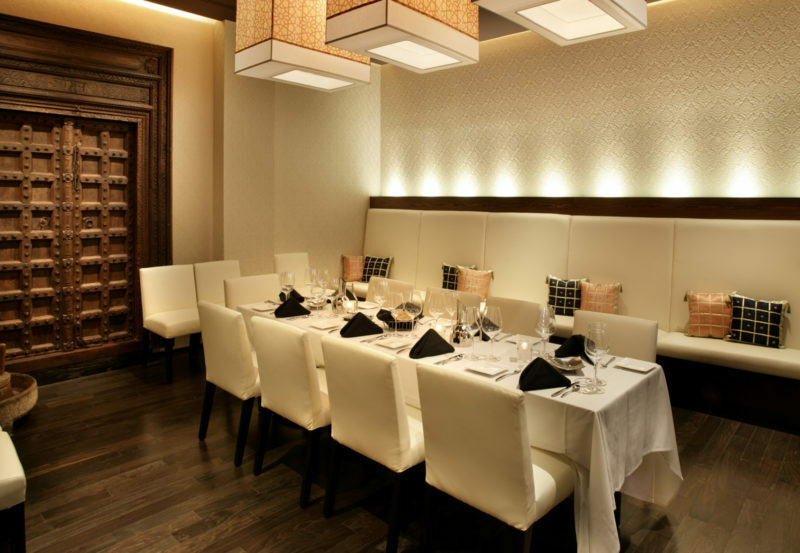 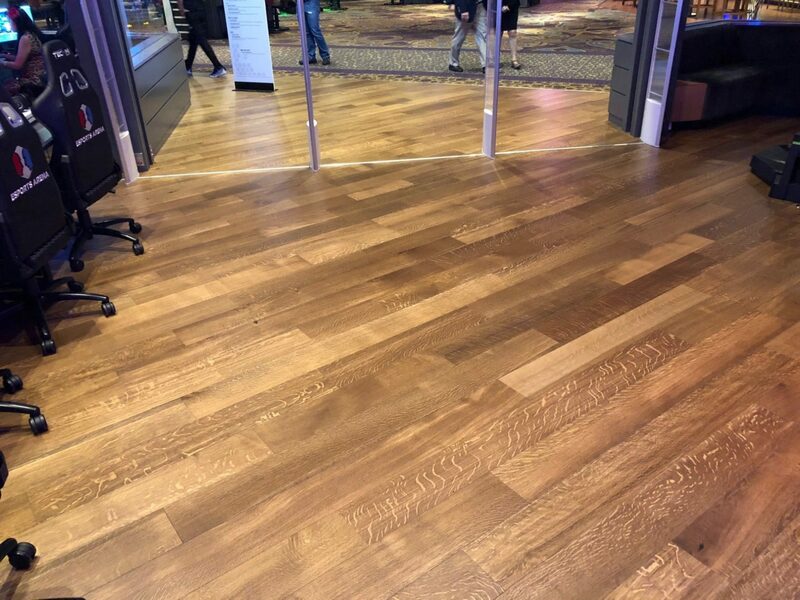 Our 7.5" Wideplank Rift and Quartered White Oak in the Cinnamon Toast finish at the Luxor Hotel & Casino. 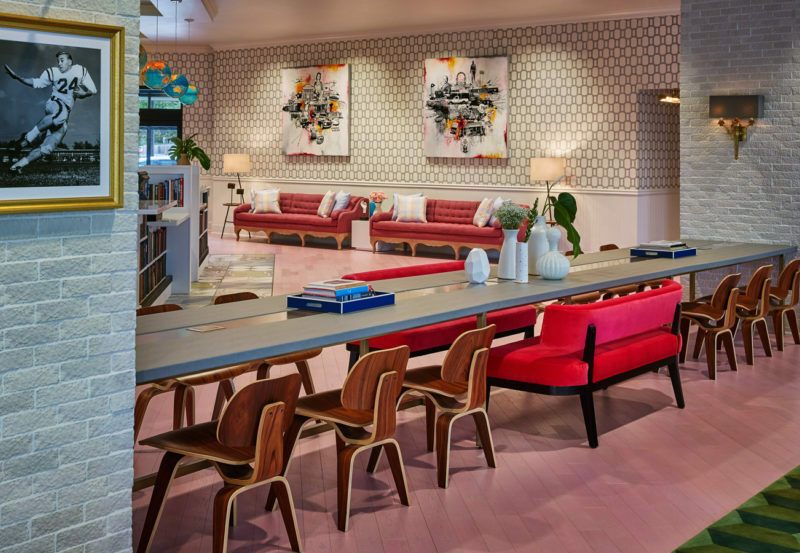 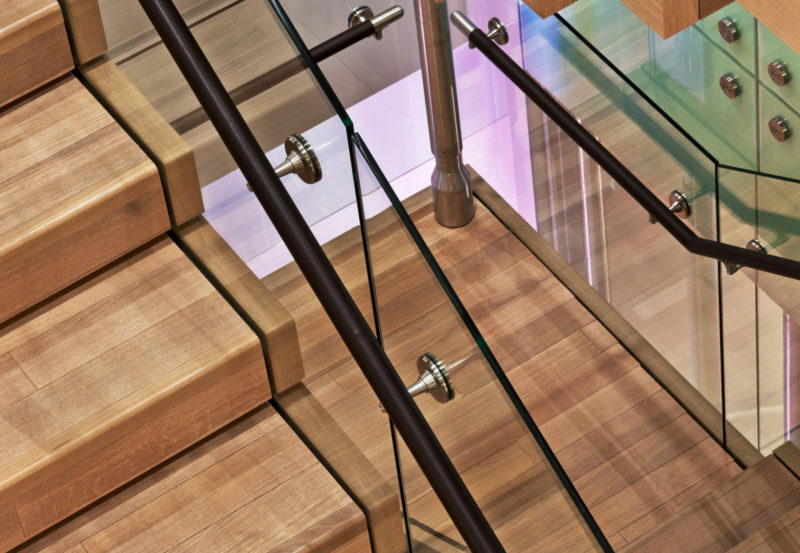 Plainsawn White Oak with a custom pink finish accents this space's southern charm. 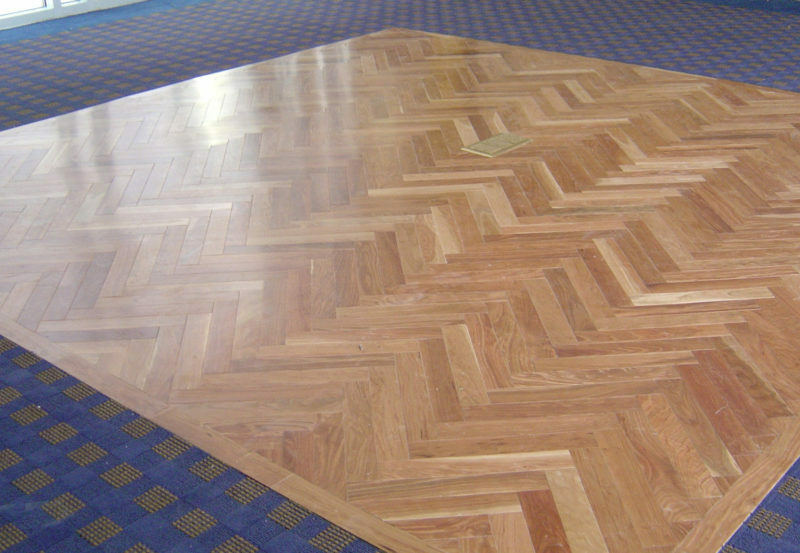 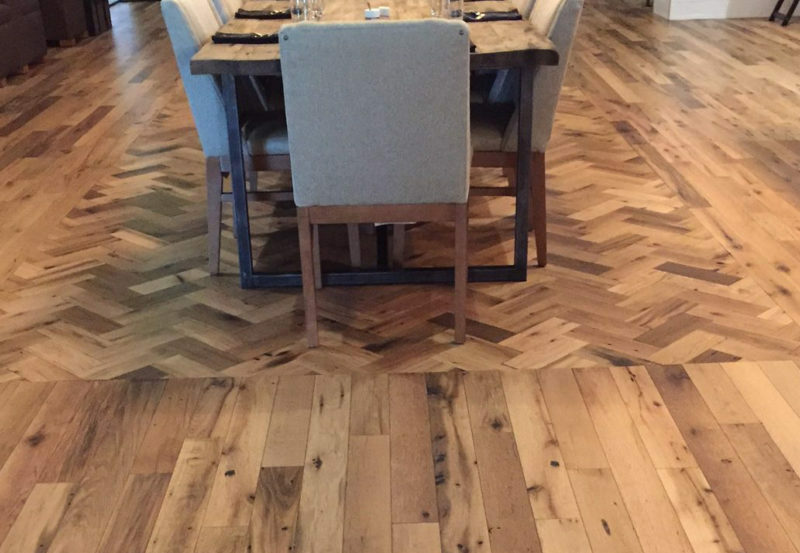 Reclaimed Oak Natural flooring is an excellent choice for living and dining rooms. 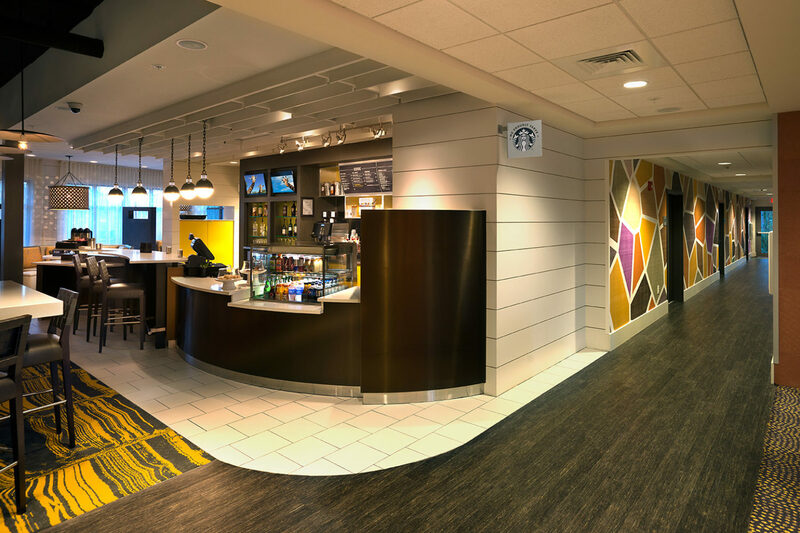 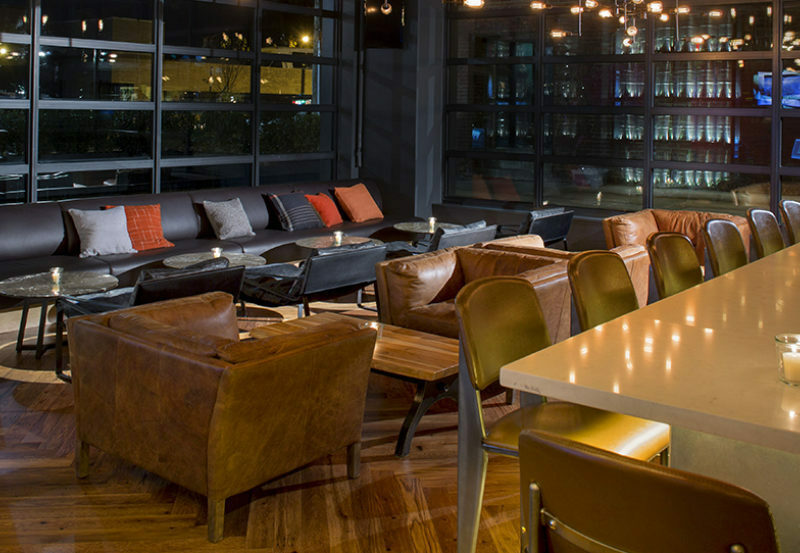 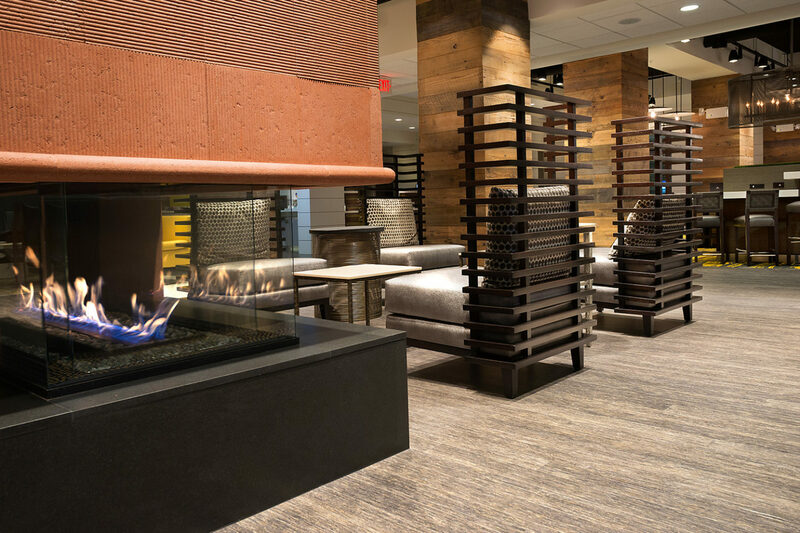 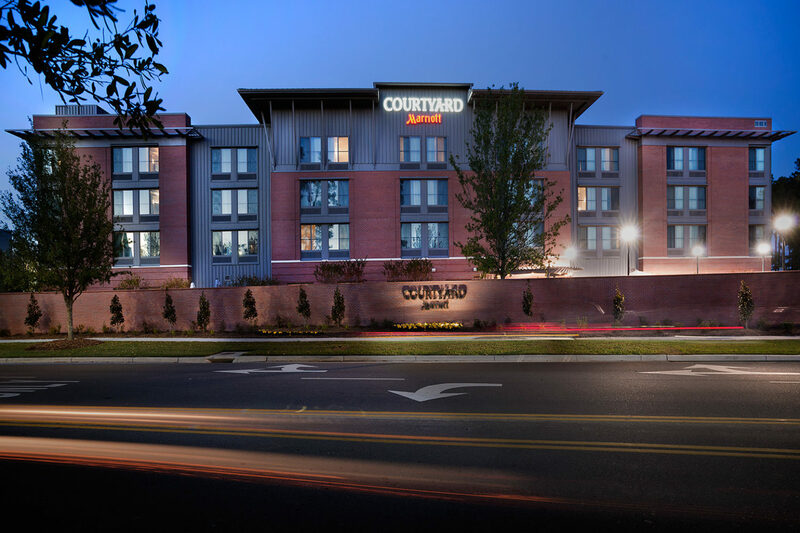 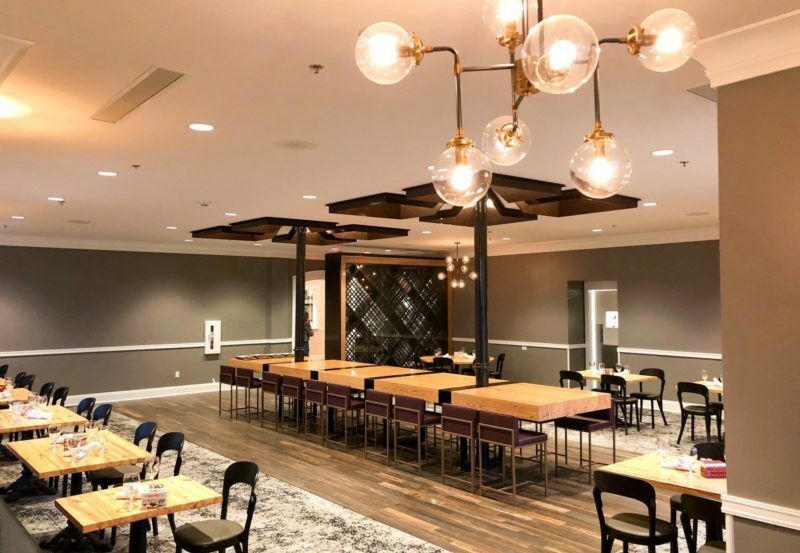 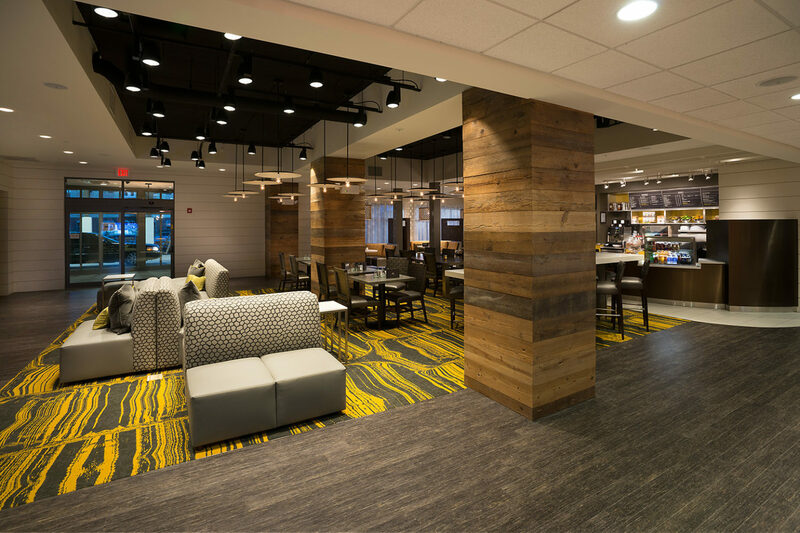 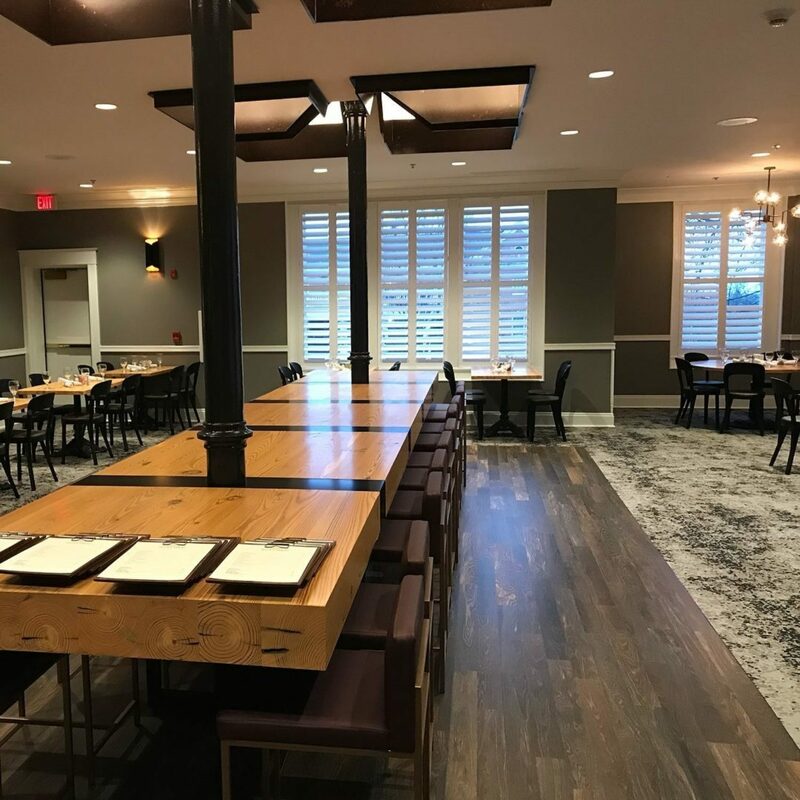 COR Wenge gives a modern style for public areas like the Courtyard Marriott. 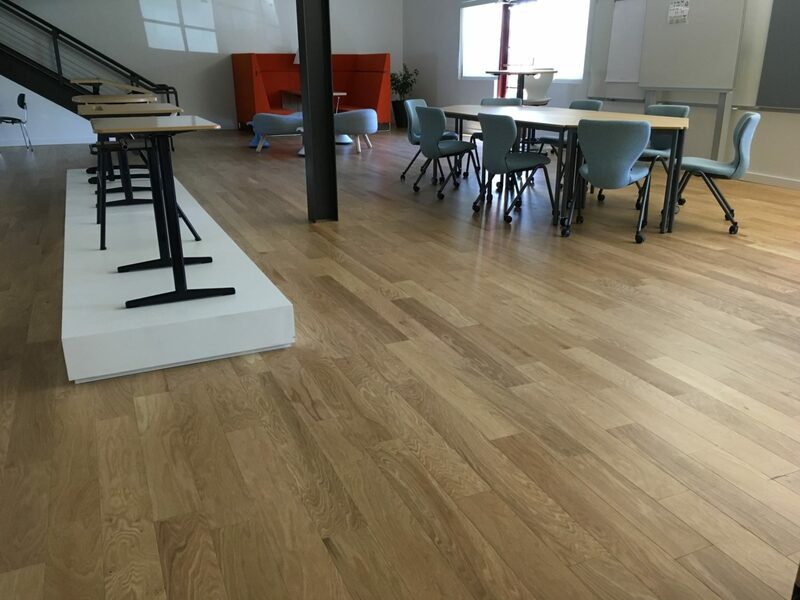 Plainsawn White Oak Oxford provides a contemporary tone for a gathering area. 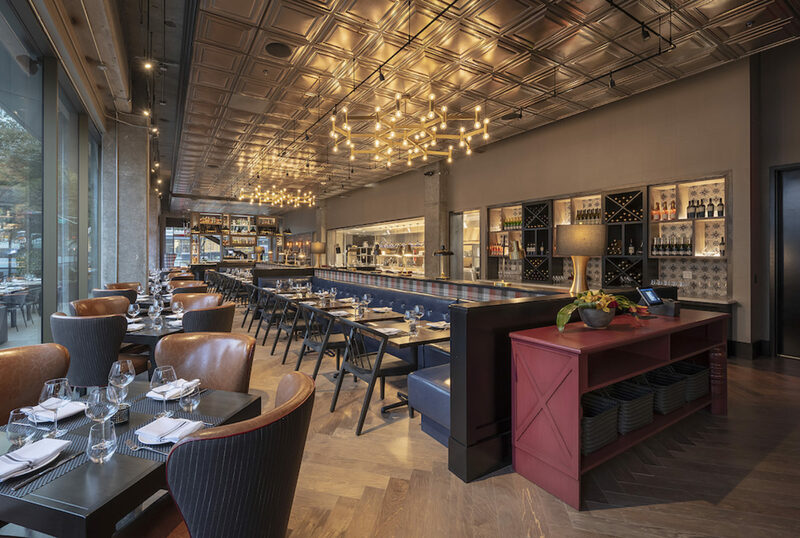 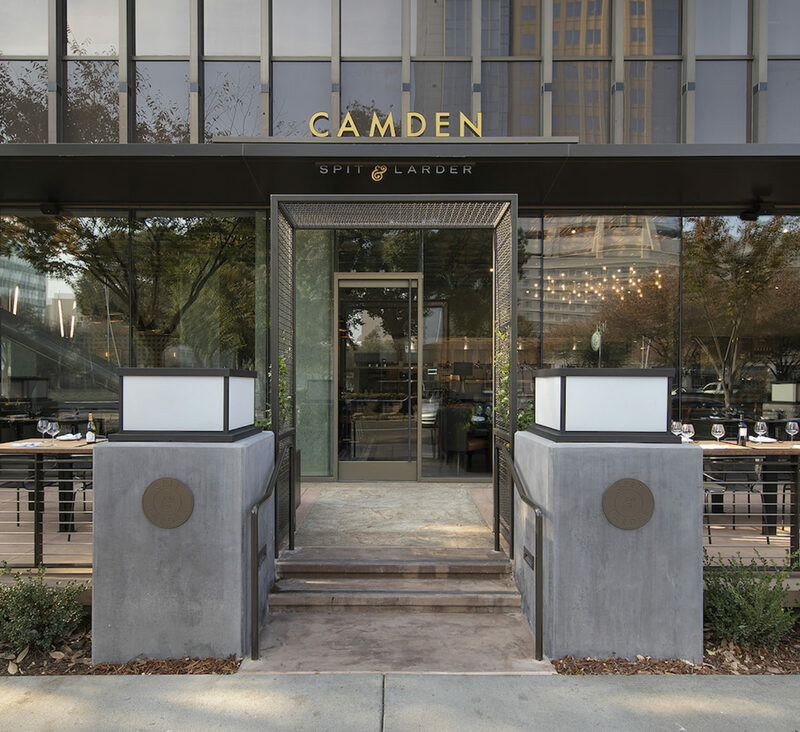 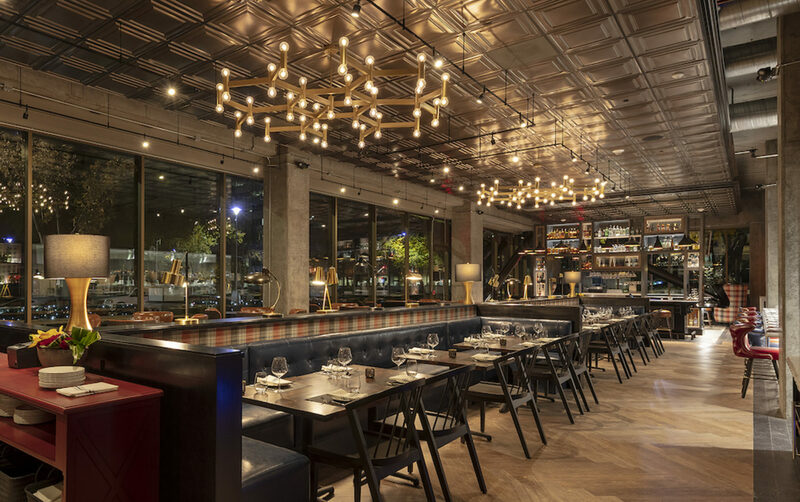 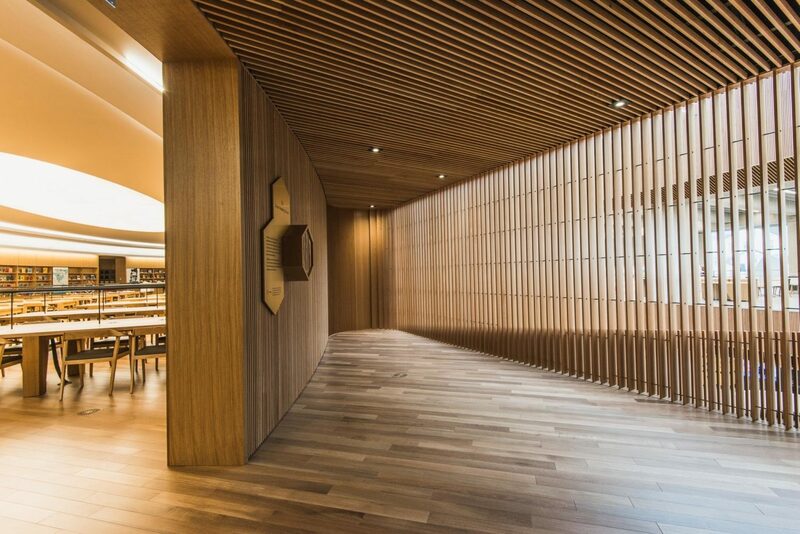 This ebony on the Maple City Fog gives the durability for this renowned restaurant. 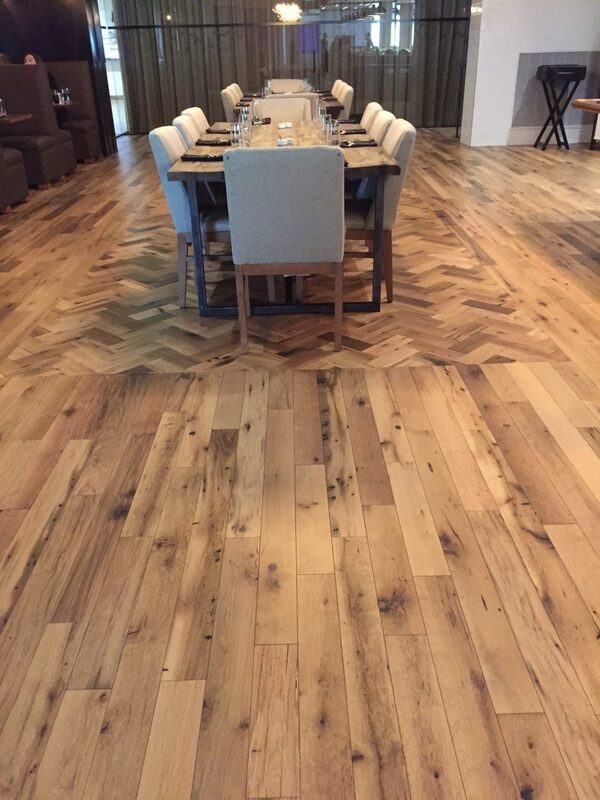 Our TXTURE Plainsawn White Oak - Oxford suits the space's relaxed atmosphere within this historic boutique hotel. 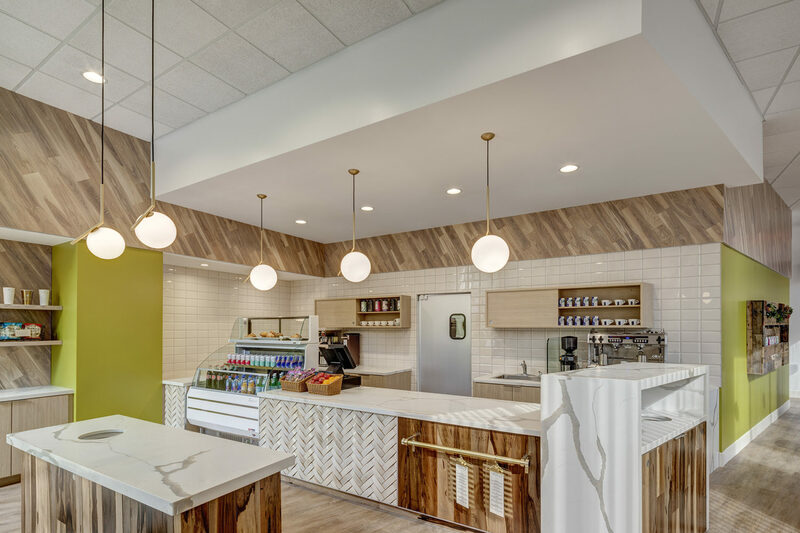 A natural look for this conscious cafe. 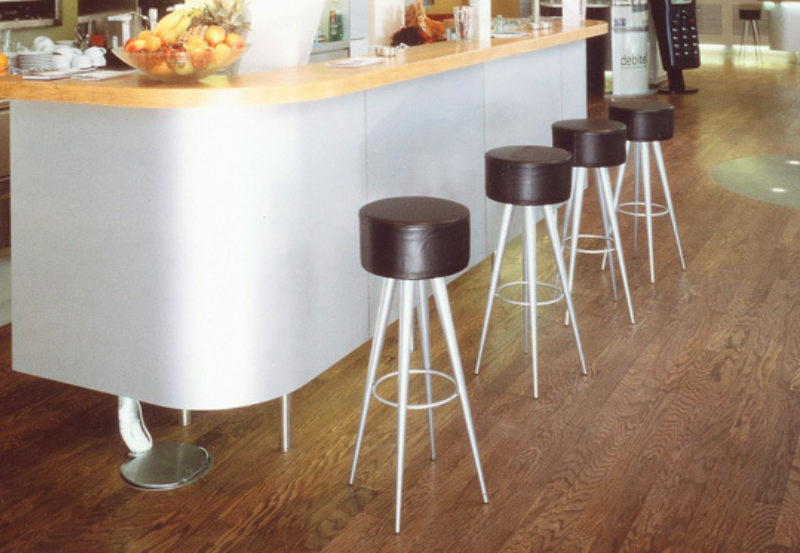 Walnut Espresso sets the perfect tone for a more artistic look. 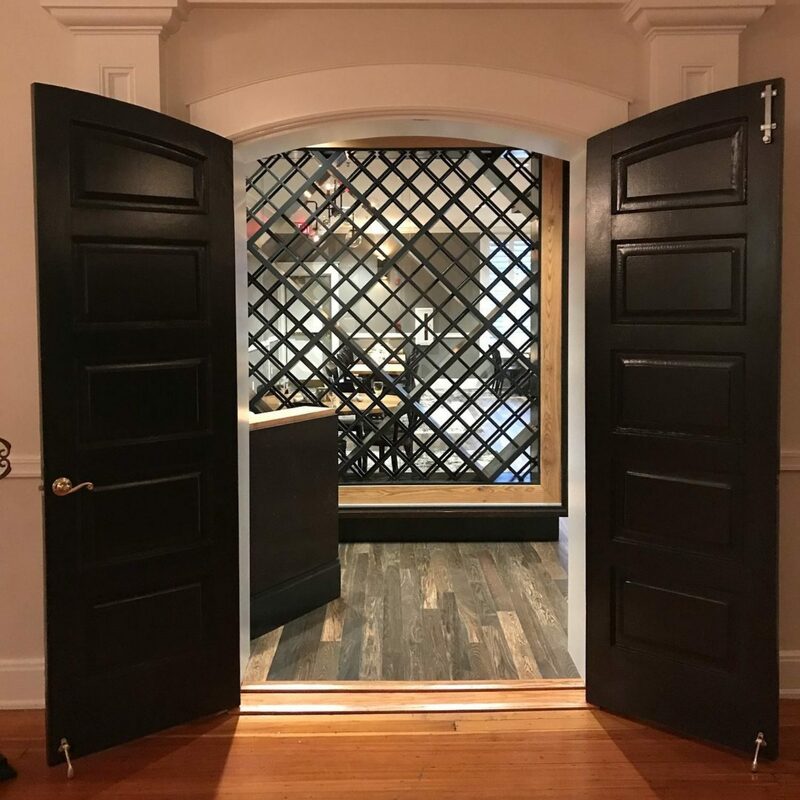 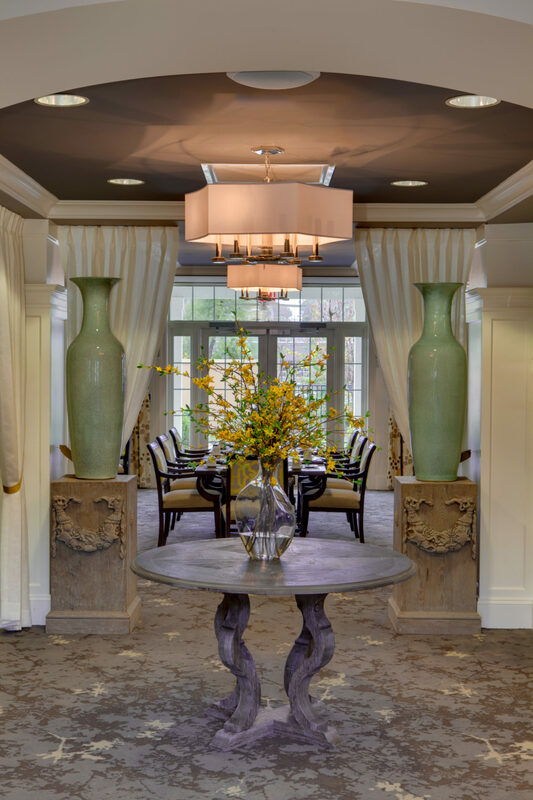 Walnut Steel Gray provides a formal tone for a dining room. 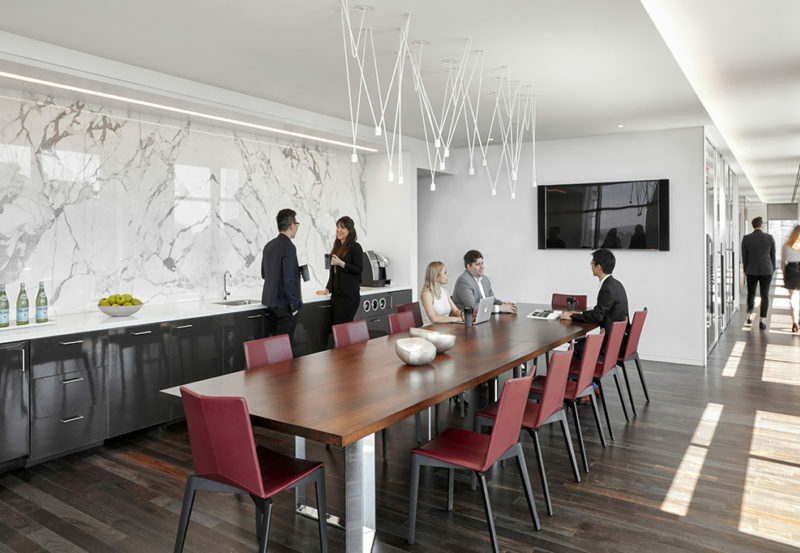 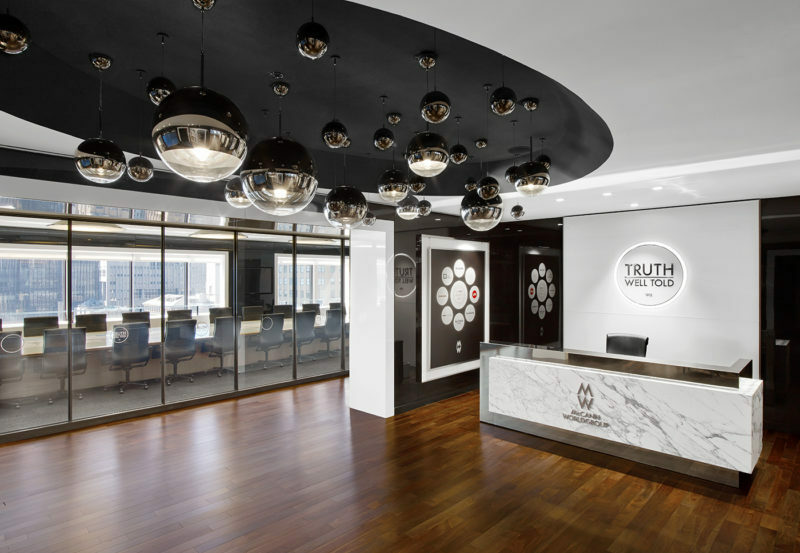 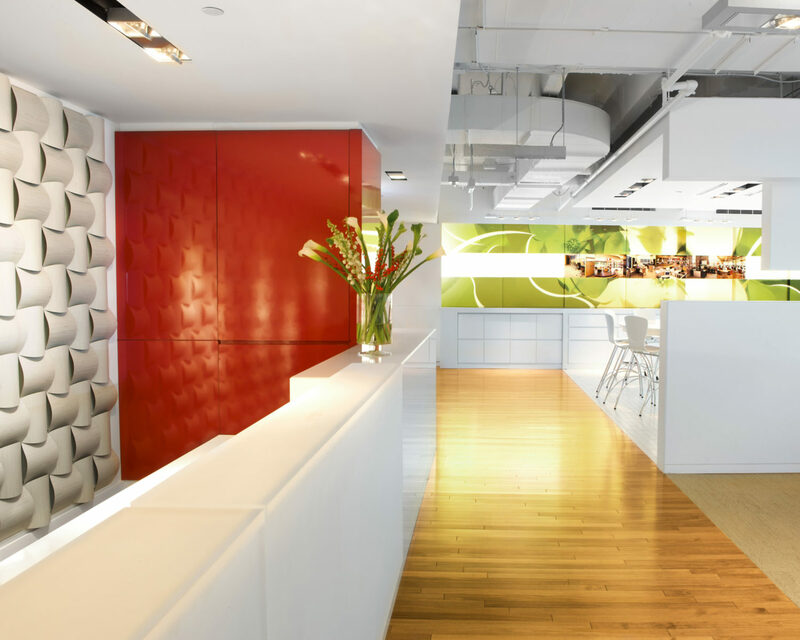 Custom Cherry compliments this modern office furniture showroom. 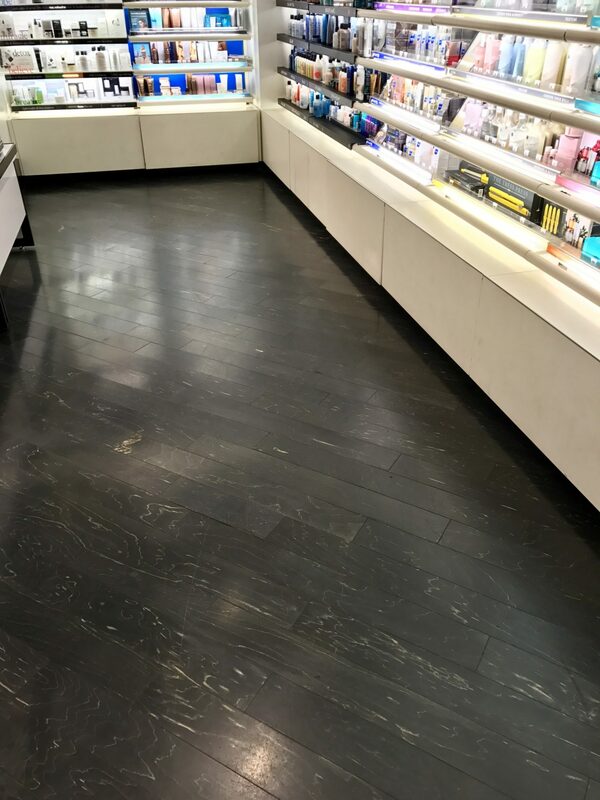 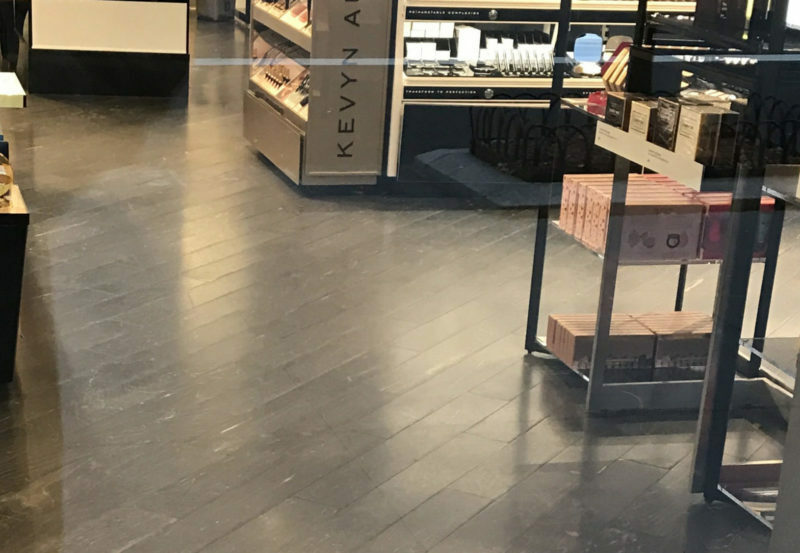 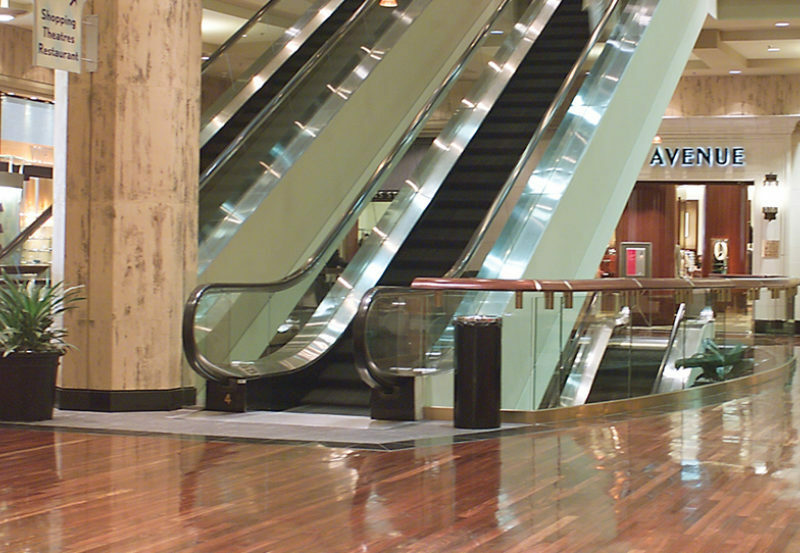 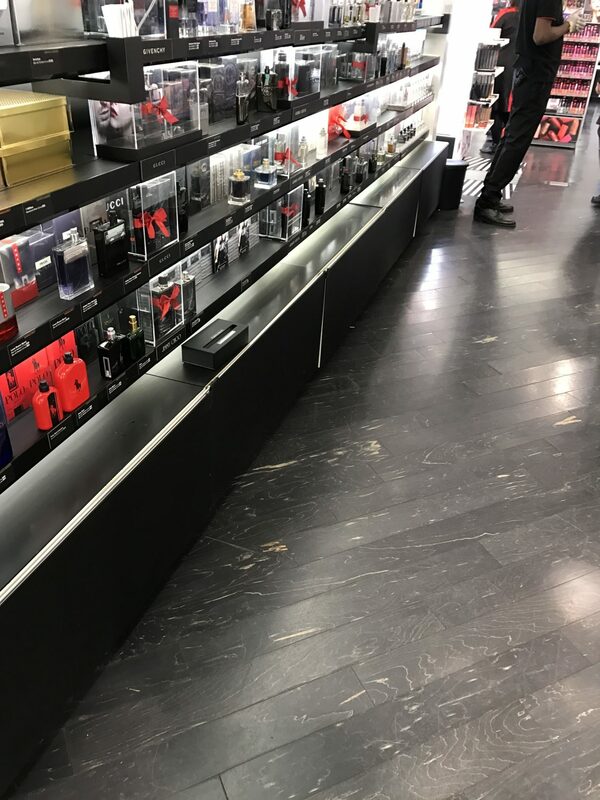 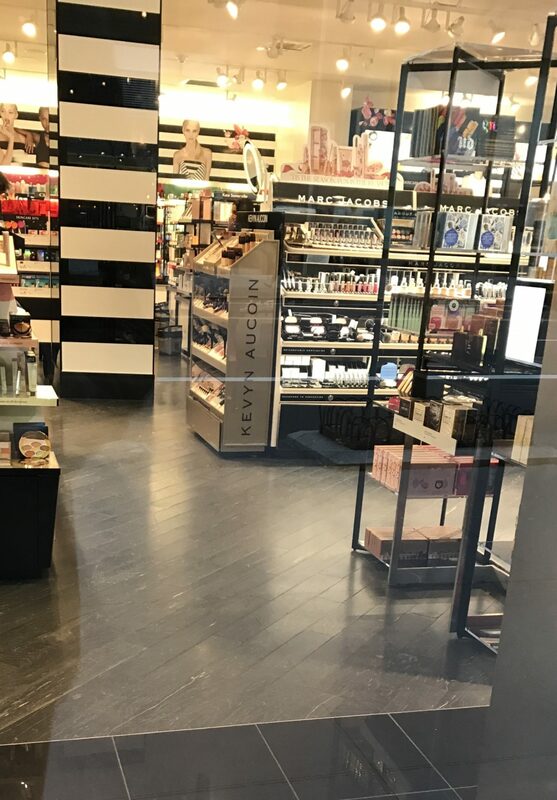 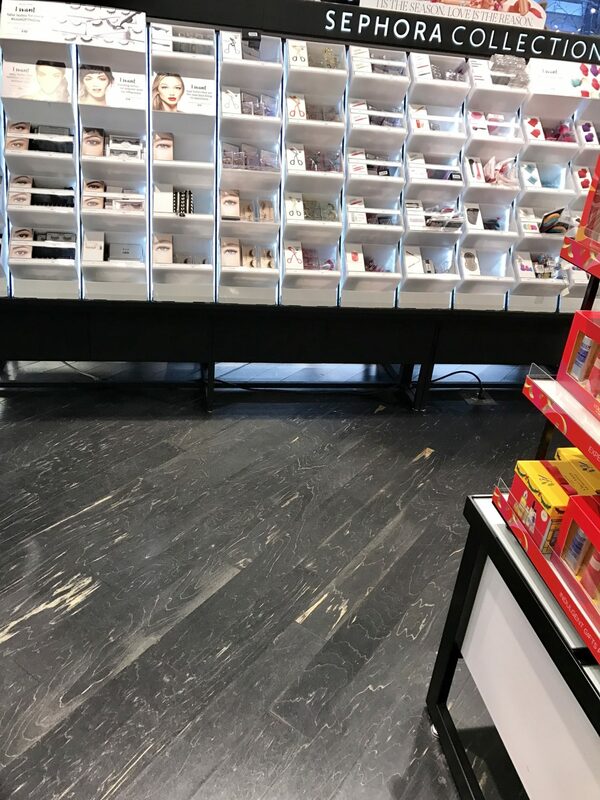 Maple Ebony flooring is widely used in department stores like Sephora. 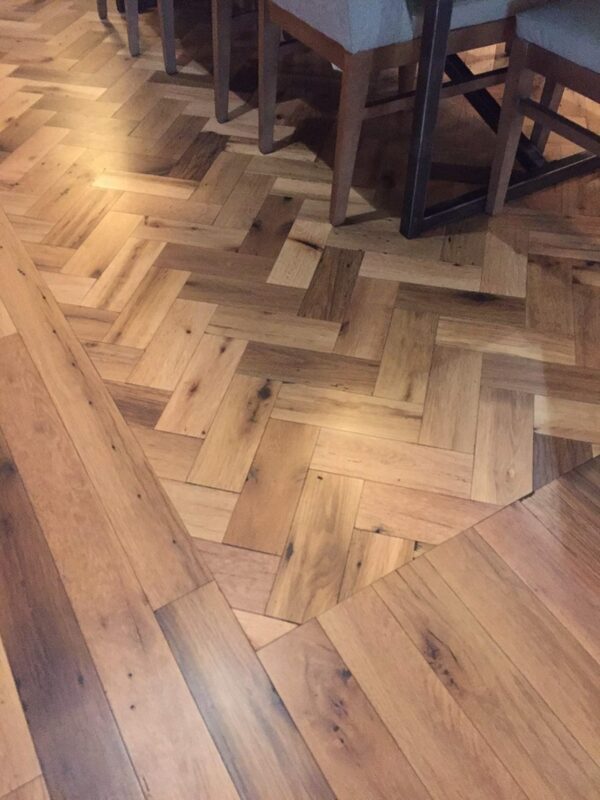 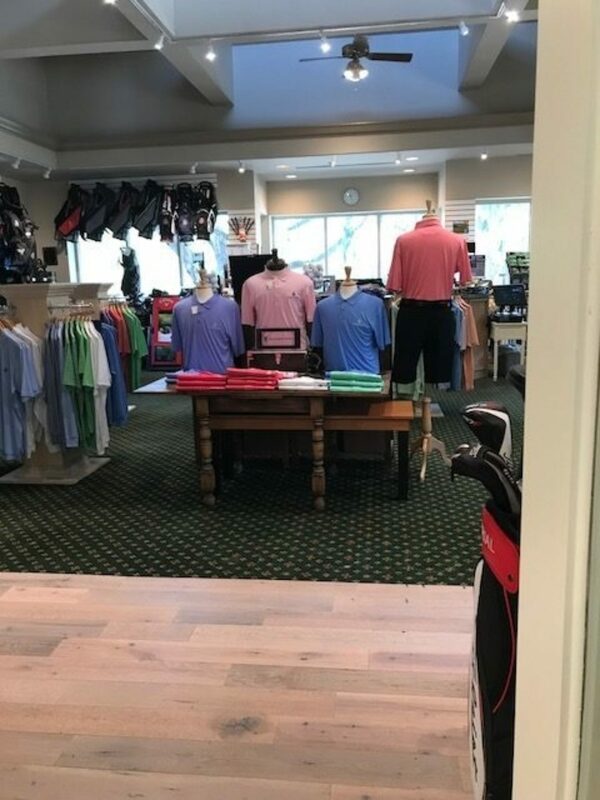 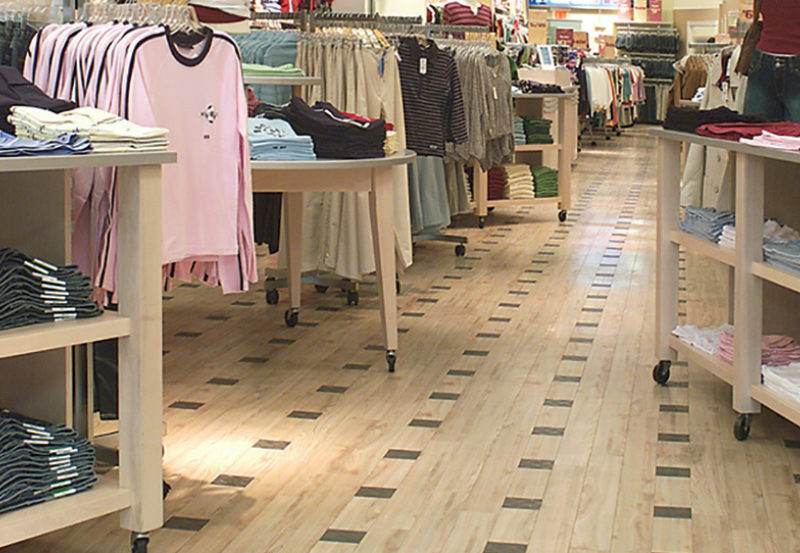 Real wood flooring for this historic retailer. 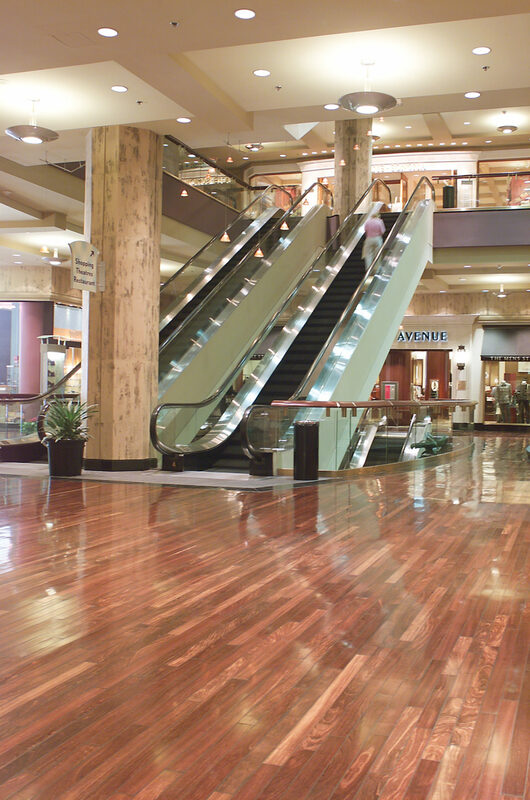 Mazza Gallerie — Washington D.C.
Hard wood standing up to the heavy use in this retail, dining and entertainment complex. 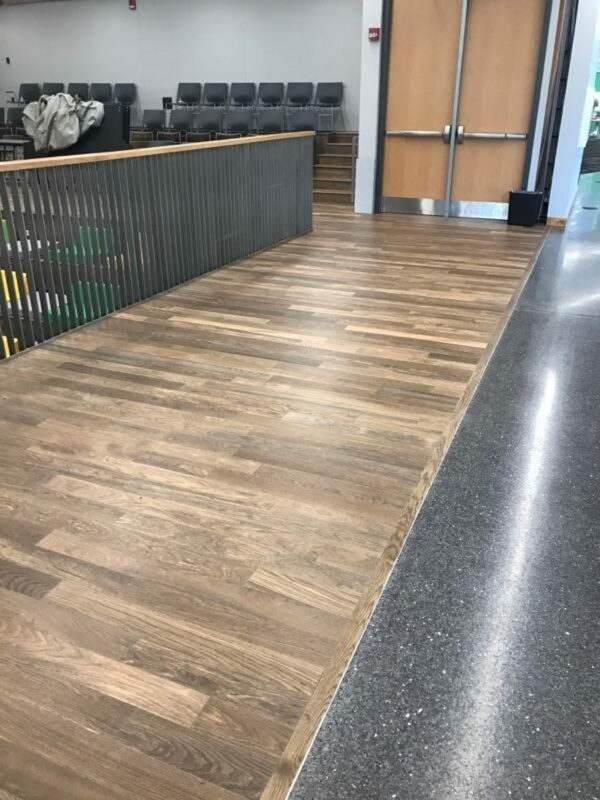 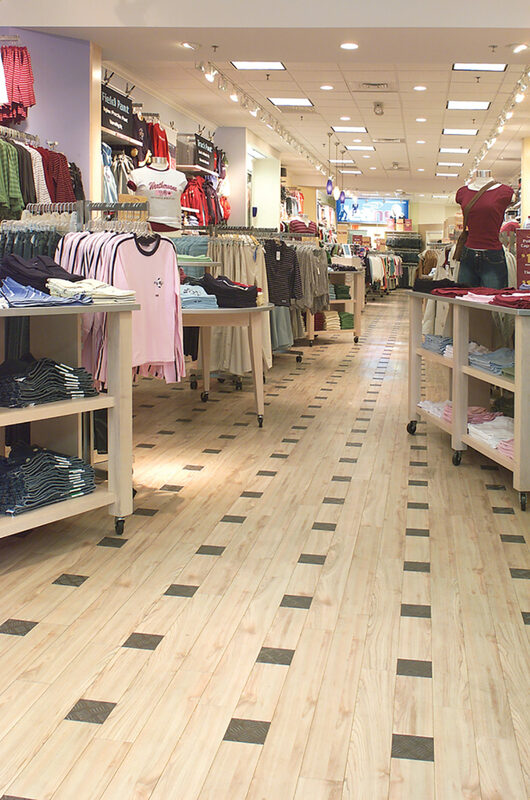 Custom Plainsawn White Oak is a brighter option for retail stores. 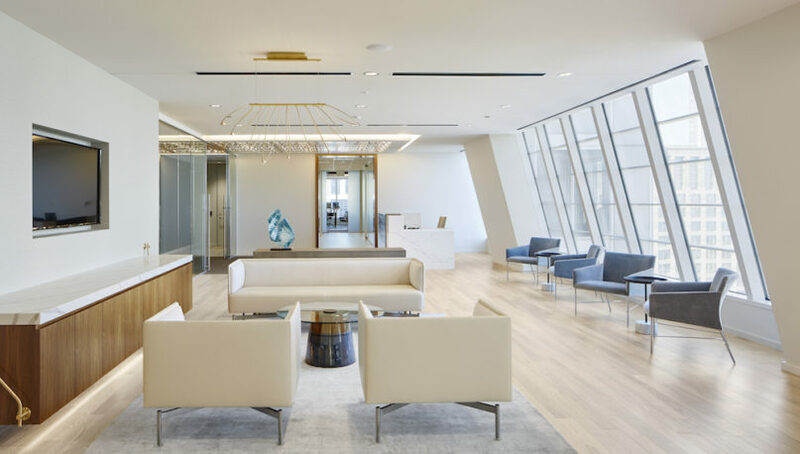 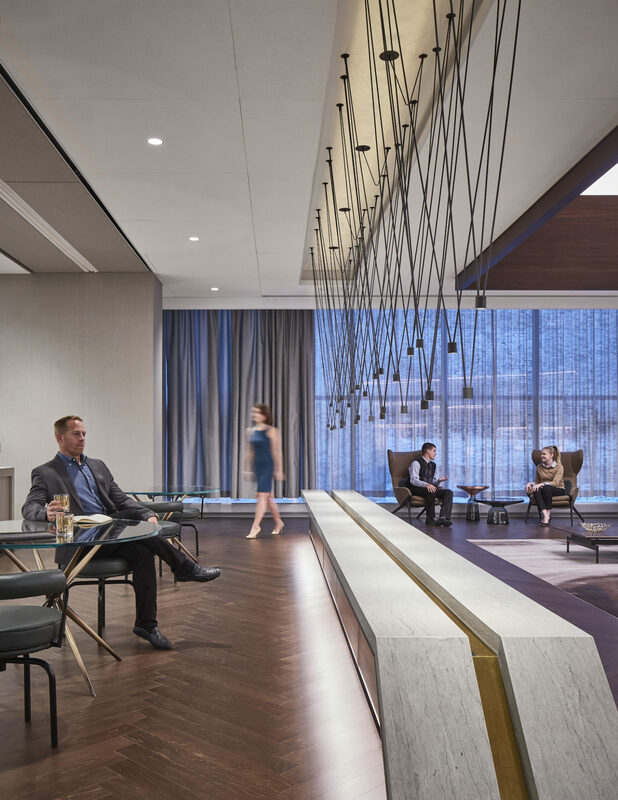 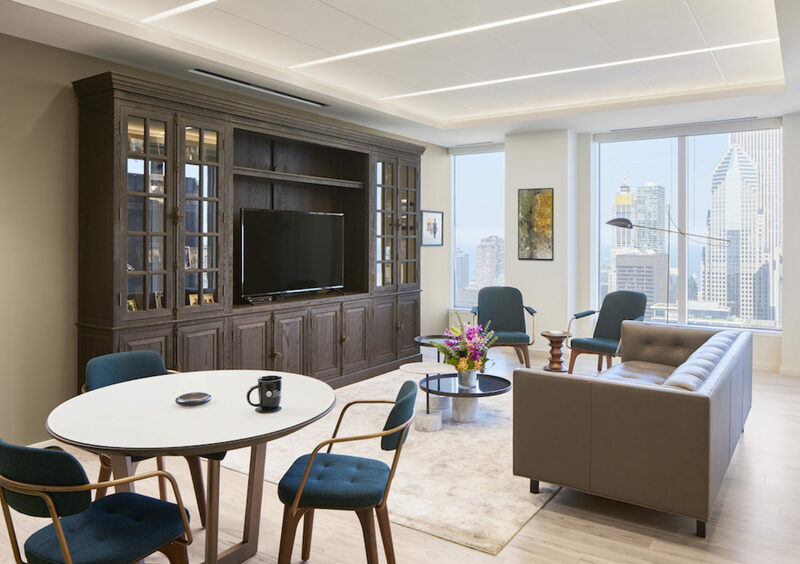 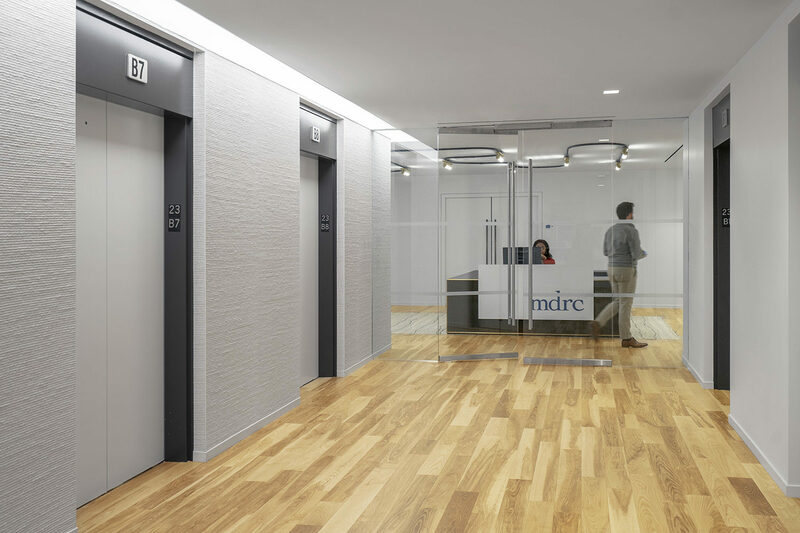 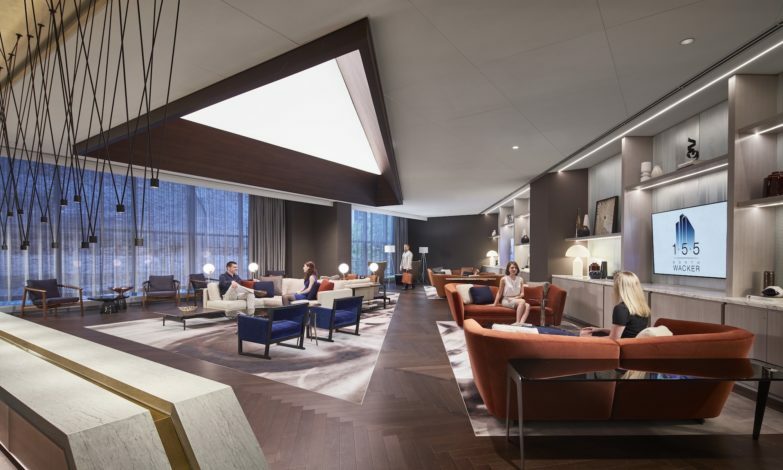 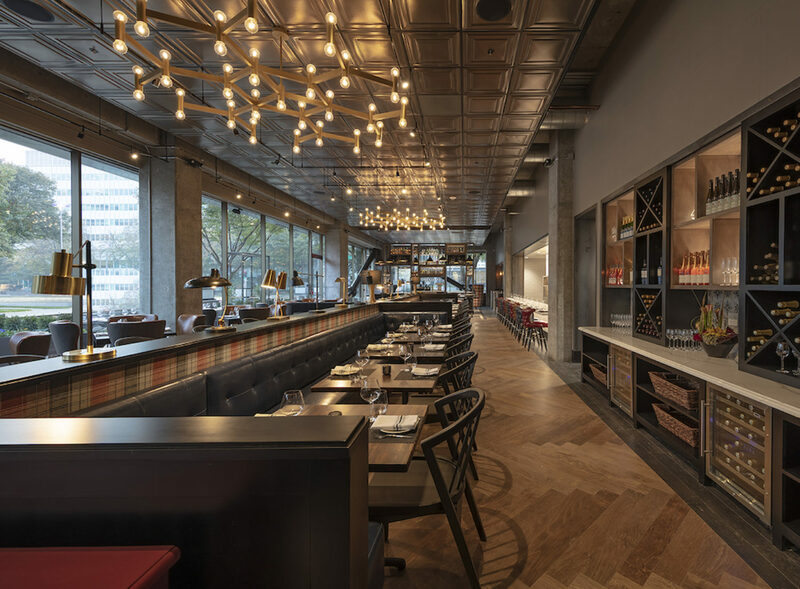 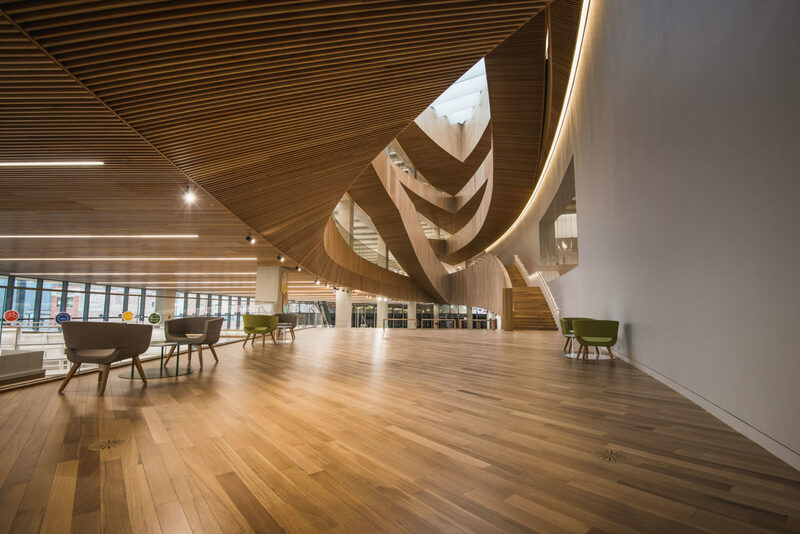 Designed by IA Interior Architects, this 46-story business and conference building showcase Maple Cider in a herringbone pattern. 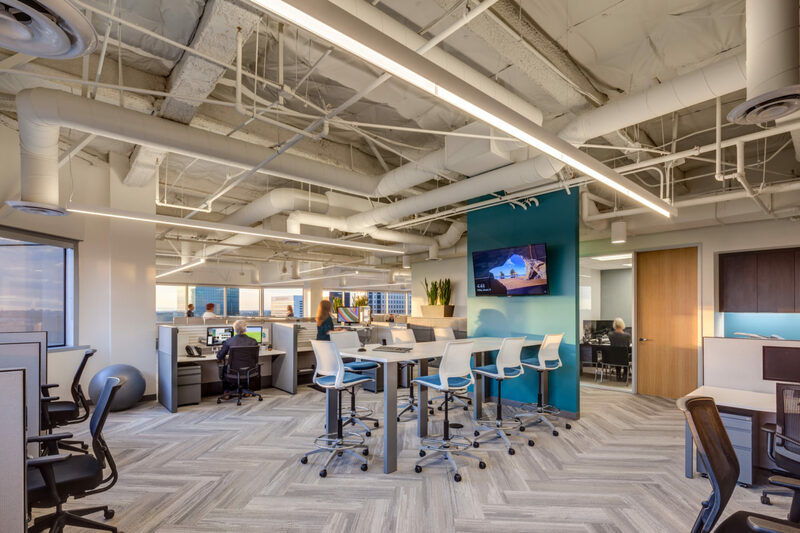 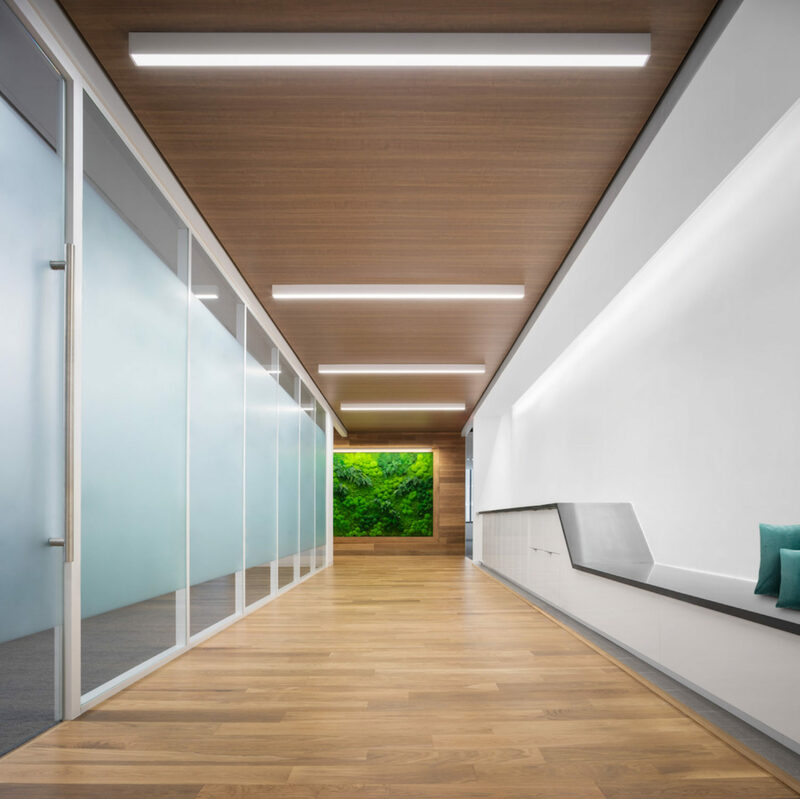 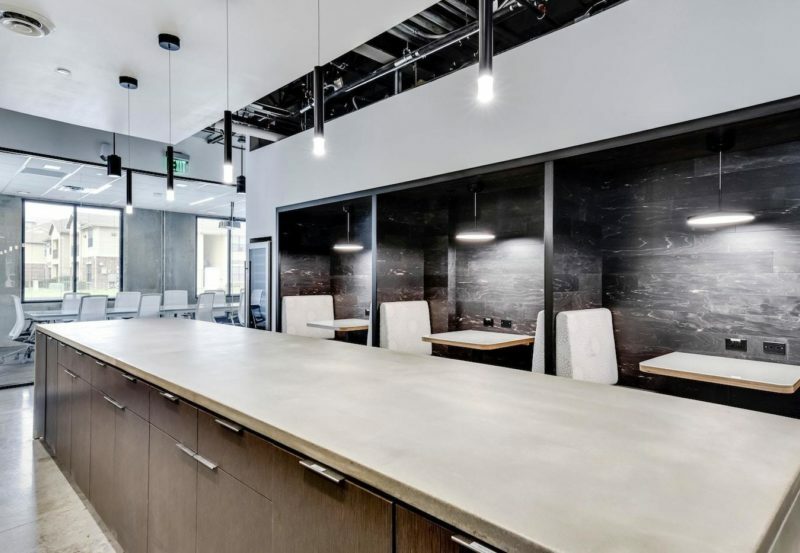 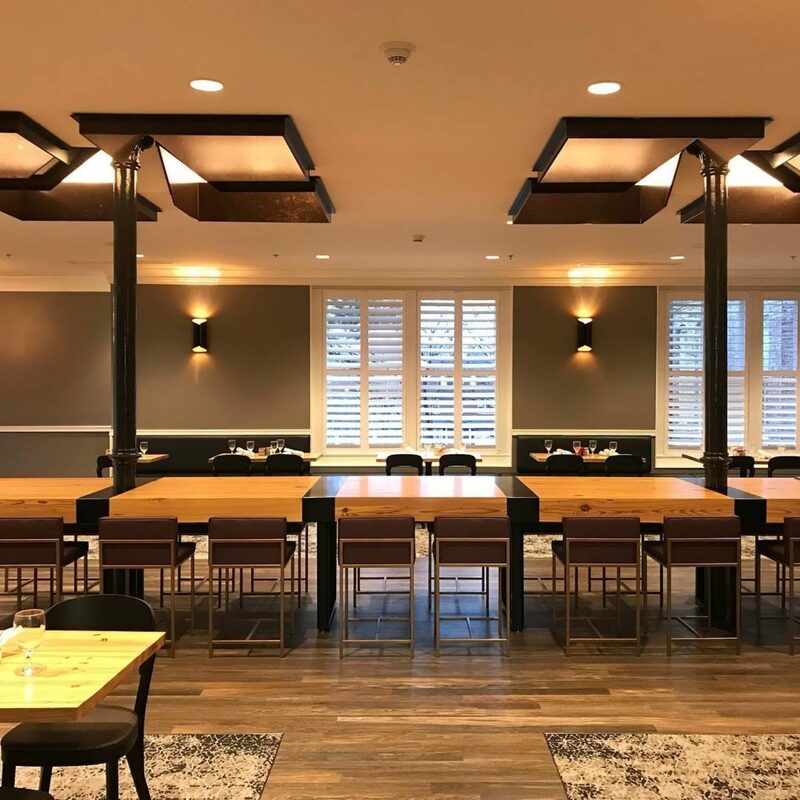 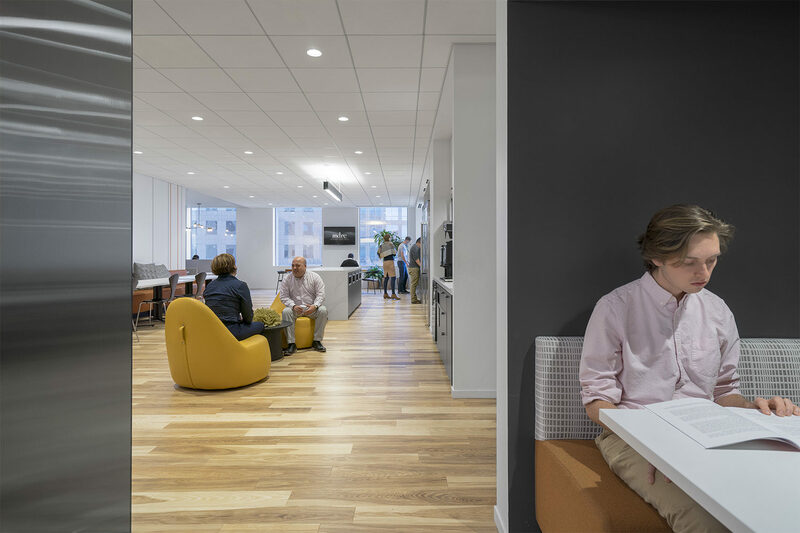 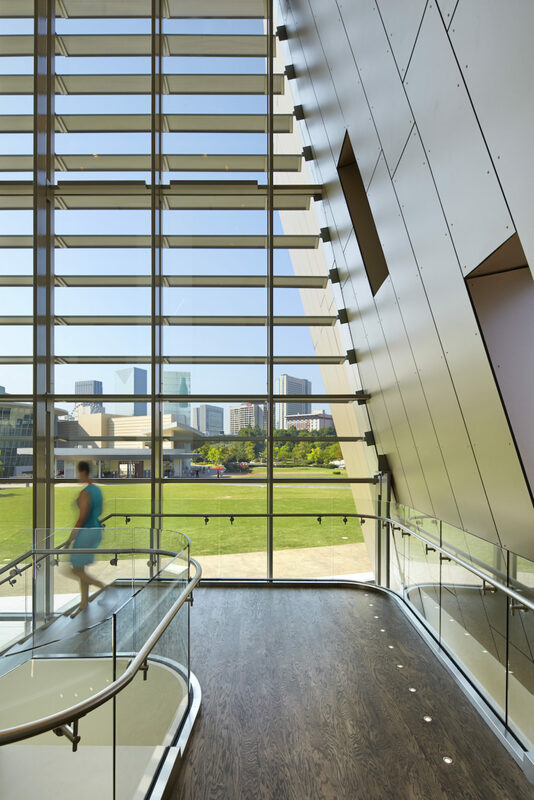 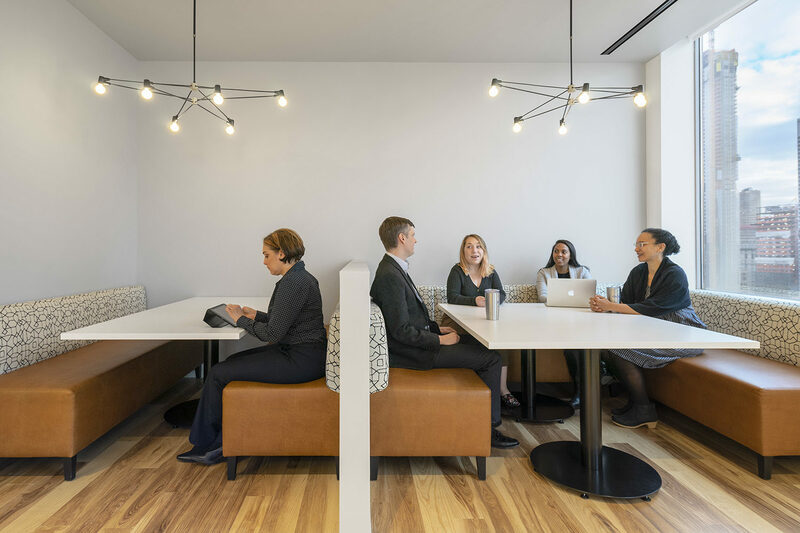 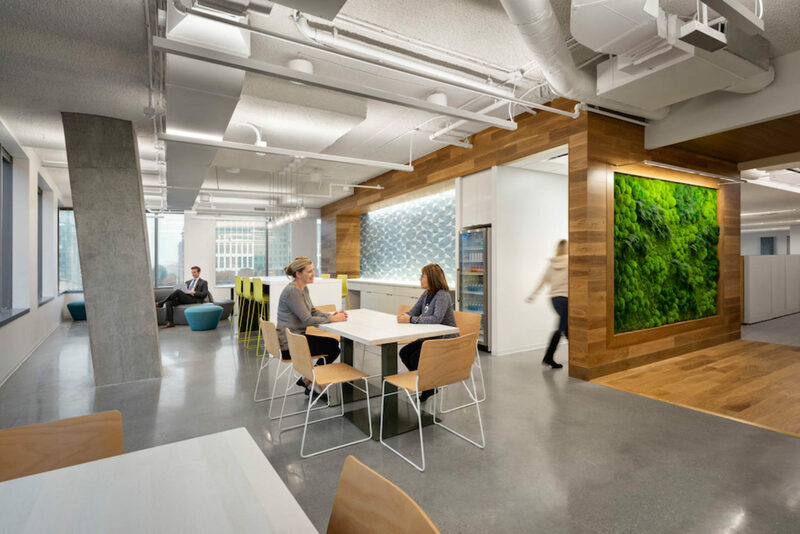 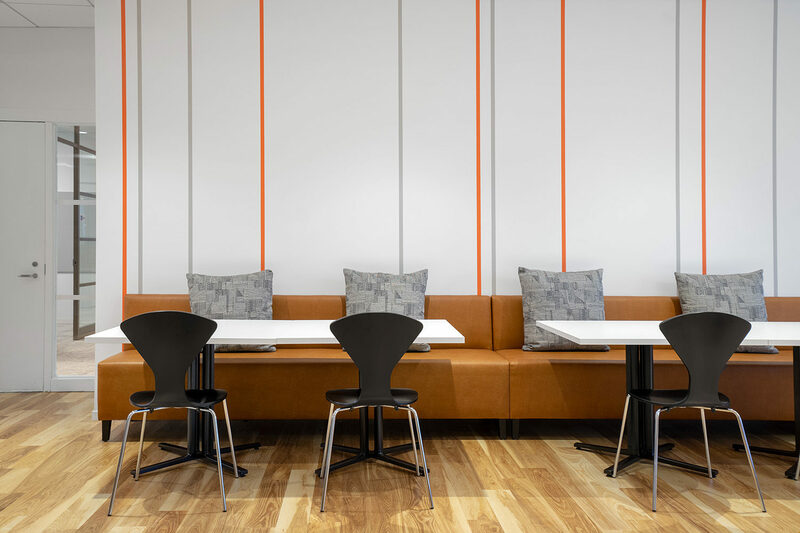 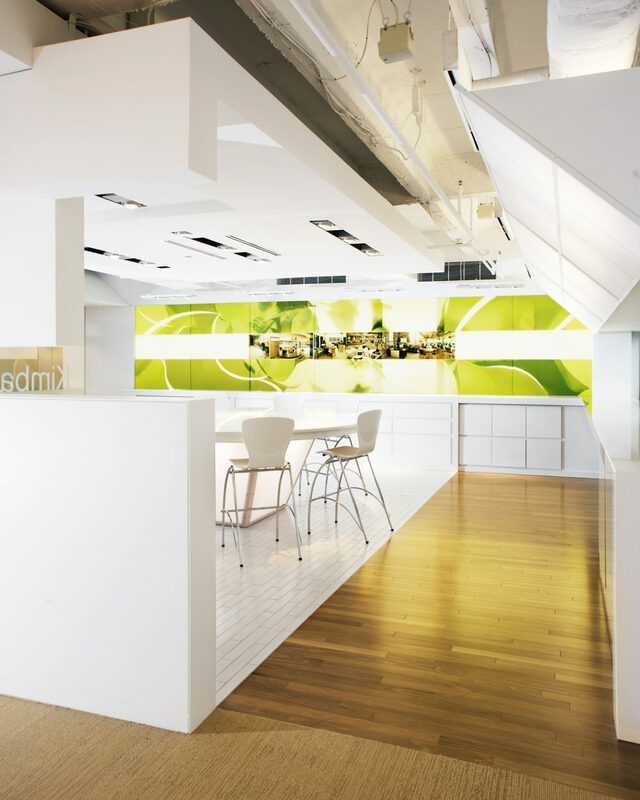 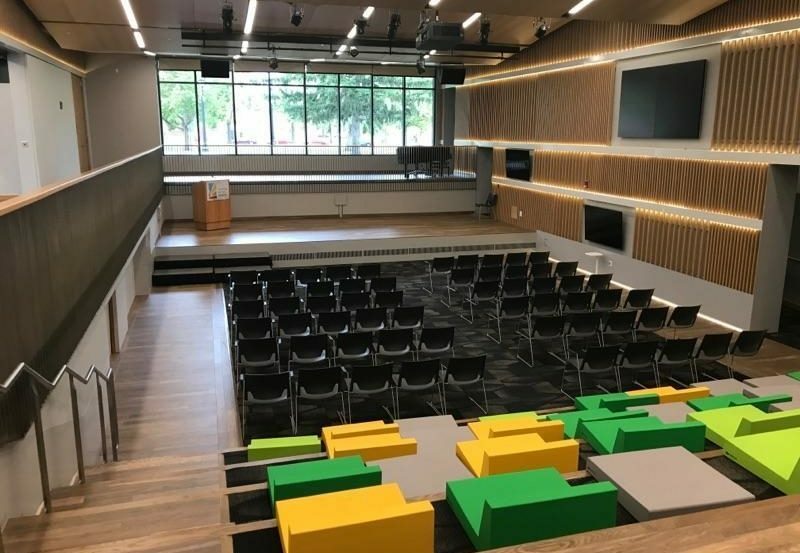 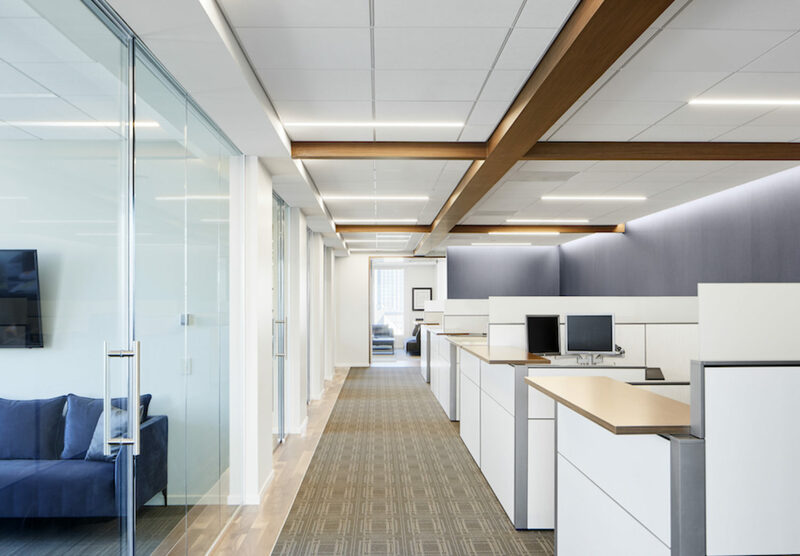 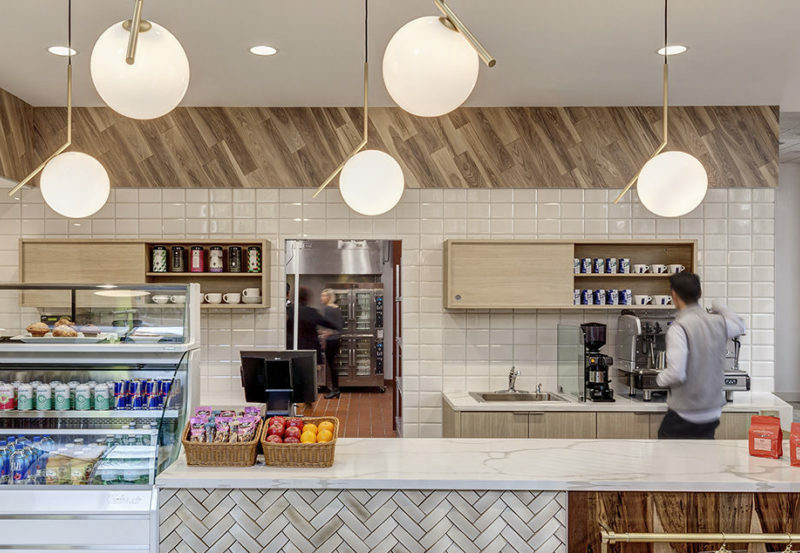 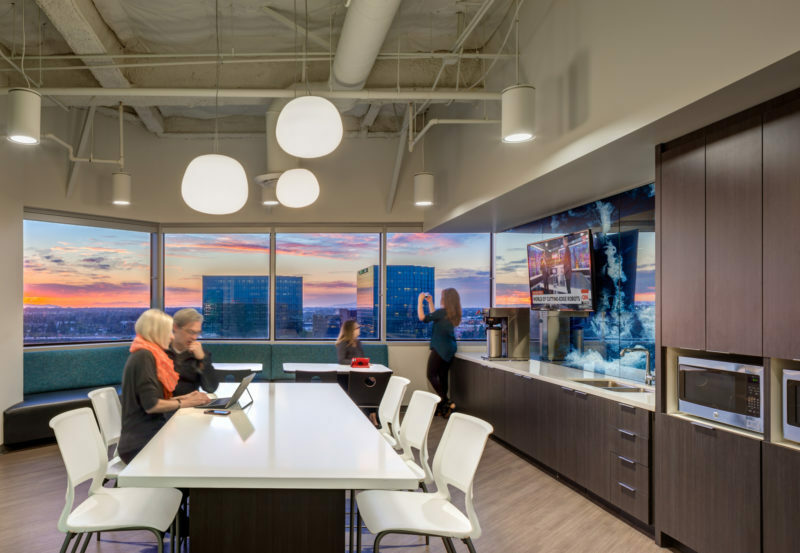 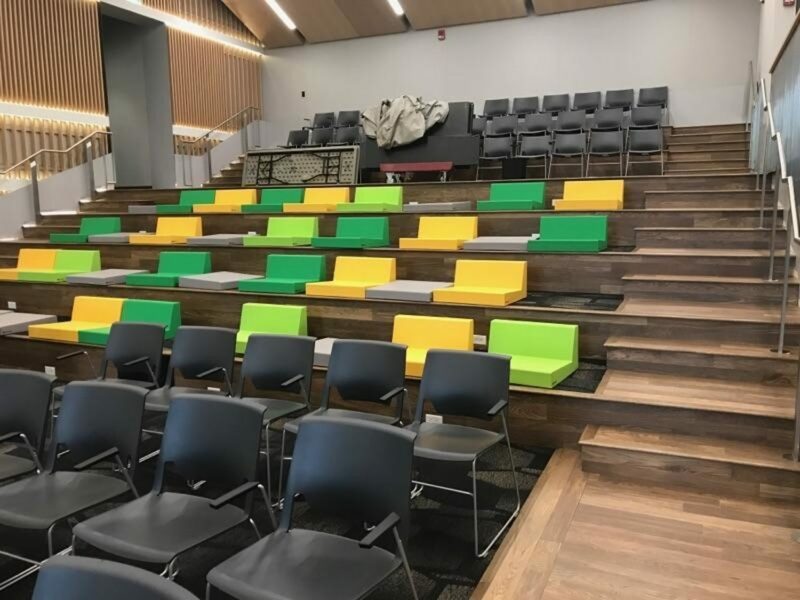 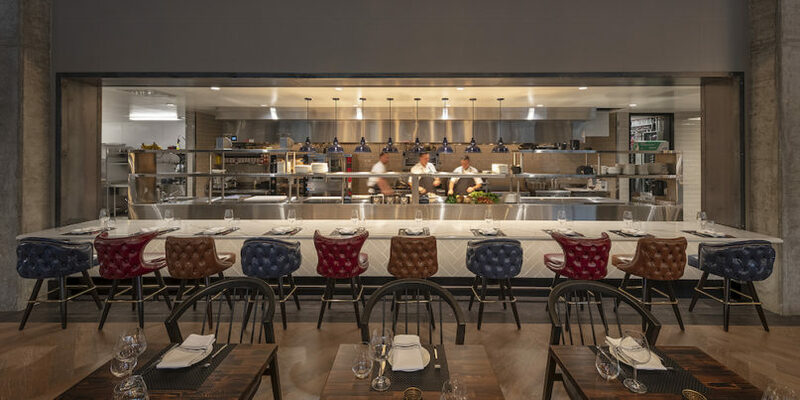 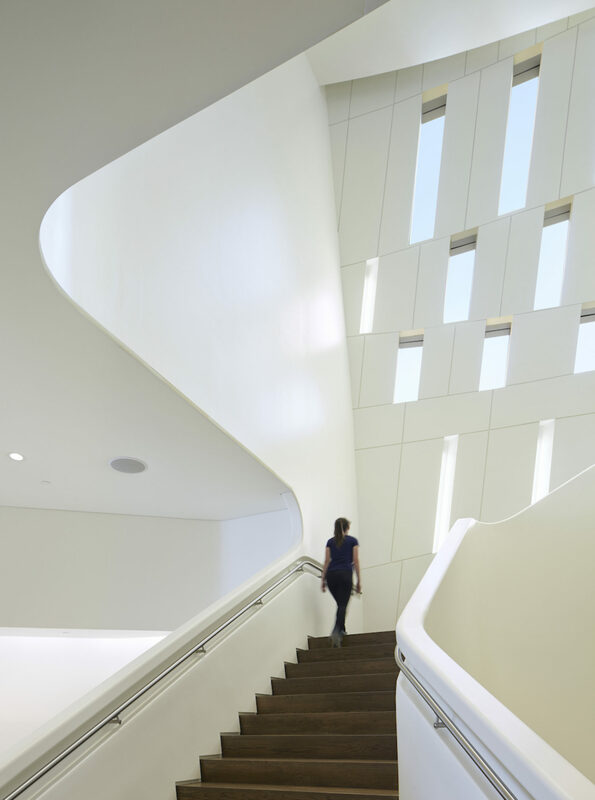 This educational non-profit gets a lesson from TPG Architecture when its new space gets a remodel with a mix organic elements, including Ash Natural. 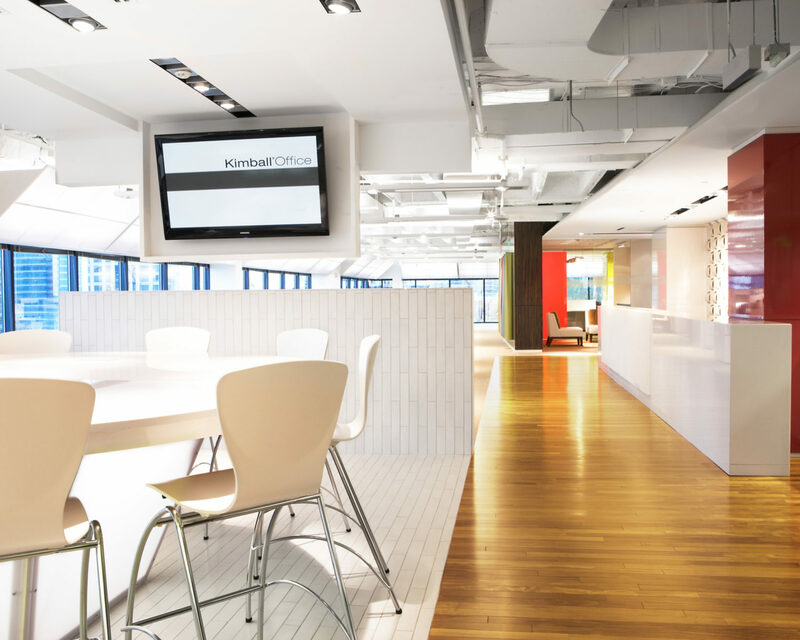 Ash Vanilla is a perfect fit for a professional feel in an office. 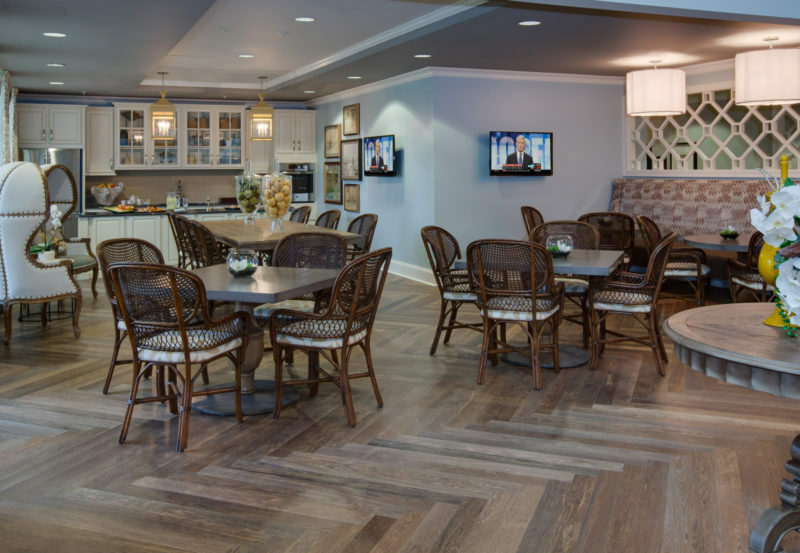 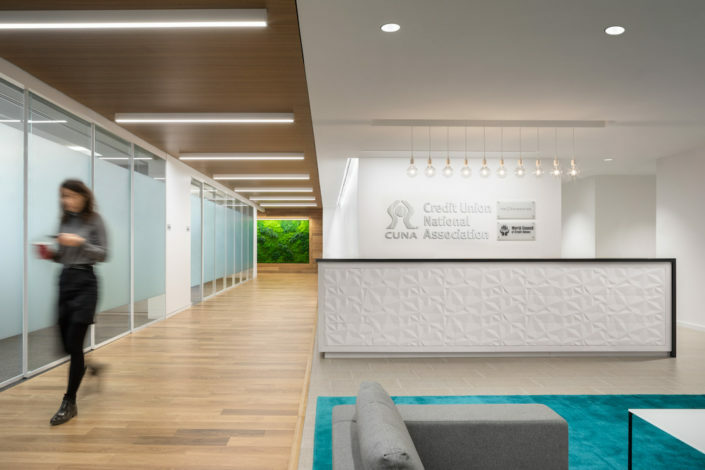 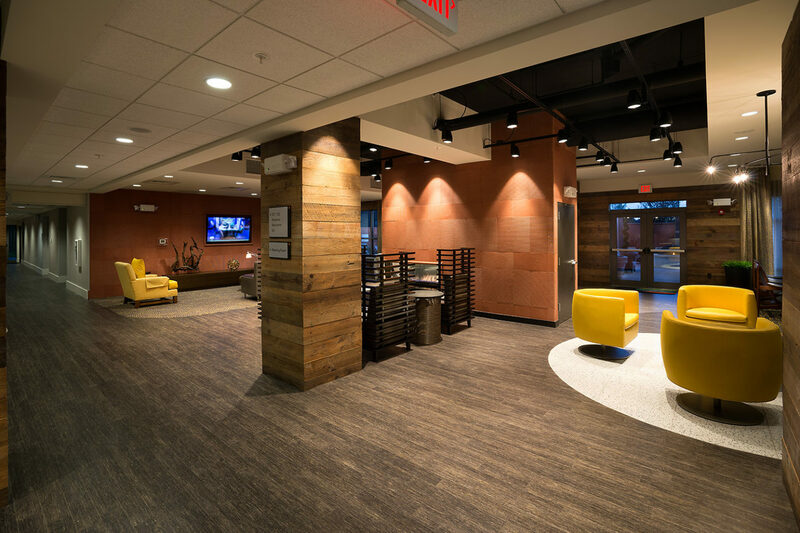 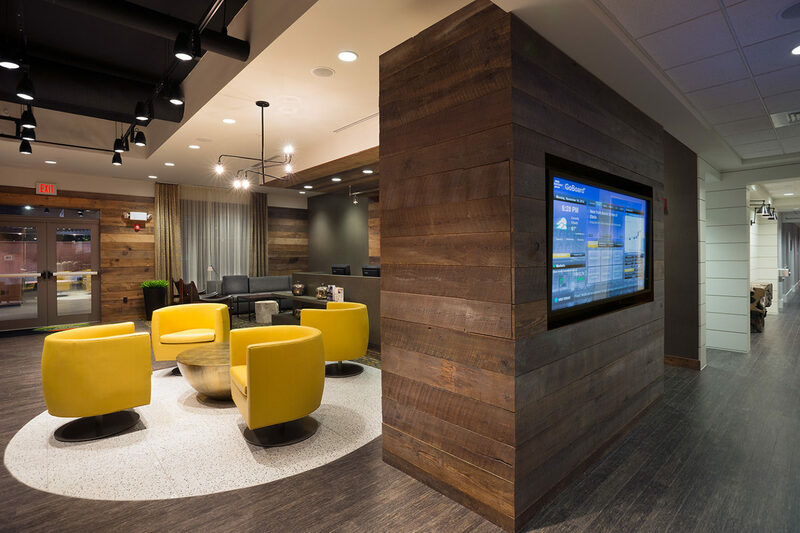 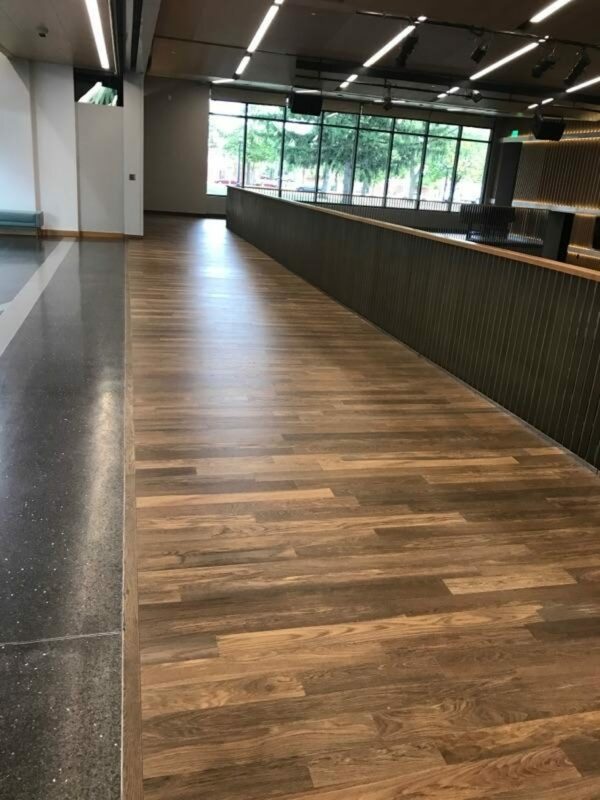 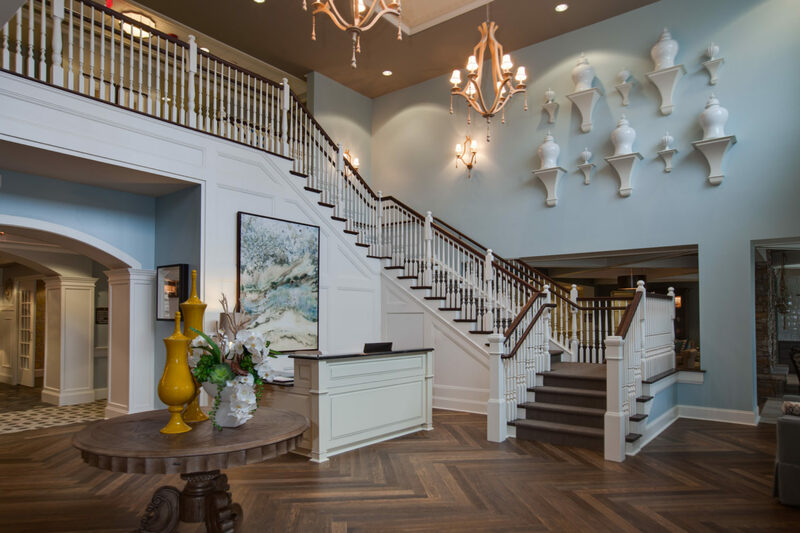 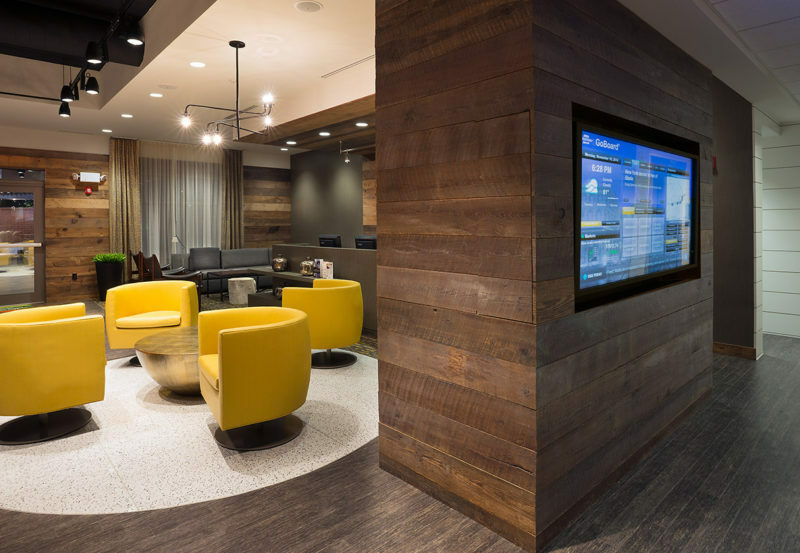 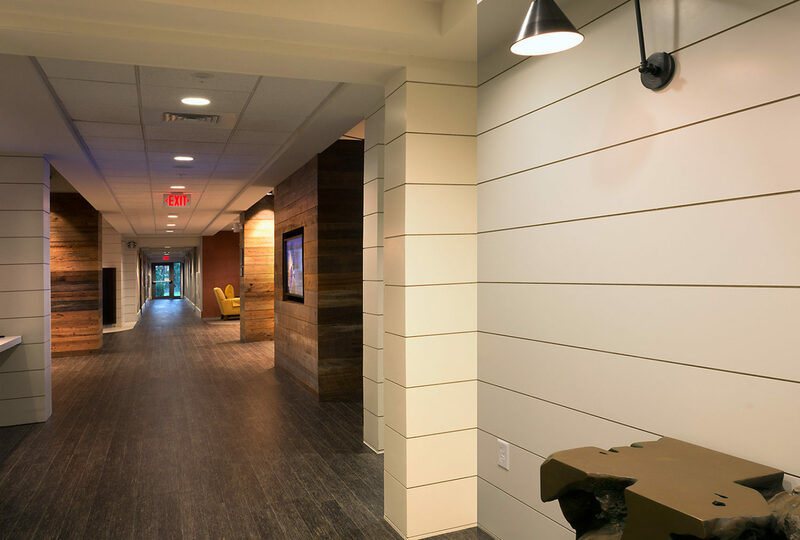 Plainsawn White Oak Natural at the Credit Union National Association adds a homey and professional feel. 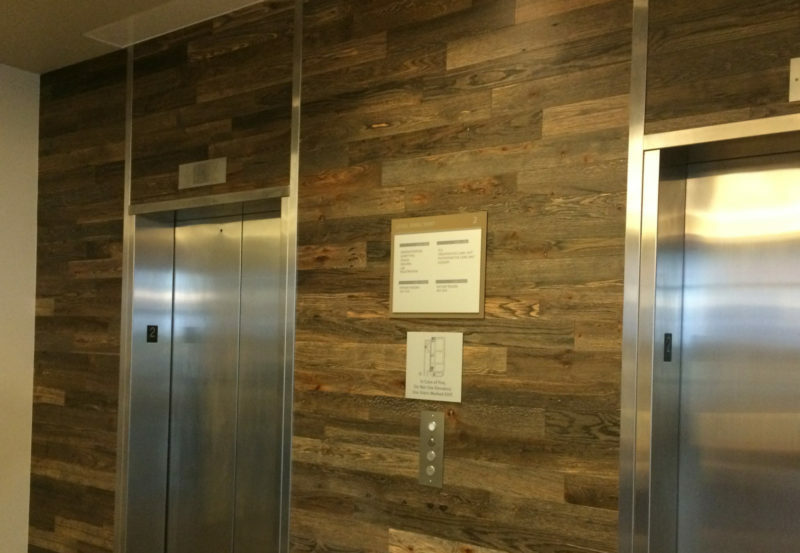 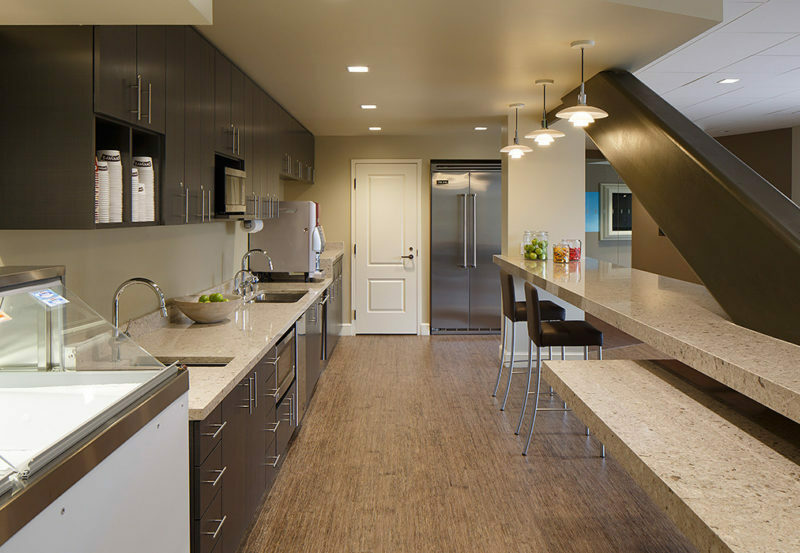 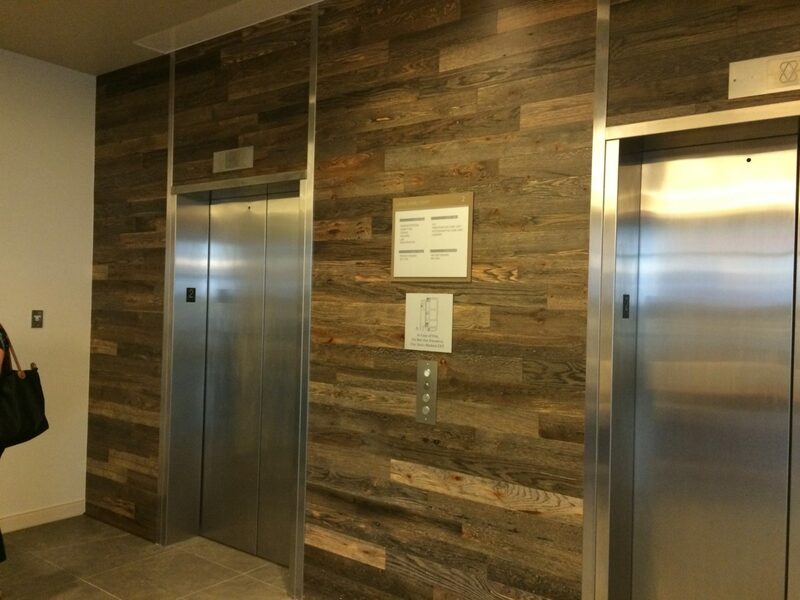 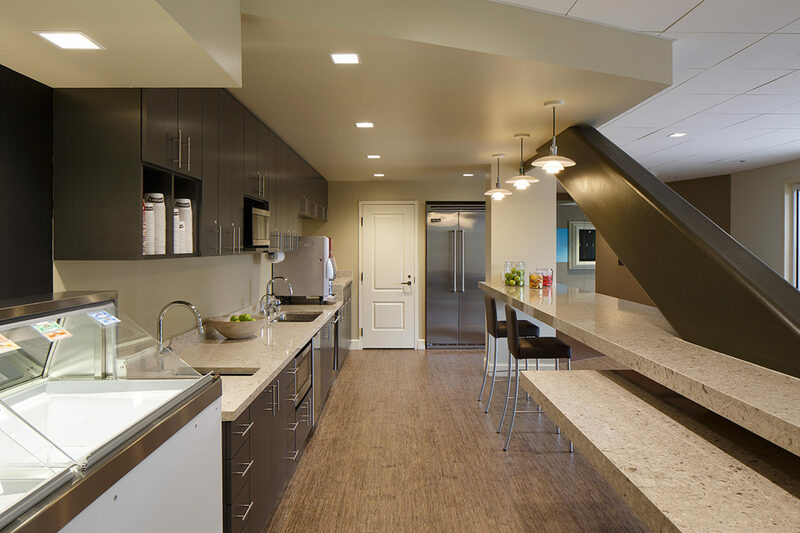 This office used Maple Ebony to create inspiring accent walls for their kitchen area. 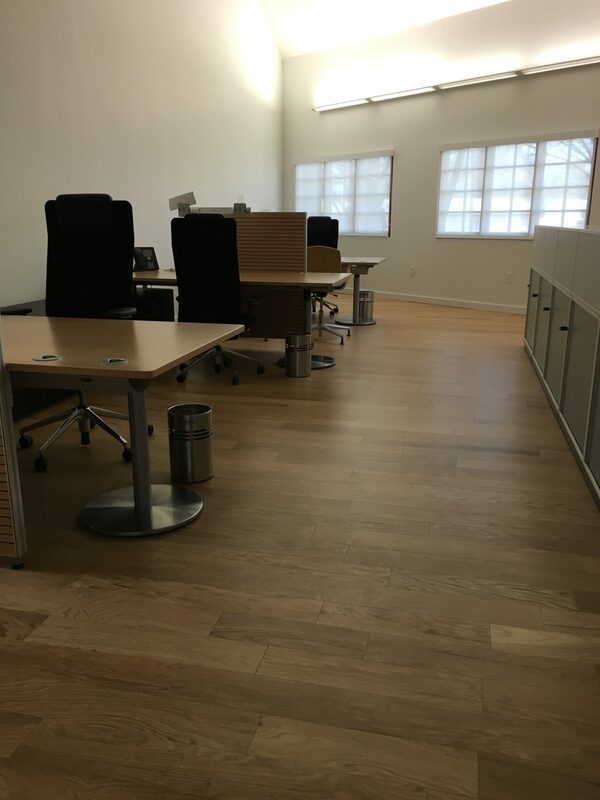 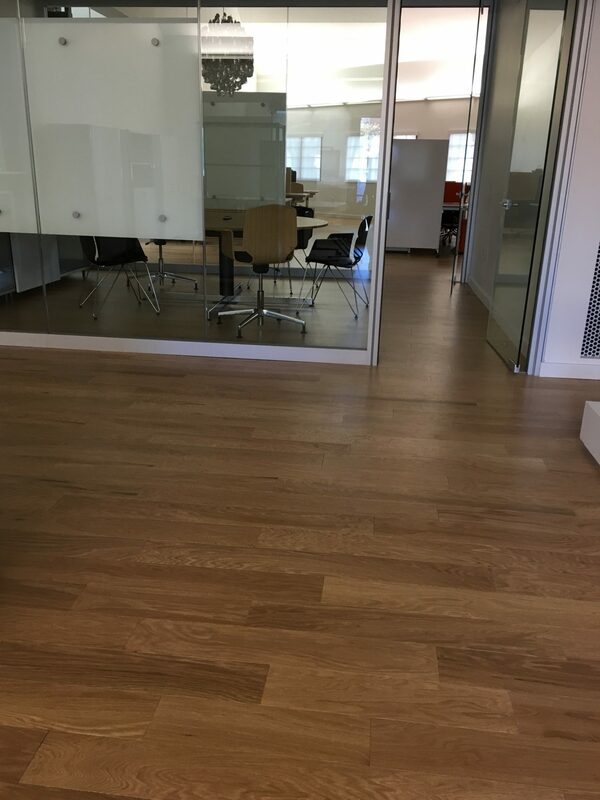 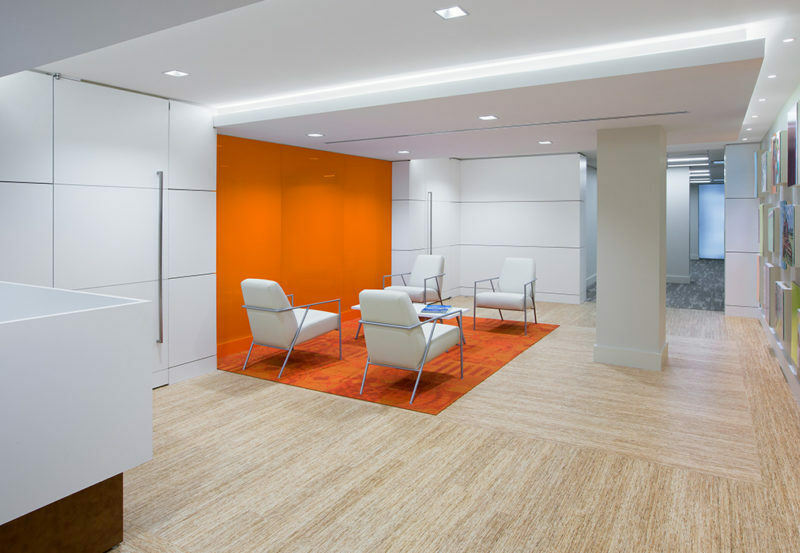 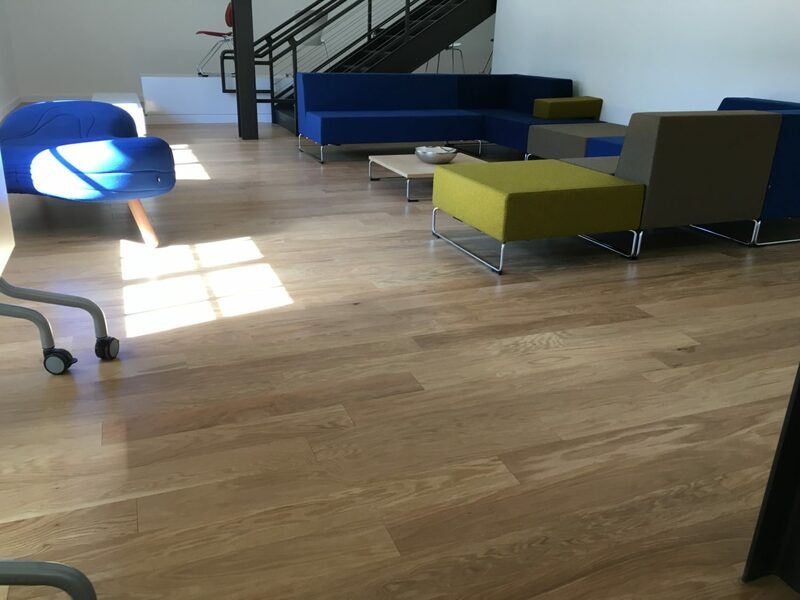 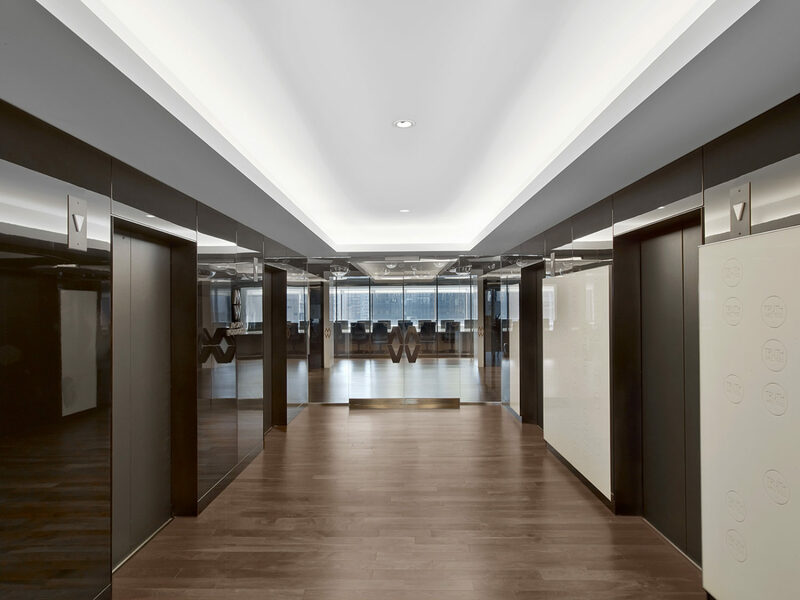 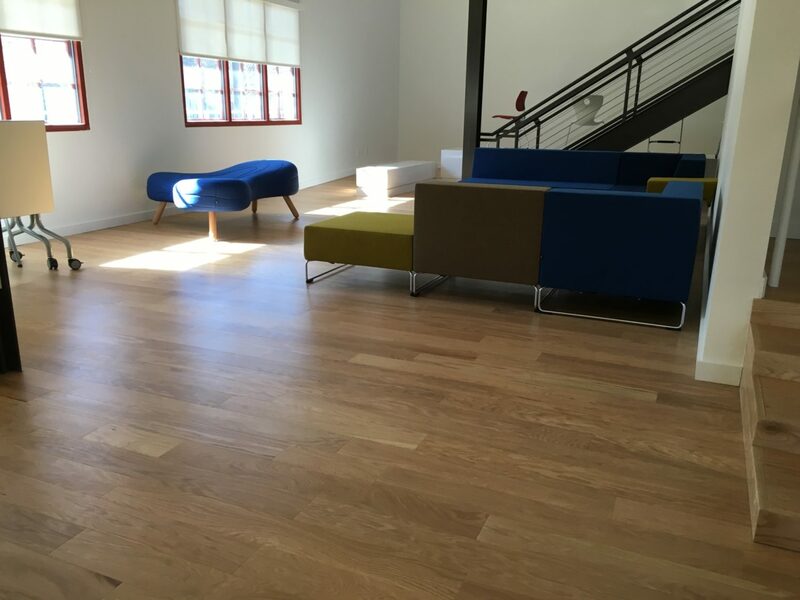 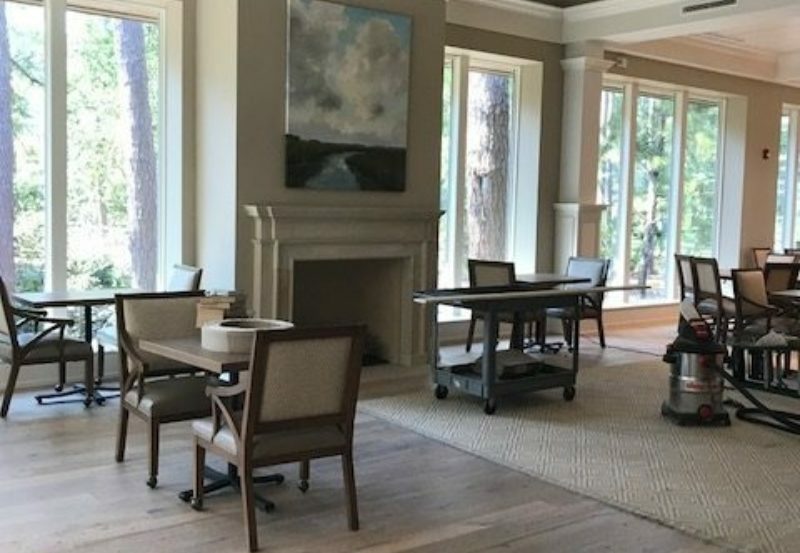 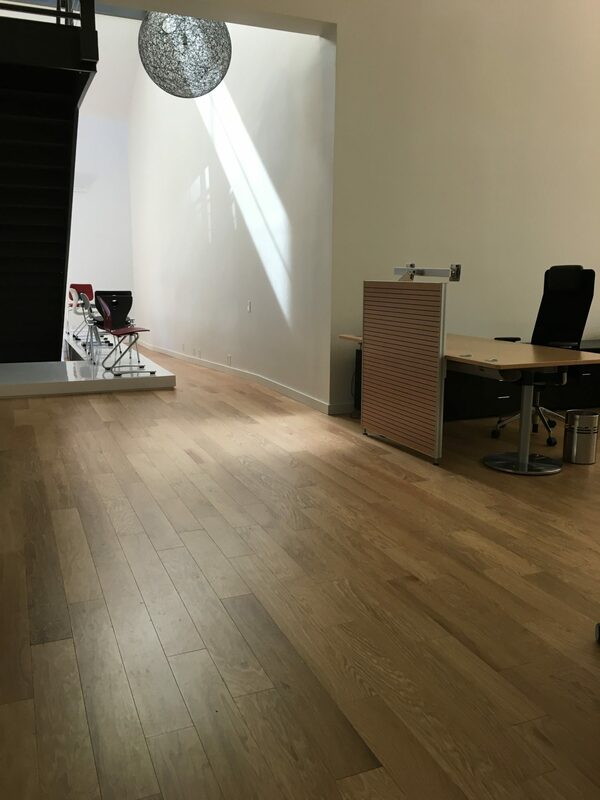 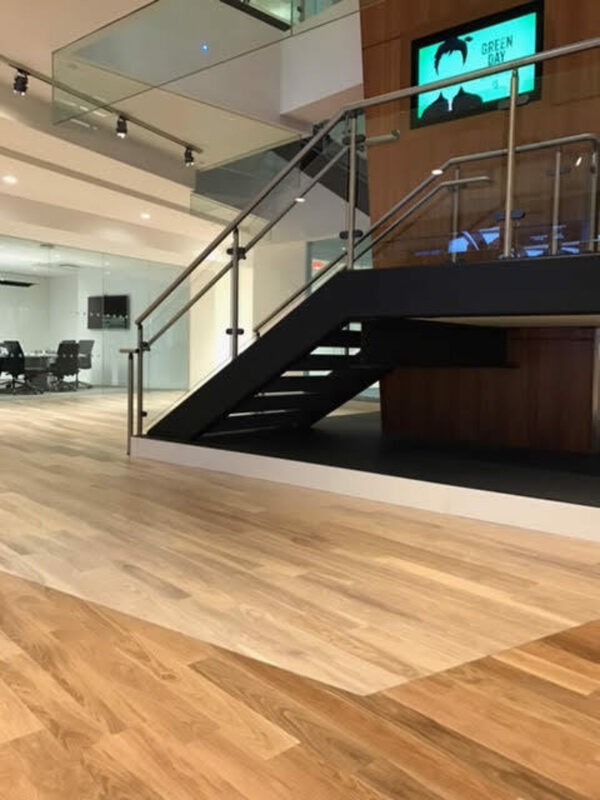 Our Maple flooring with a custom stain adds casual elegance to this corporate office. 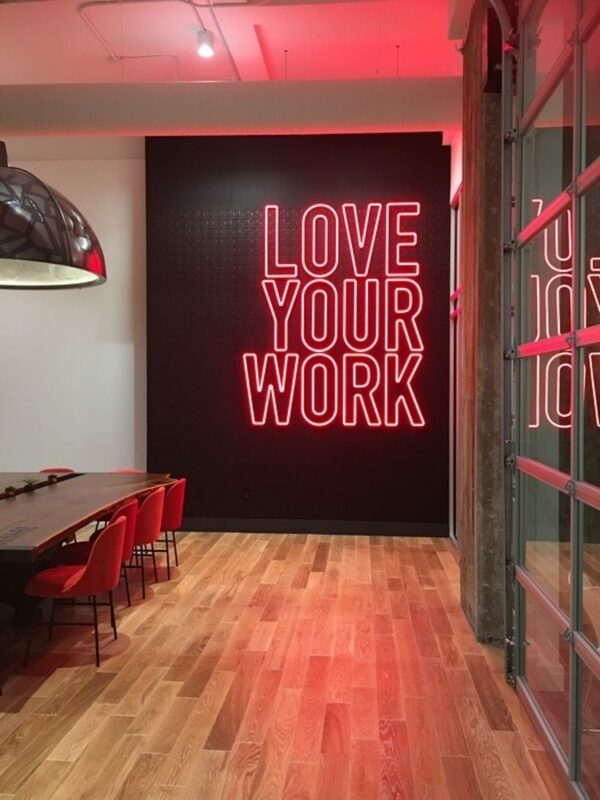 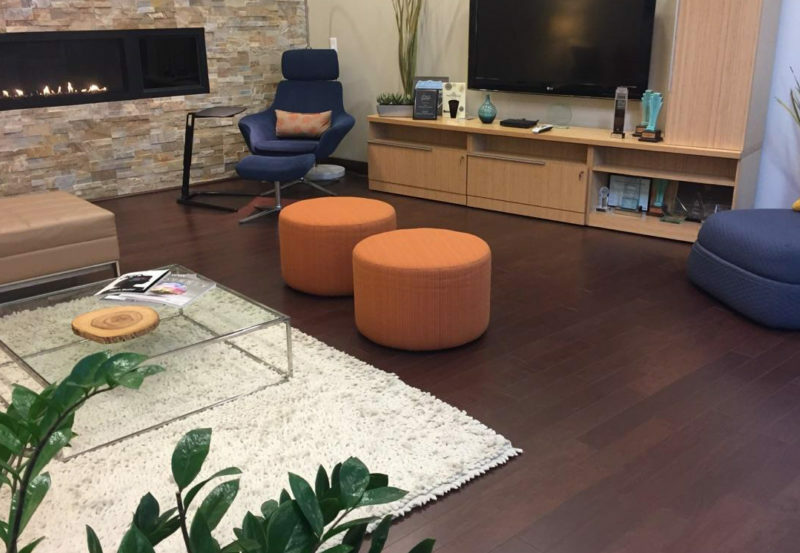 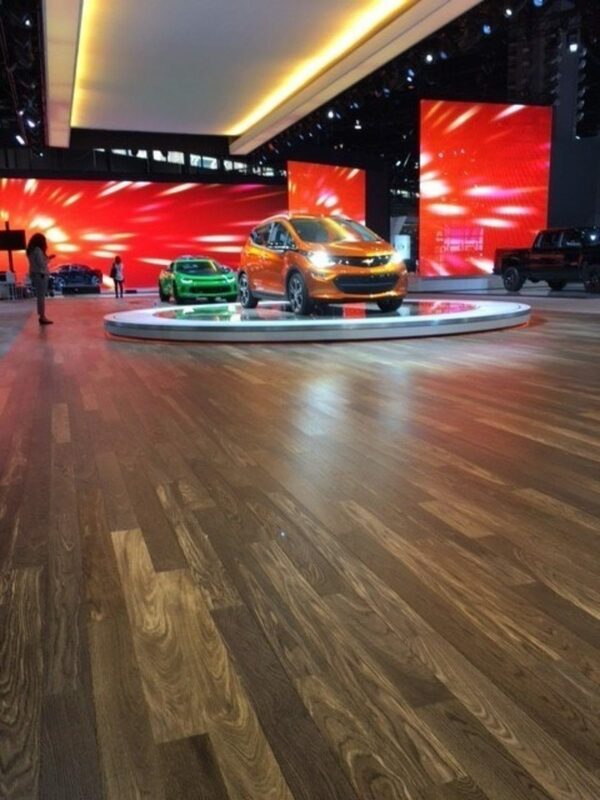 This award winning advertising firms steals the show with Walnut Steel Gray wood flooring. 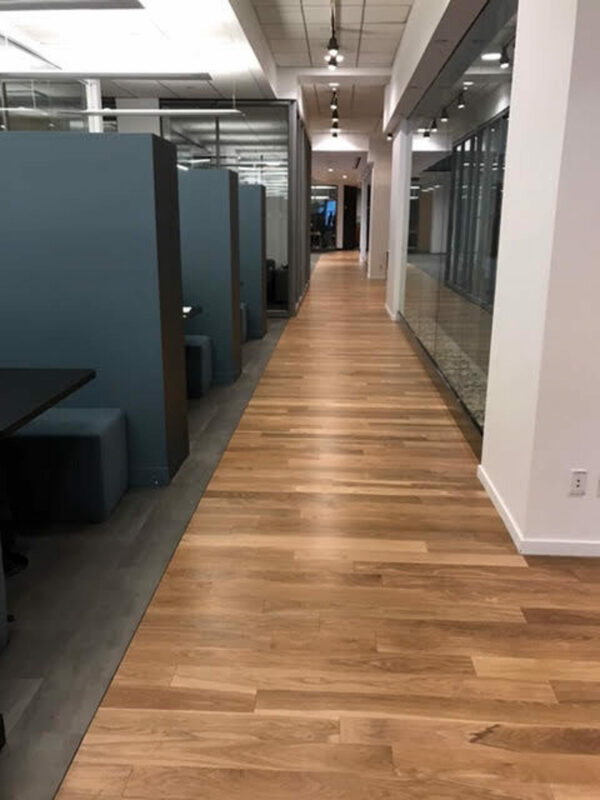 Our wood flooring throughout this skyscraper office. 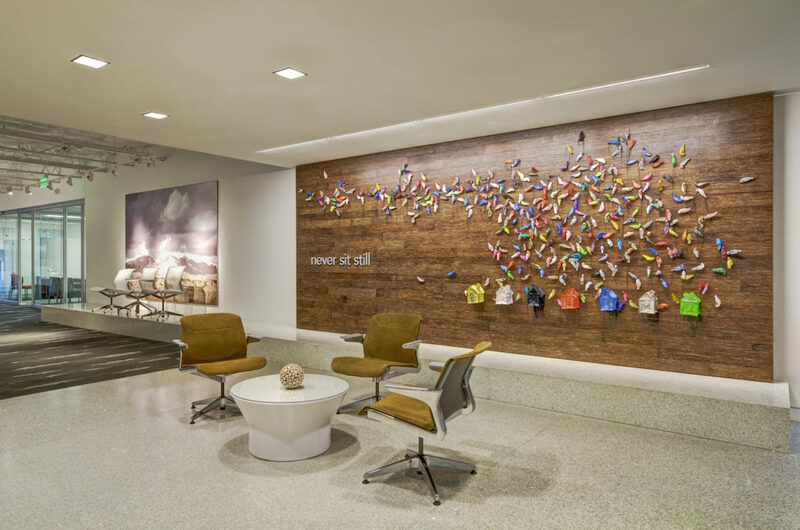 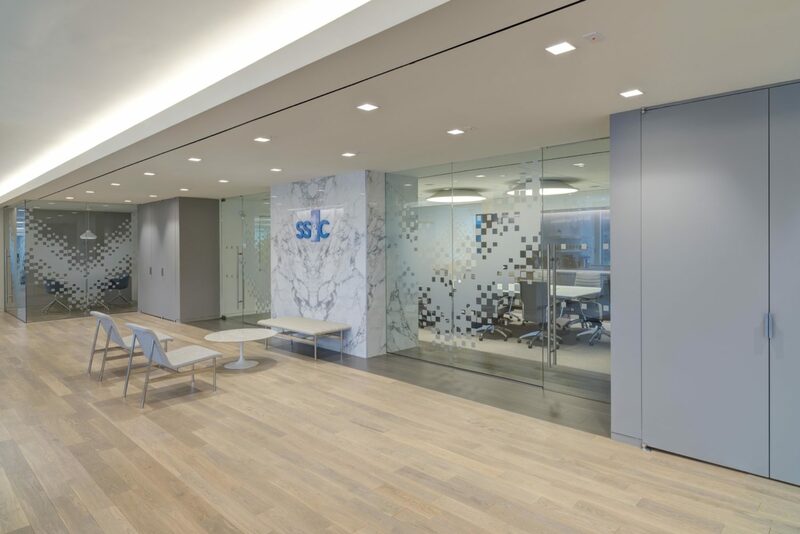 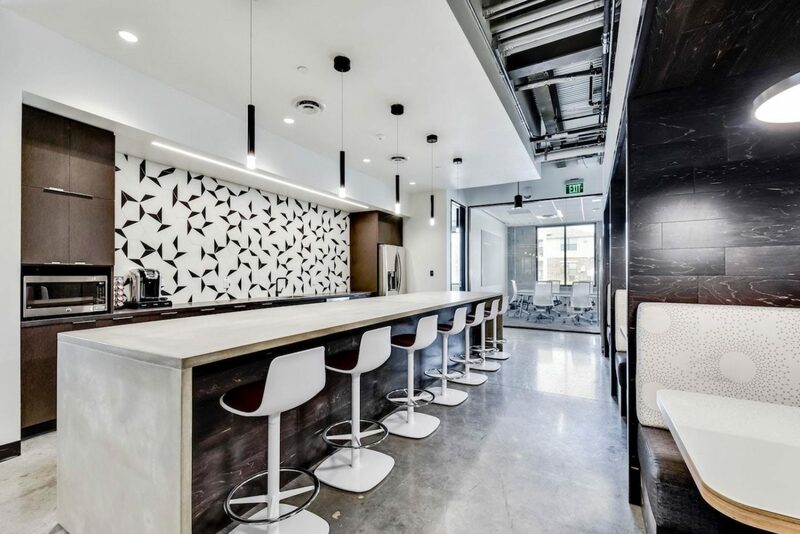 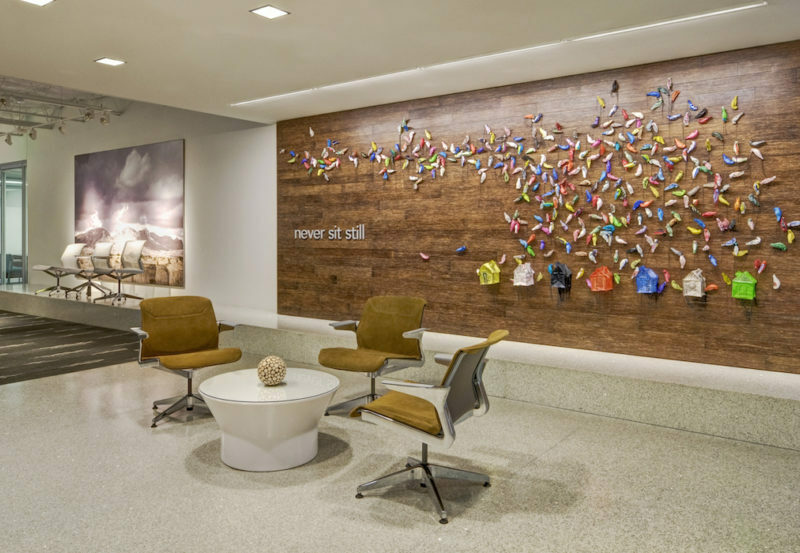 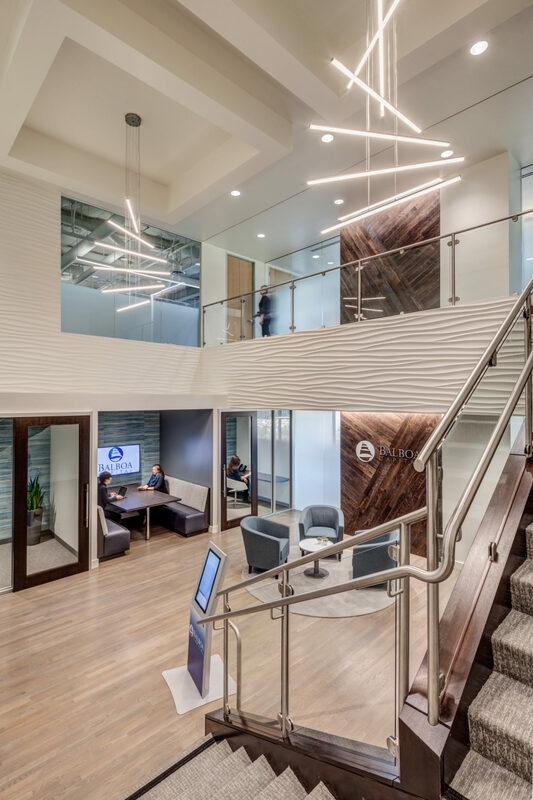 Our Plainsawn Oak Slightly Blue is prominently featured at Balboa Capital Corporate Headquarters in Costa Mesa, CA. 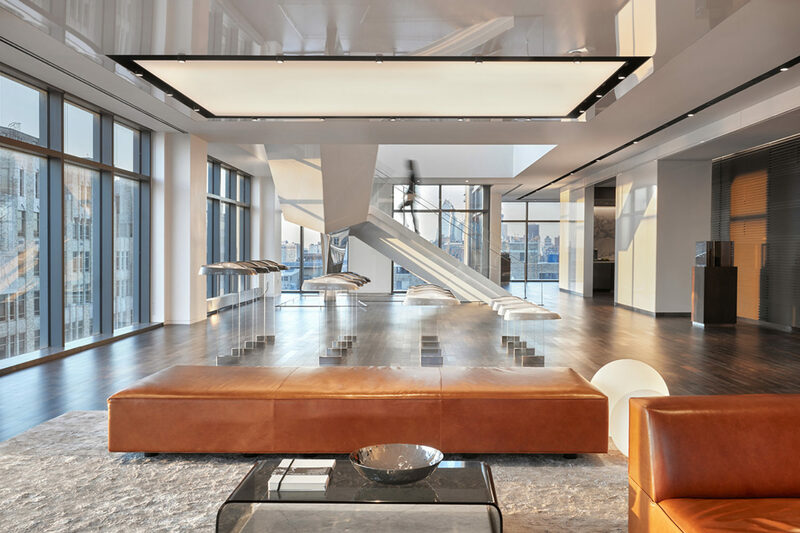 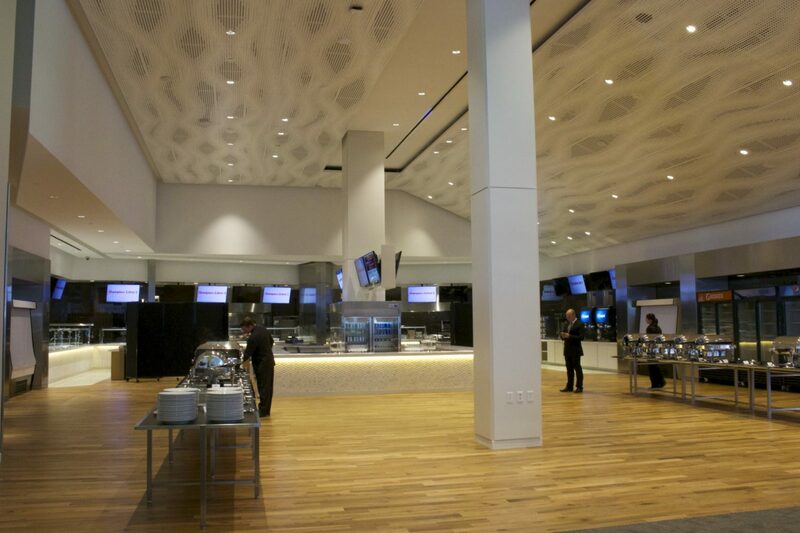 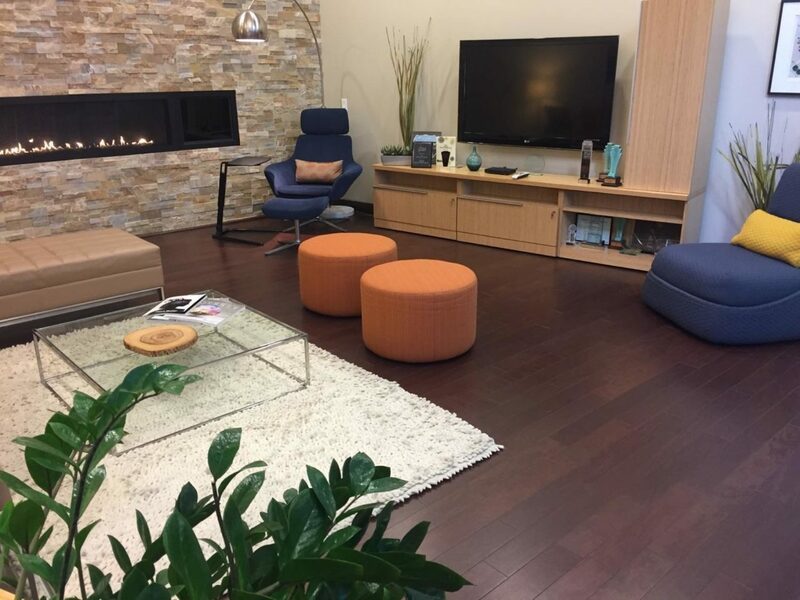 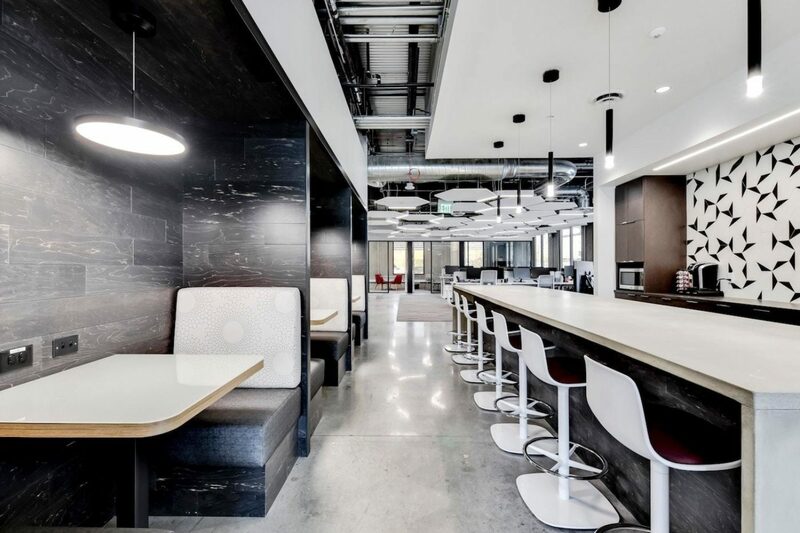 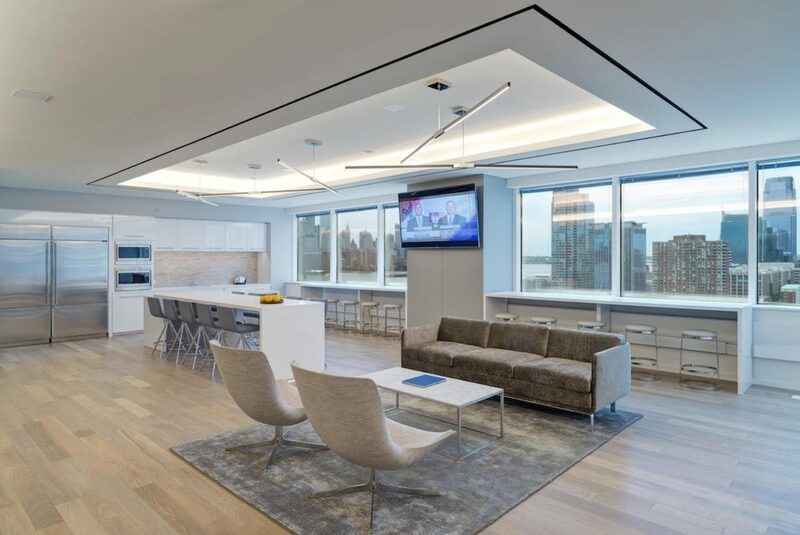 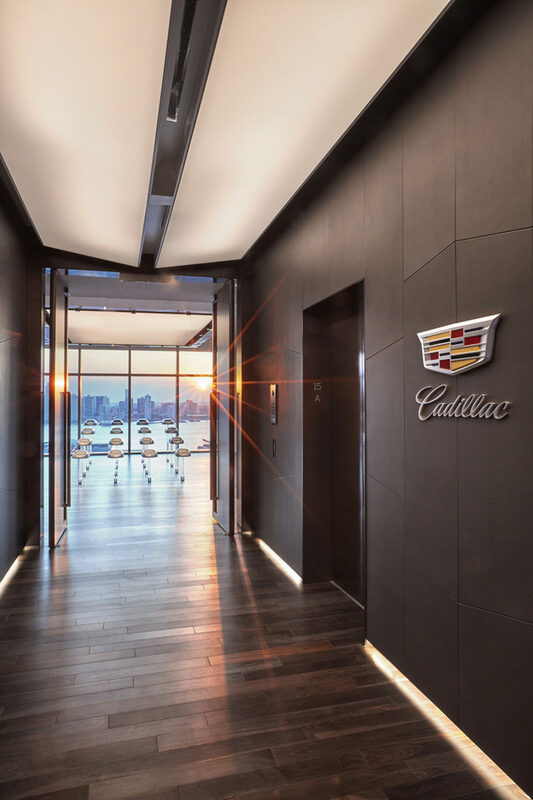 Cadillac uses our Walnut Steel Gray flooring in their company headquarters. 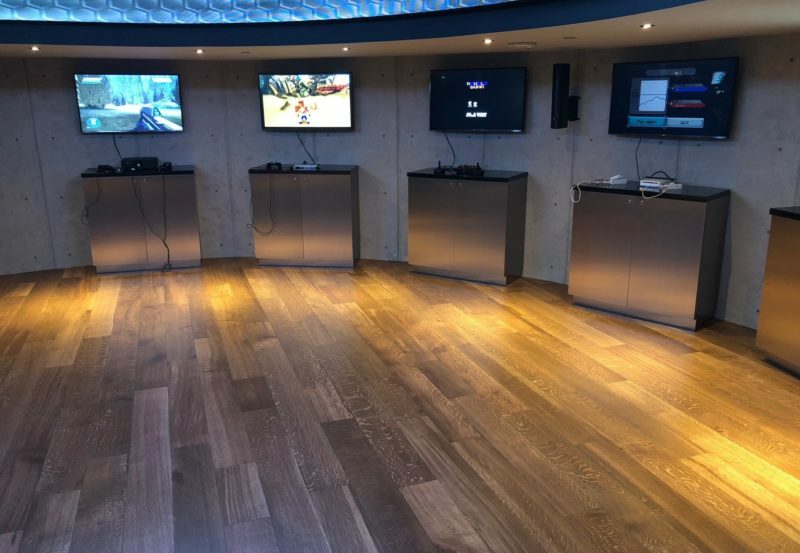 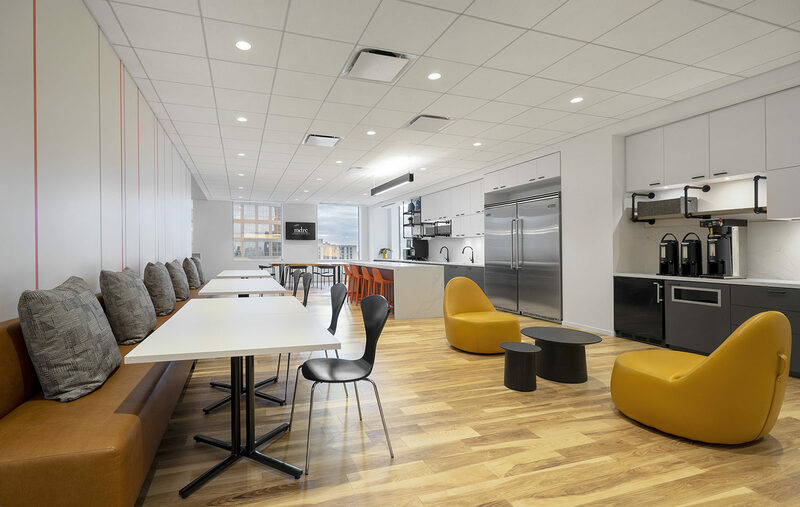 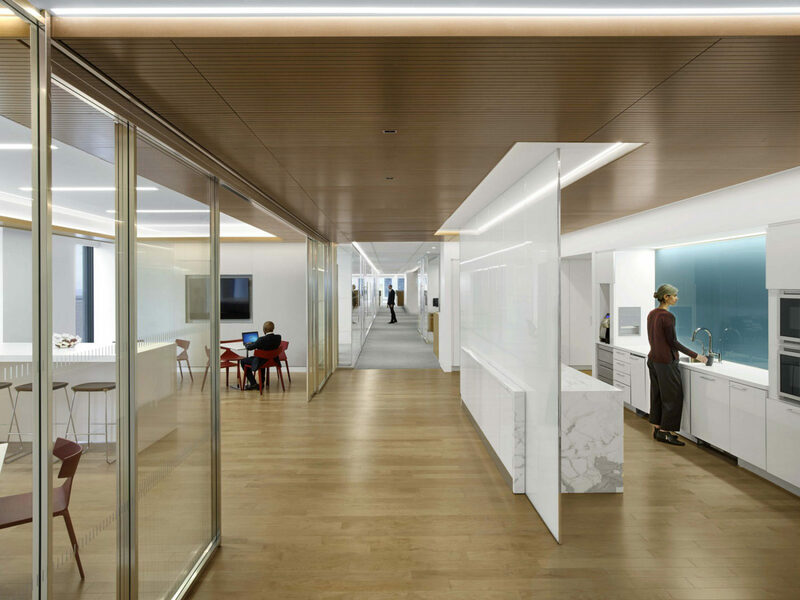 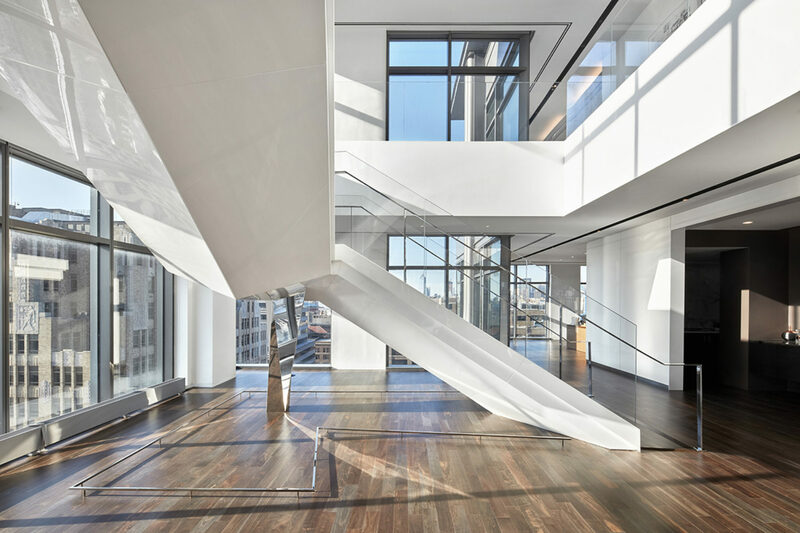 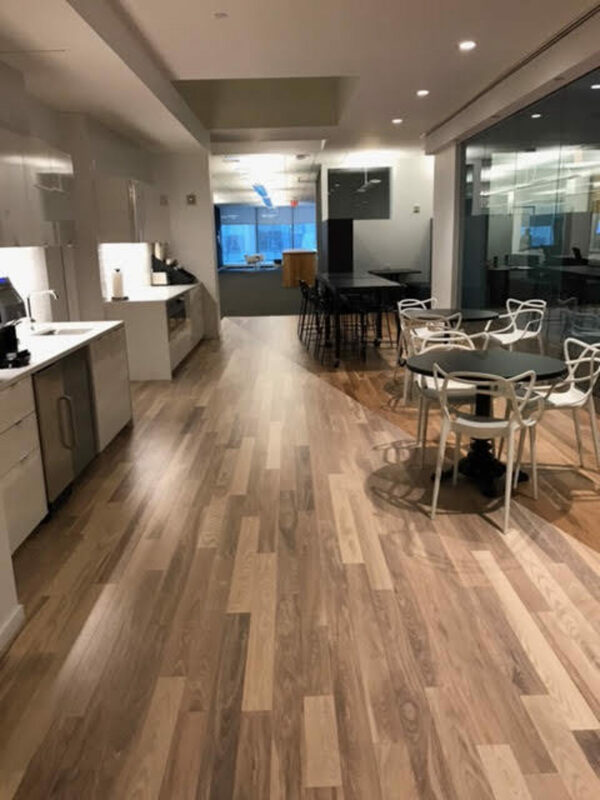 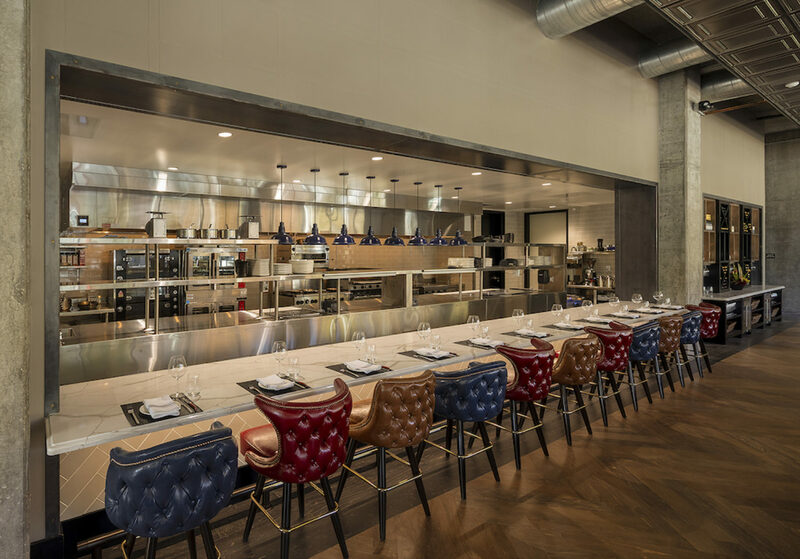 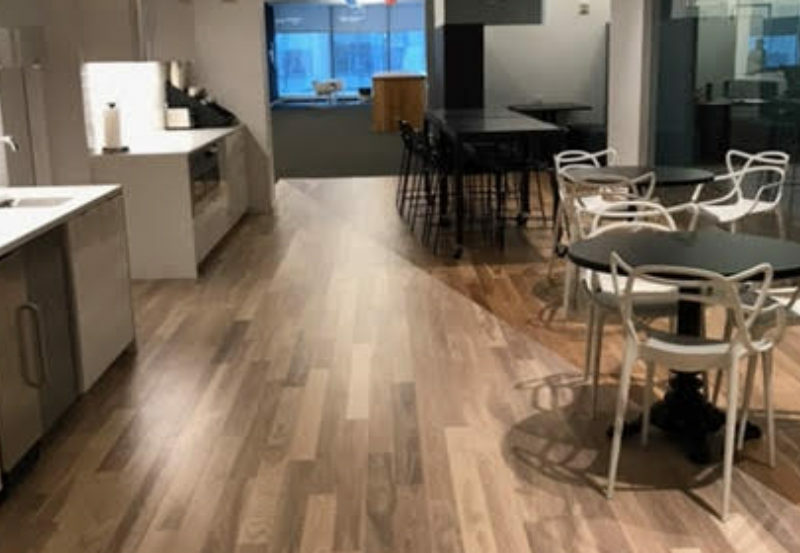 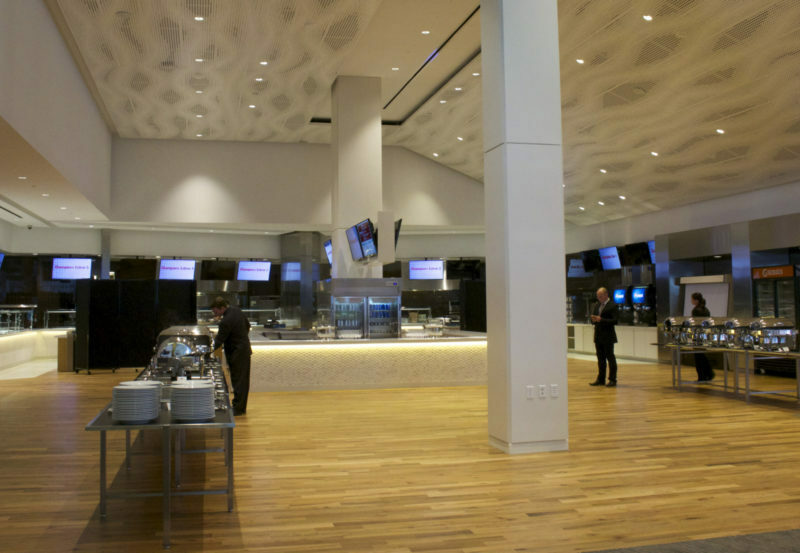 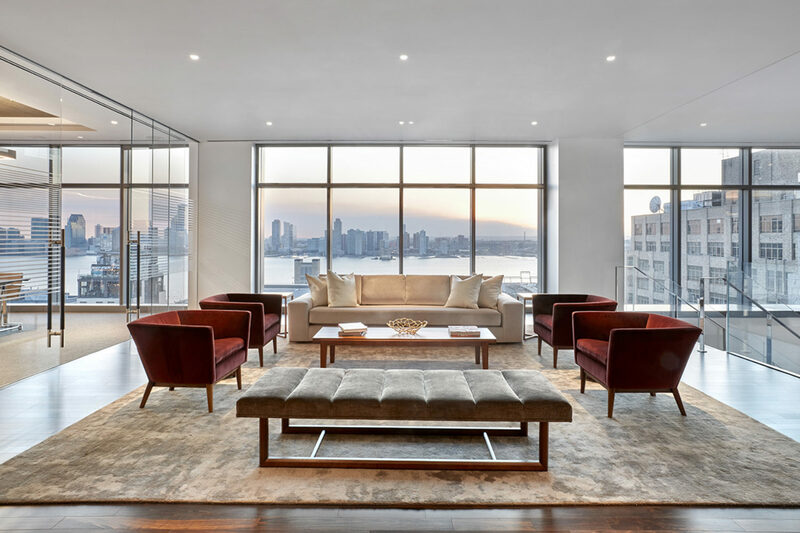 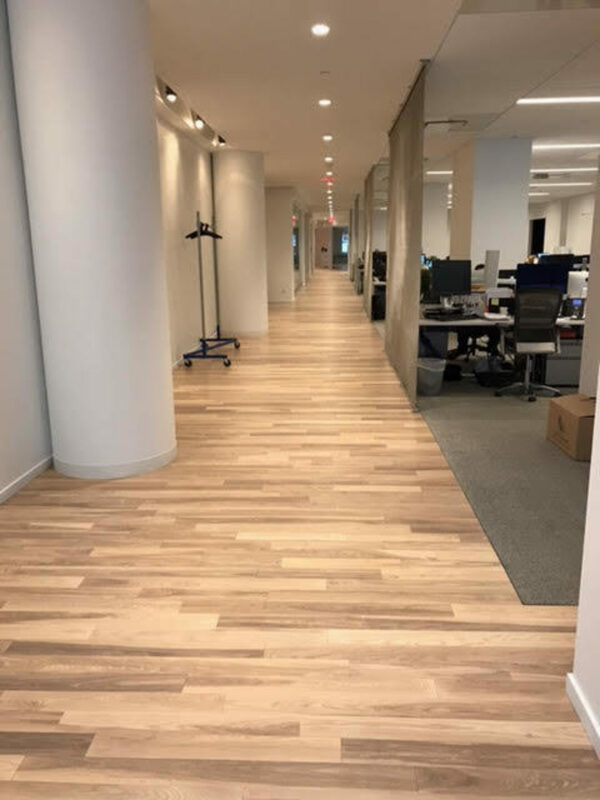 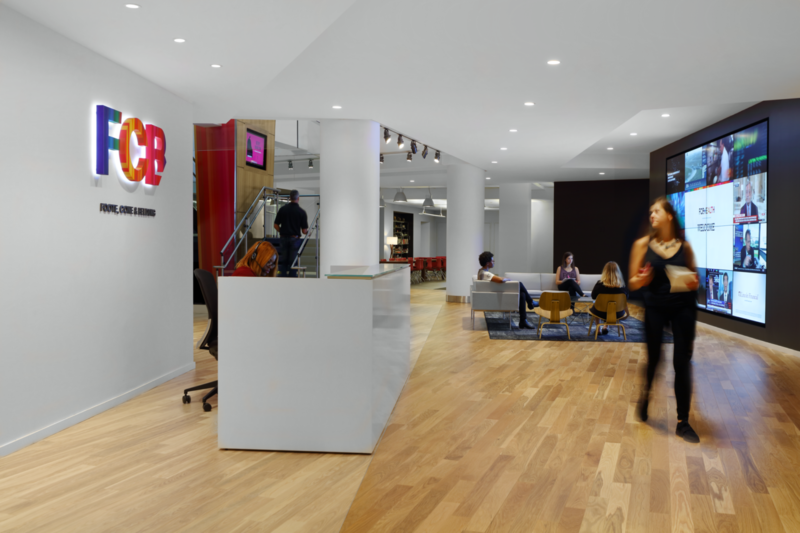 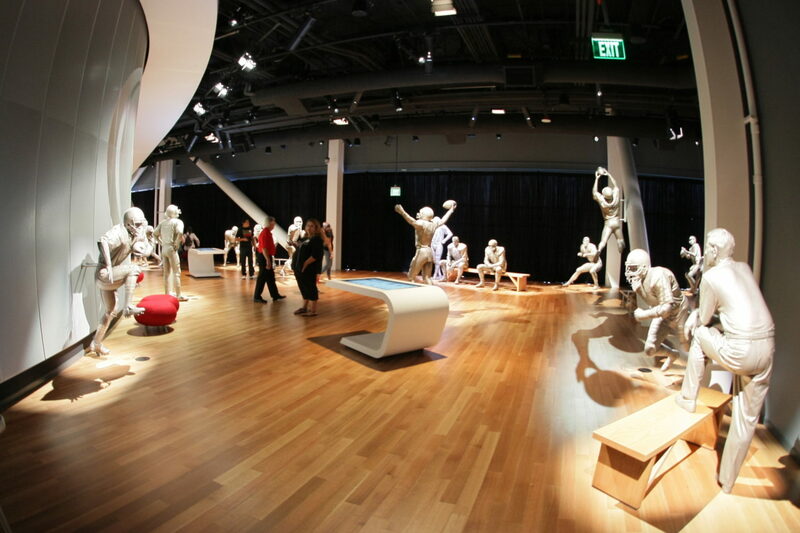 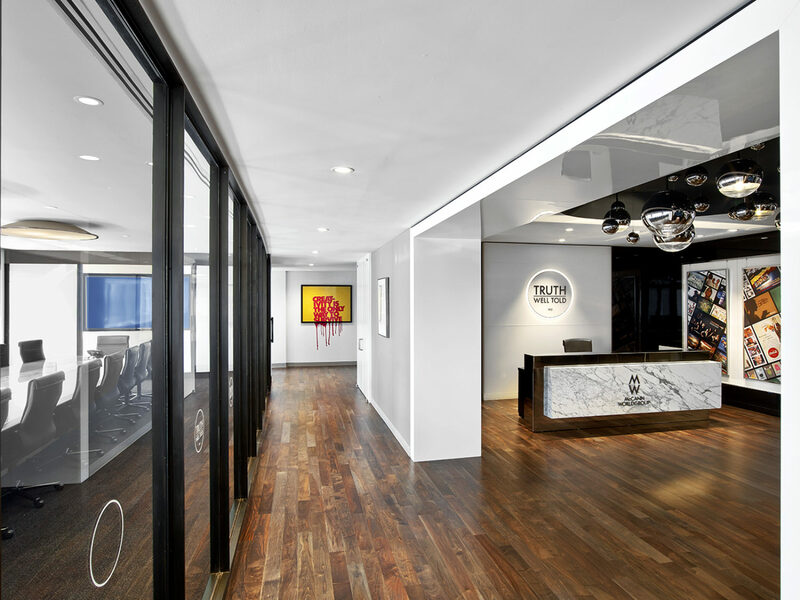 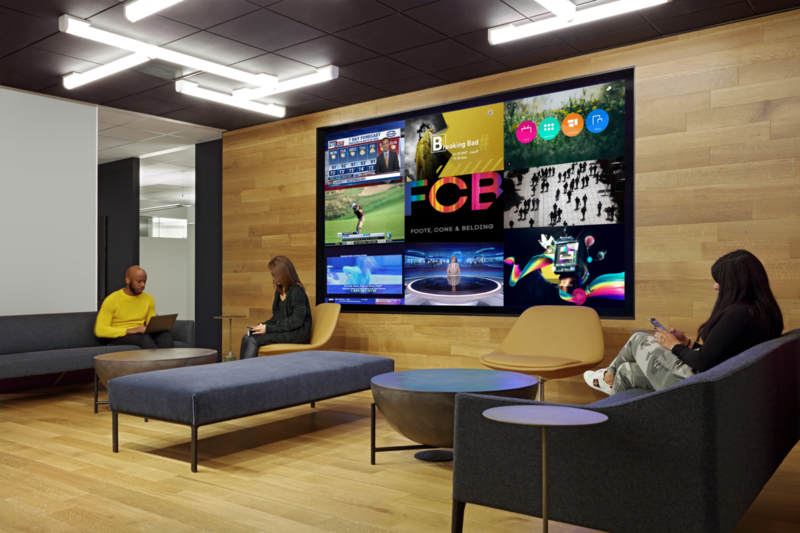 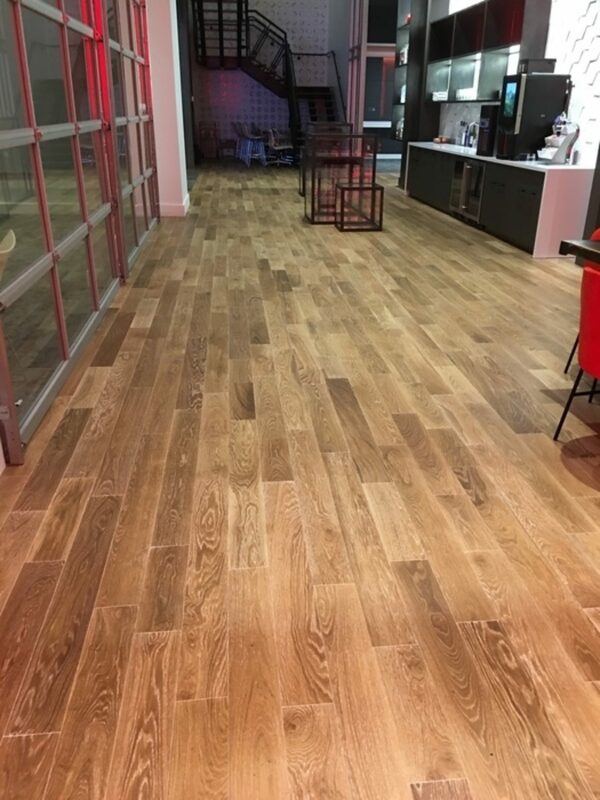 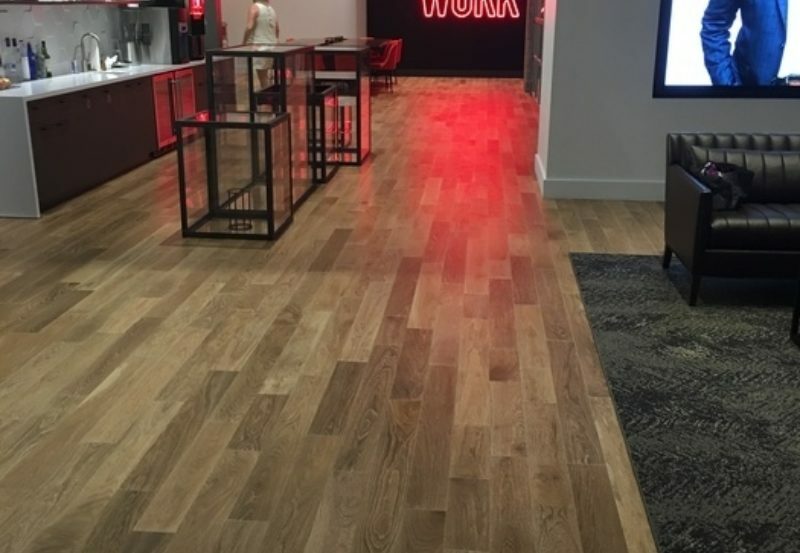 Our Plainsawn Ash Vanilla and Natural flooring options can be found at FCB Worldwide in New York City. 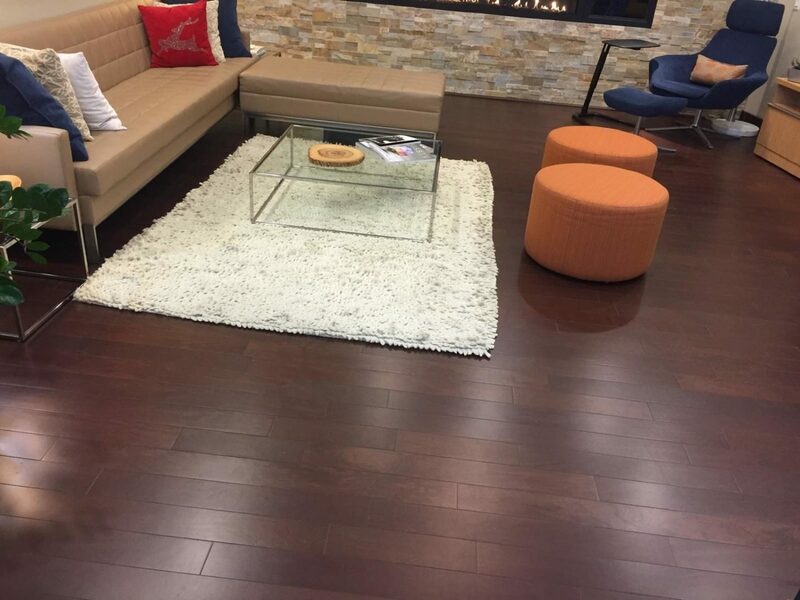 Use our COR Walnut flooring for lobbies and casual meeting areas. 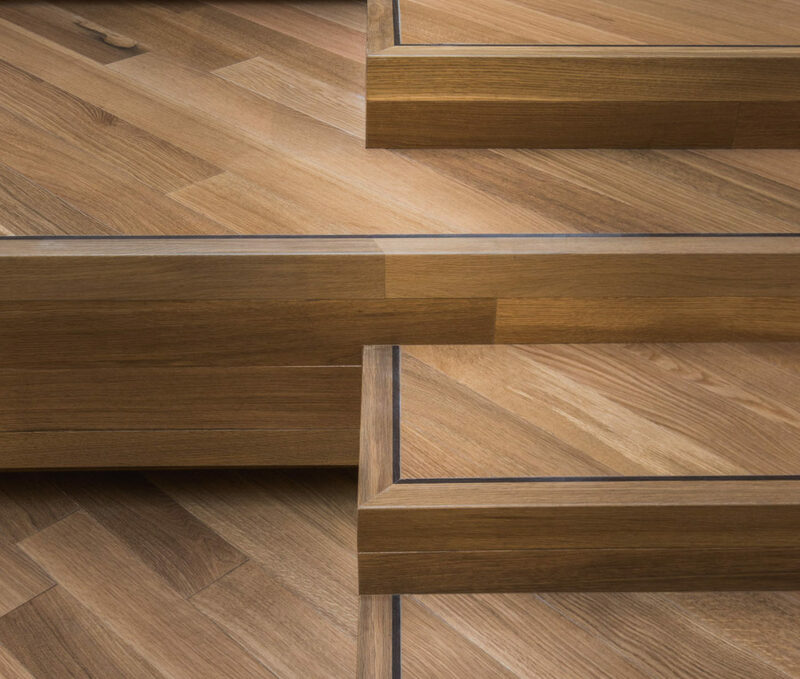 Rift and Quartered White Oak Natural is perfect for modern staircases. 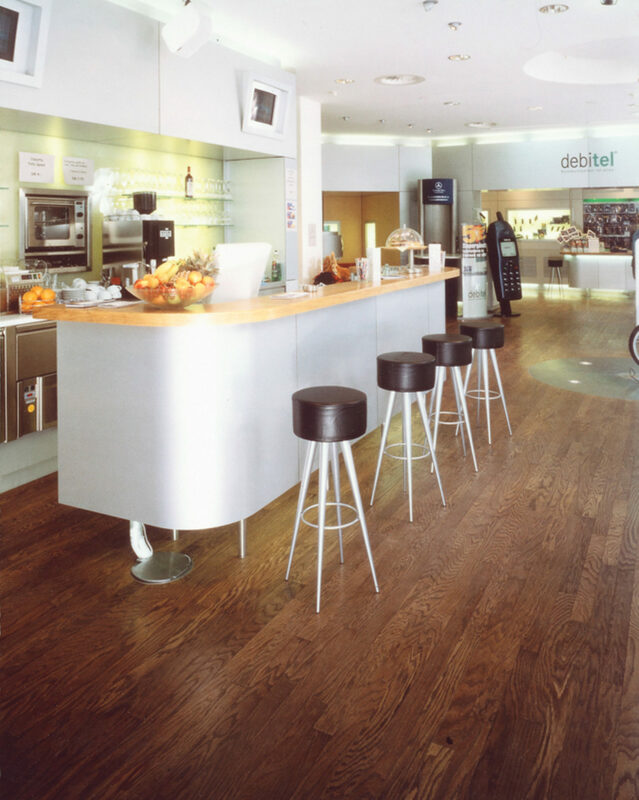 Companies such as Nestle use COR Gothic flooring for kitchens. 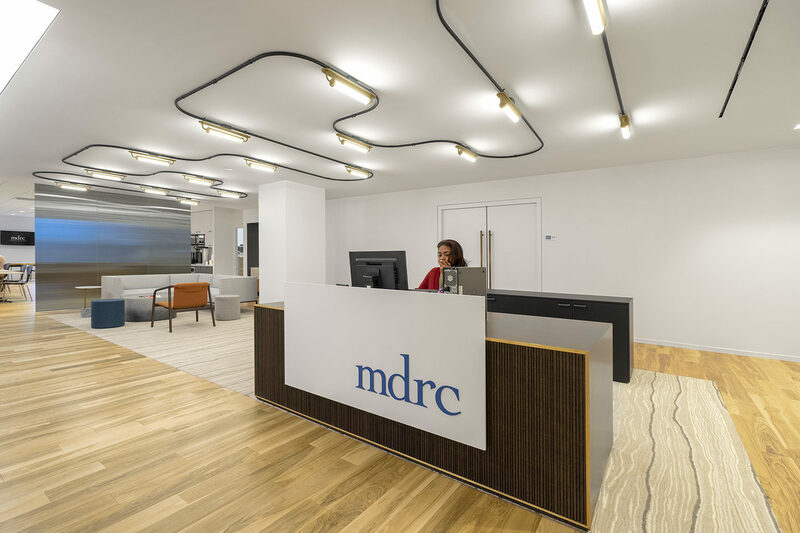 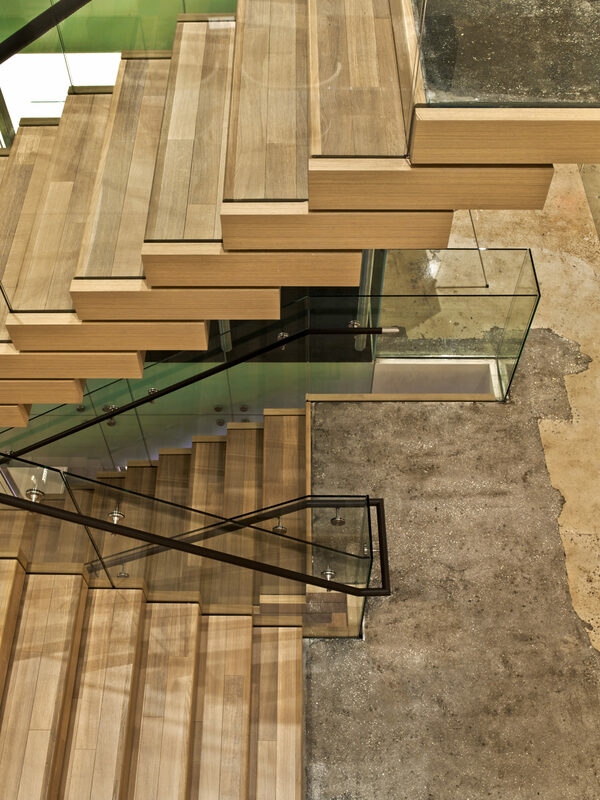 Real wood that allows this office to stand out in its showroom. 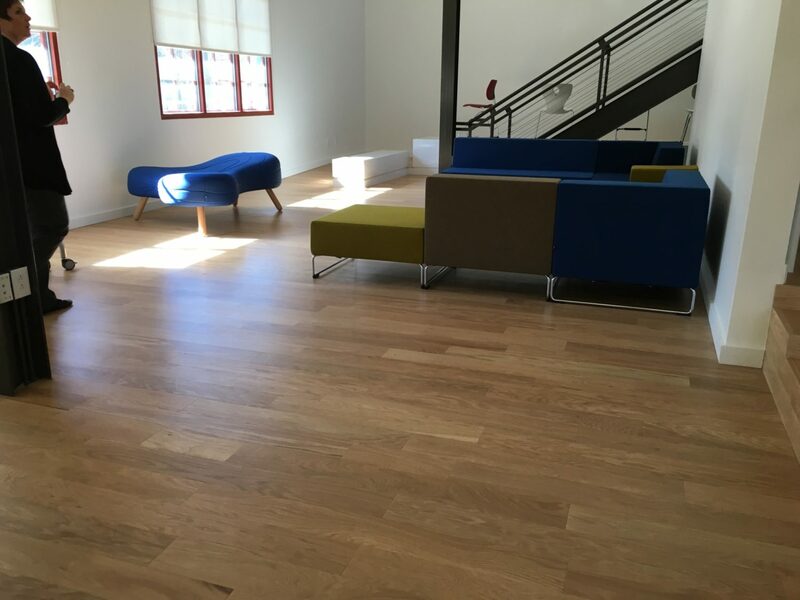 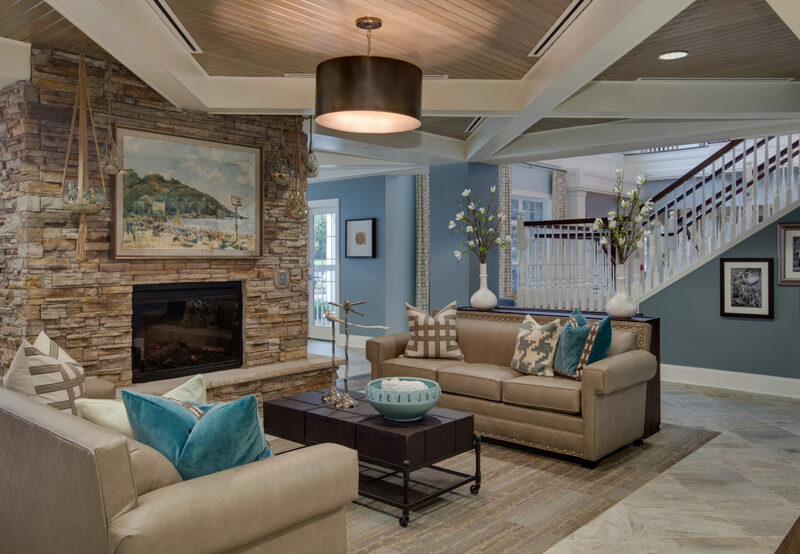 Reclaimed Oak Cashmere Gray provides a warm feel for gathering areas. 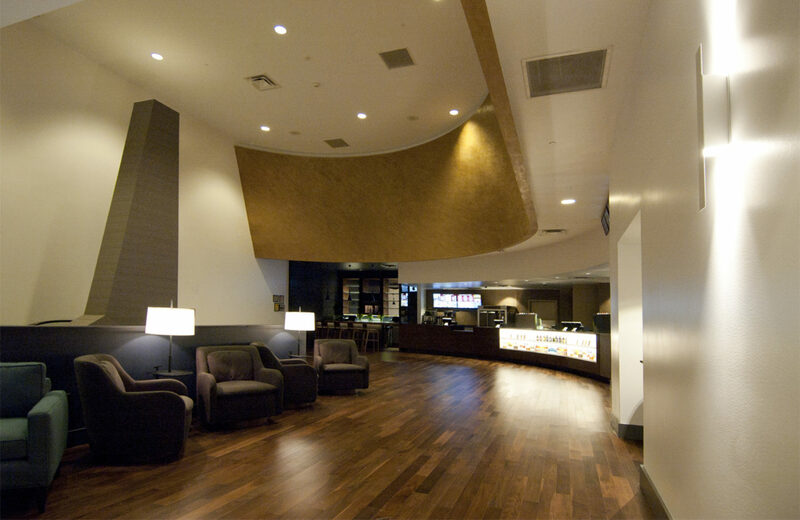 COR Natural flooring is always a great option for large gathering areas. 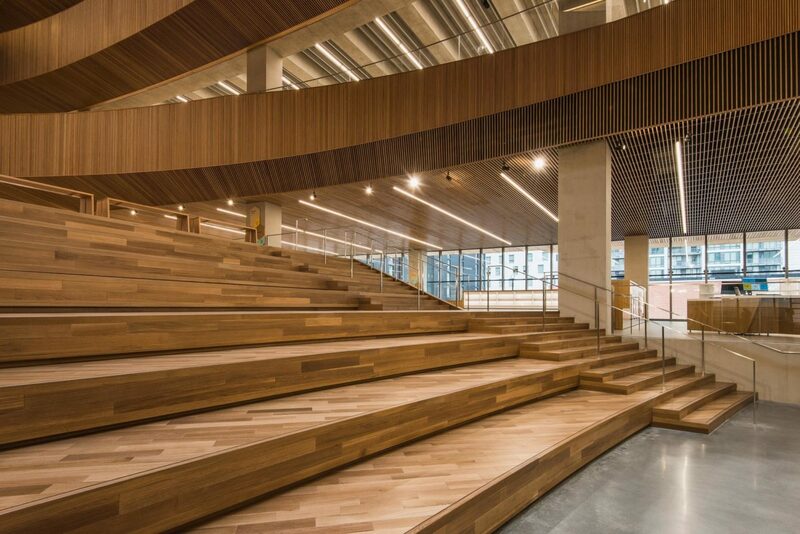 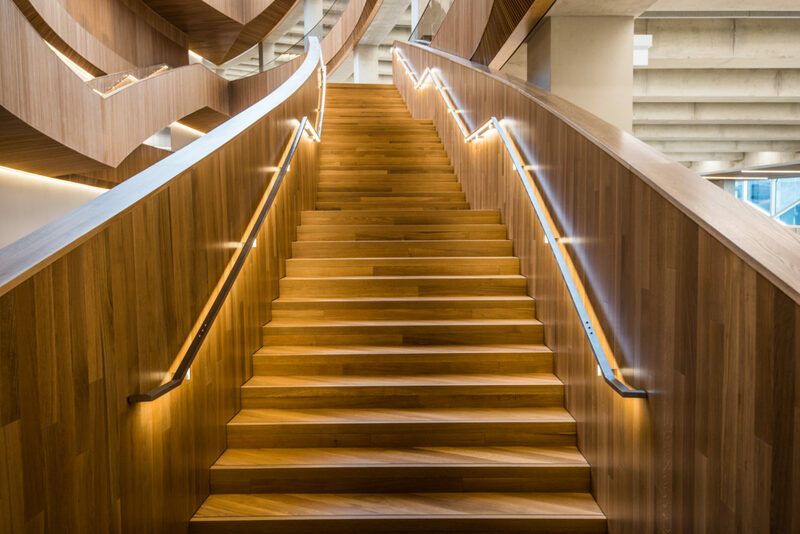 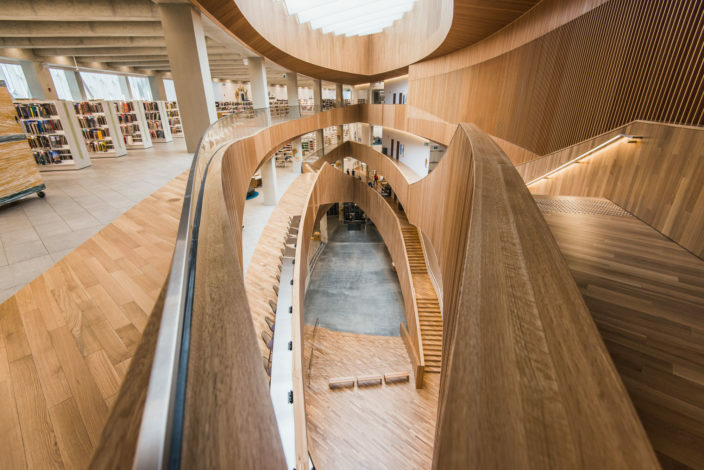 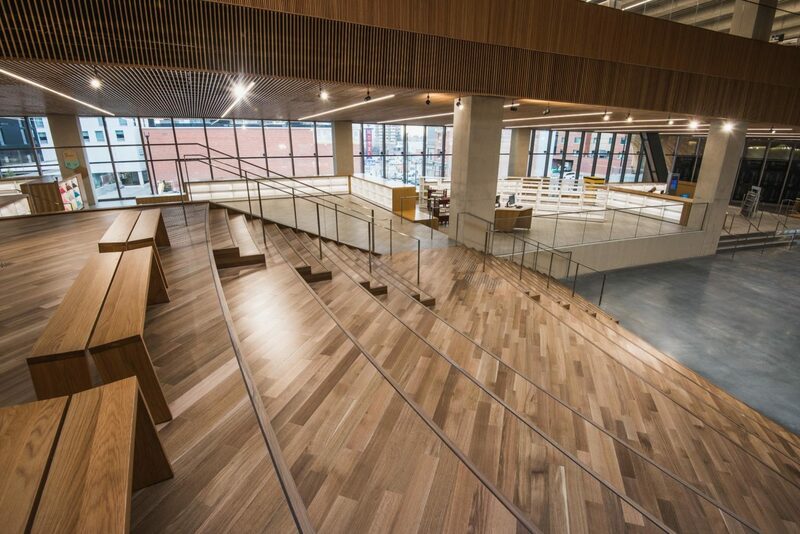 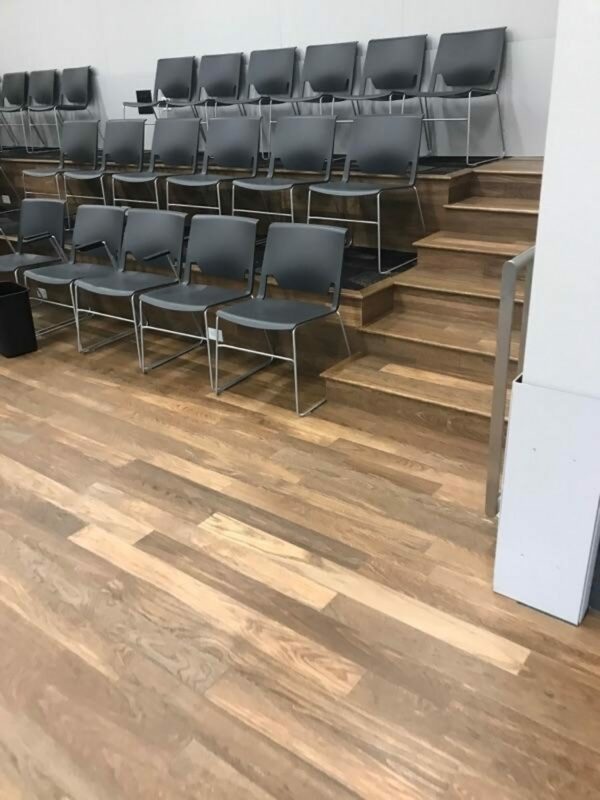 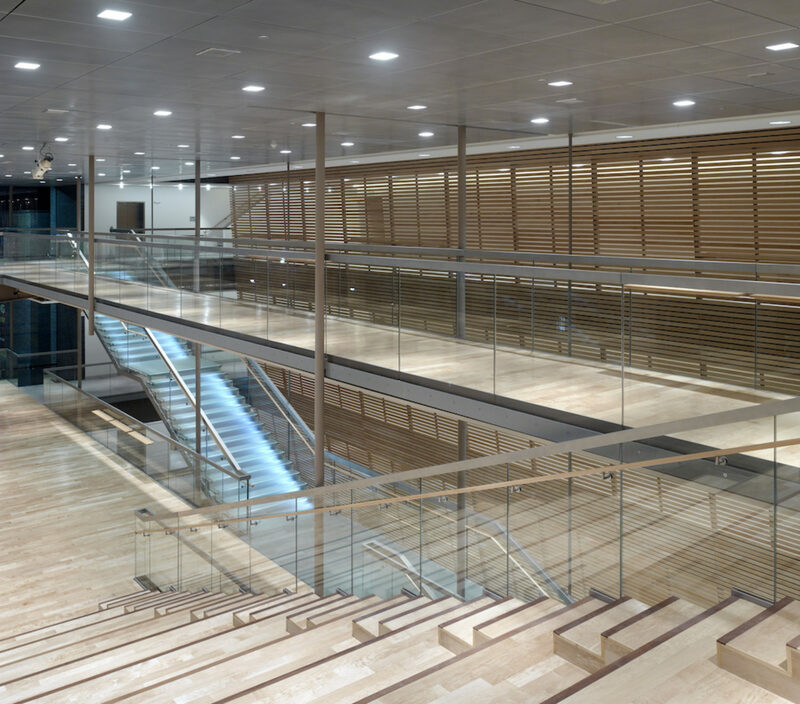 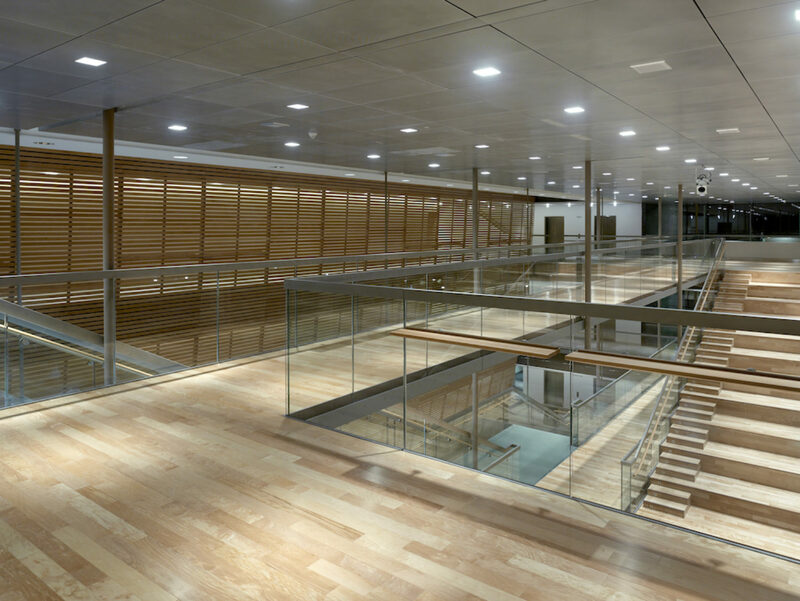 Rift and Quartered White Oak Natural covers the floors and walls of this ingenious design at the Calgary Public Library. 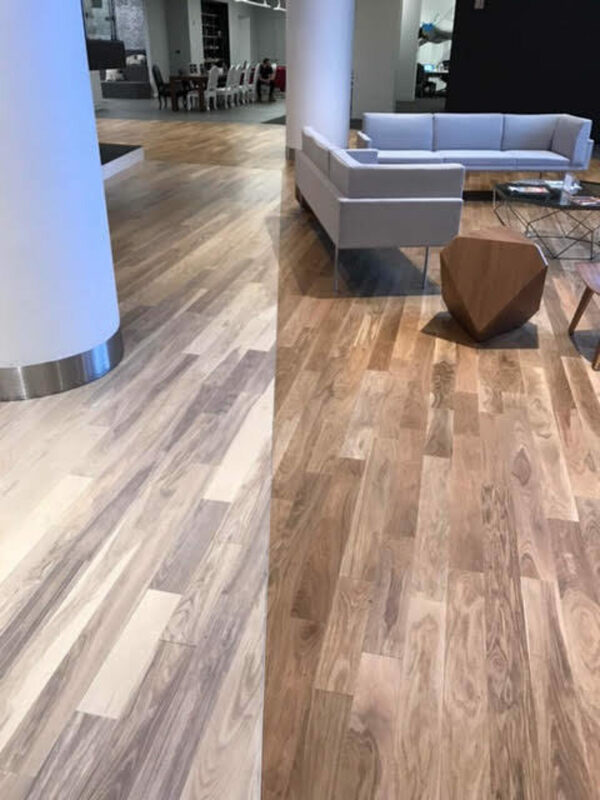 The CNN Center is the world headquarters of CNN and in it's central hub, now features Rift and Quartered White Oak Natural. 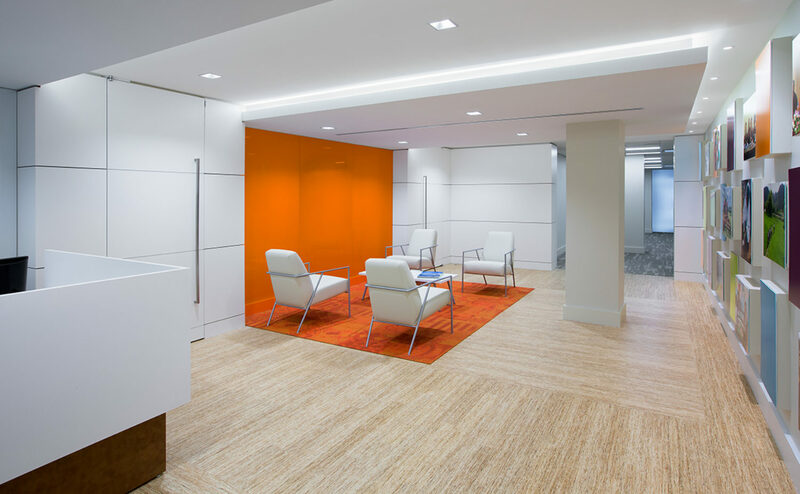 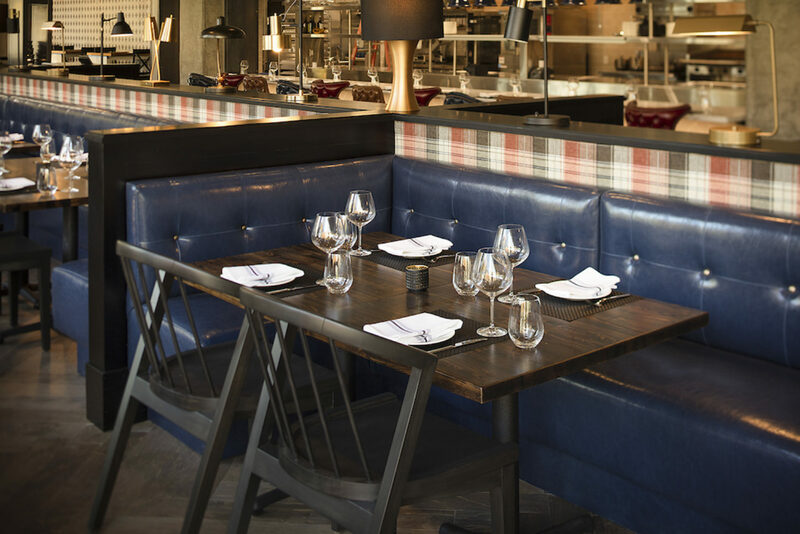 Designed by HLG Studio and installed by Spectra Contract Flooring. 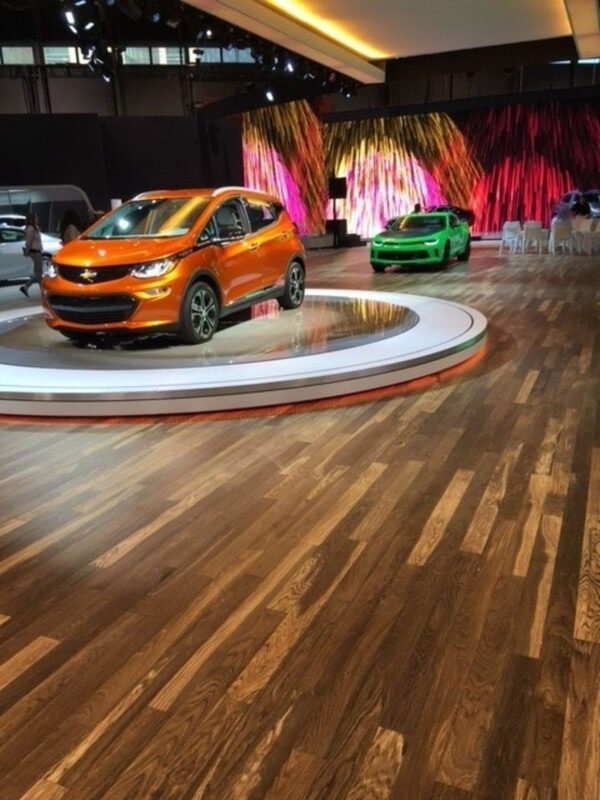 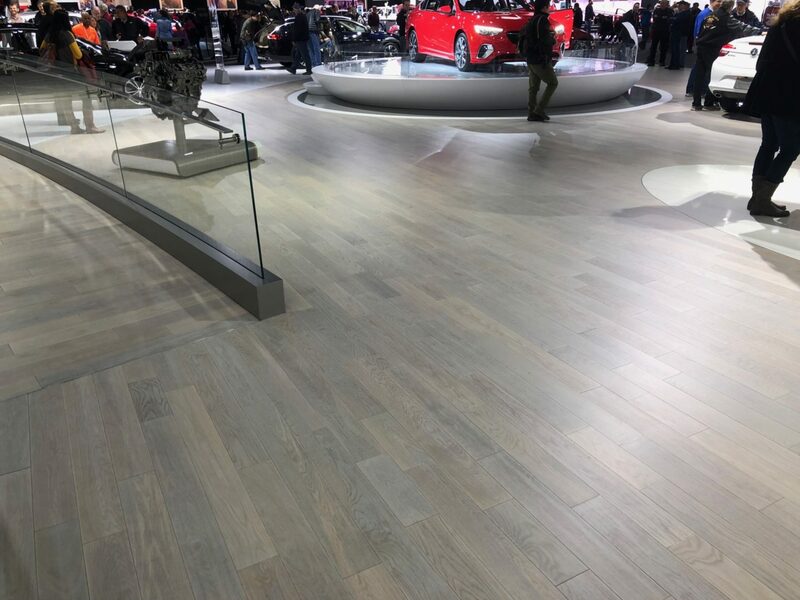 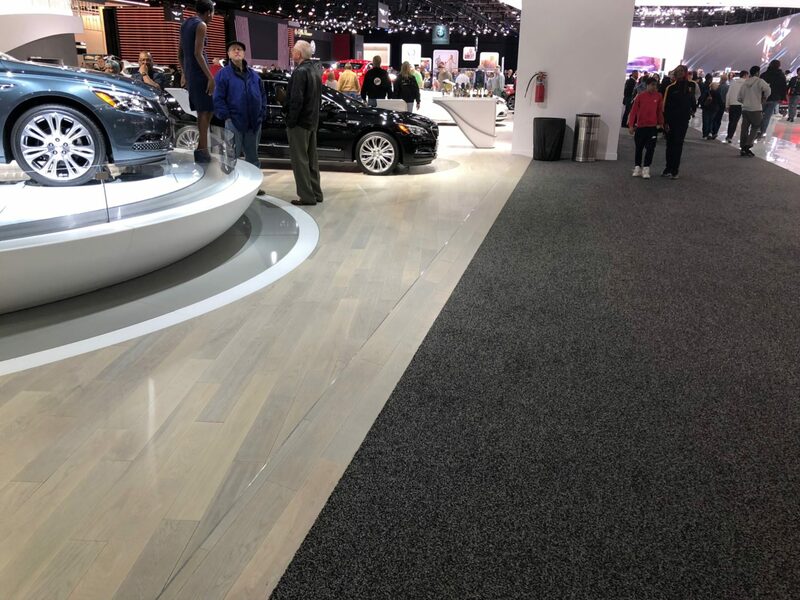 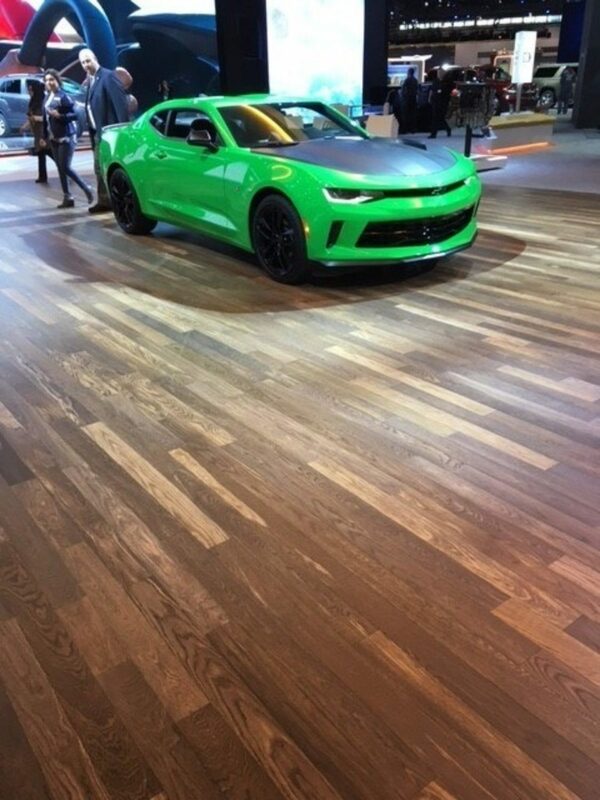 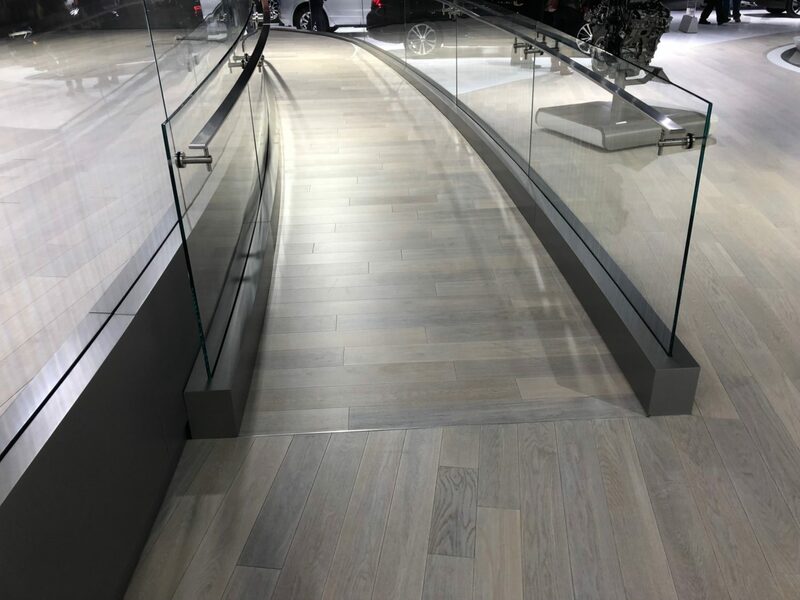 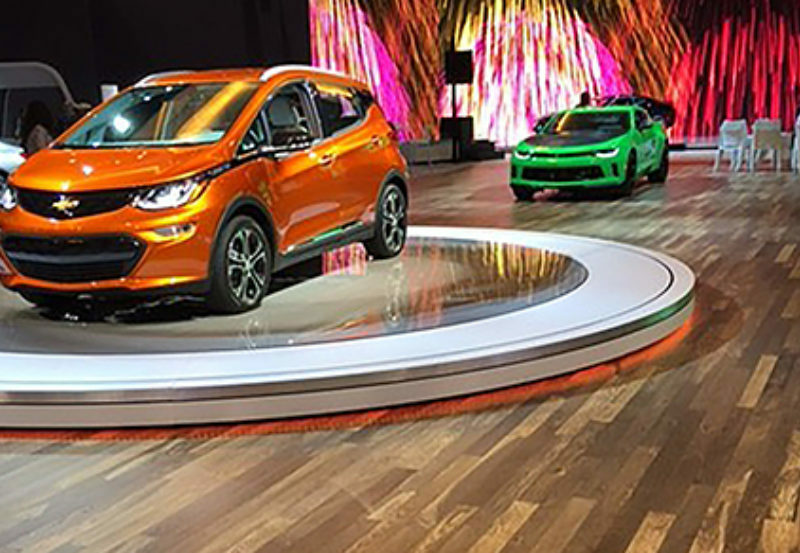 Nydree's Plainsawn White Oak Pacific Grey flooring is the perfect backdrop for Buick at the International Auto Show. 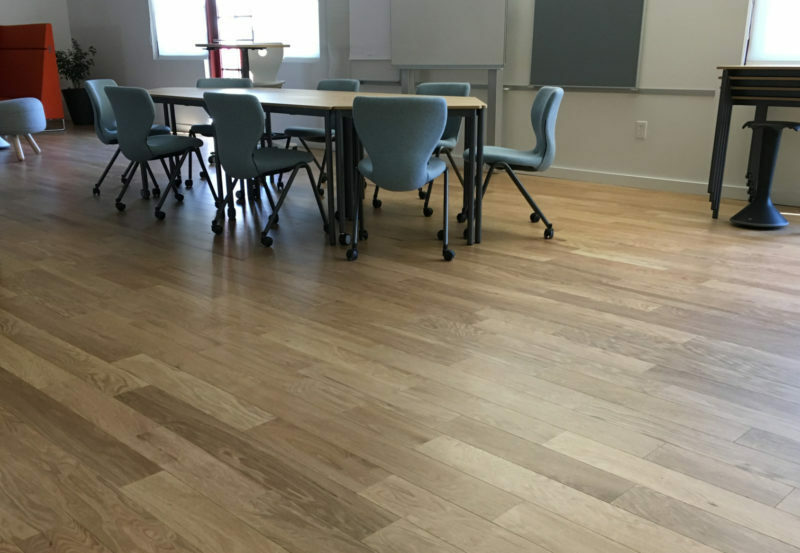 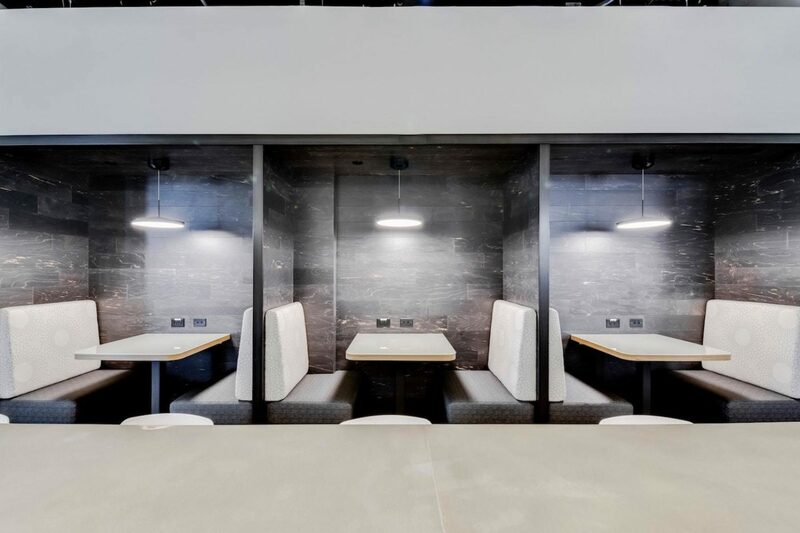 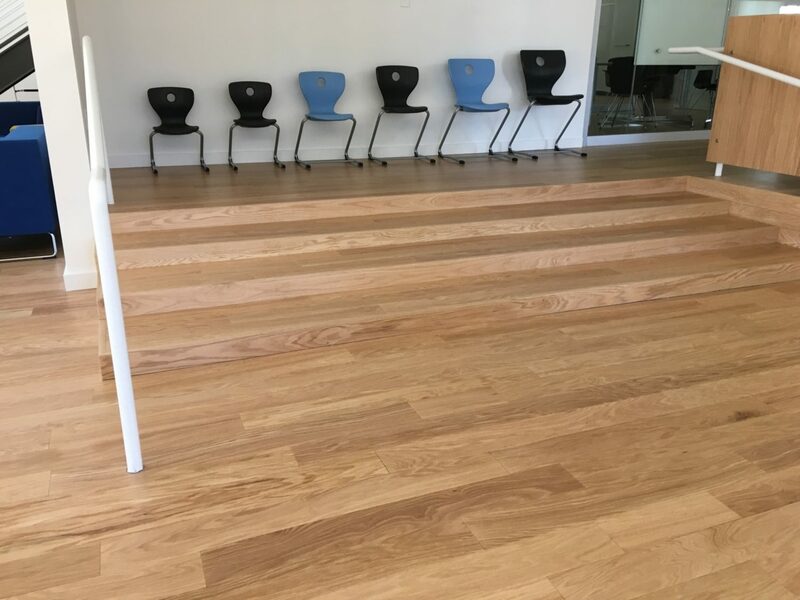 Plainsawn White Oak Oxford provides a warm environment for this public meeting space. 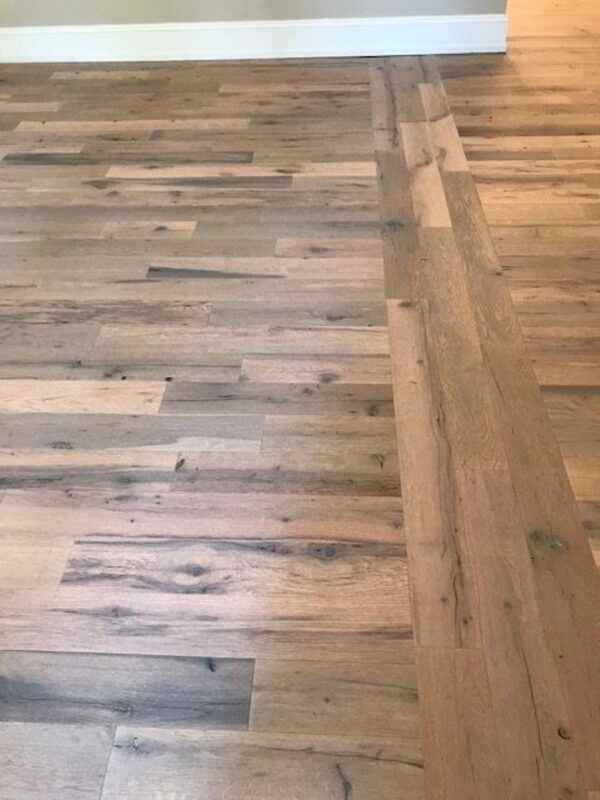 A custom Sea Mist stain on our Reclaimed Oak flooring was crafted to match the aesthetic of this property. 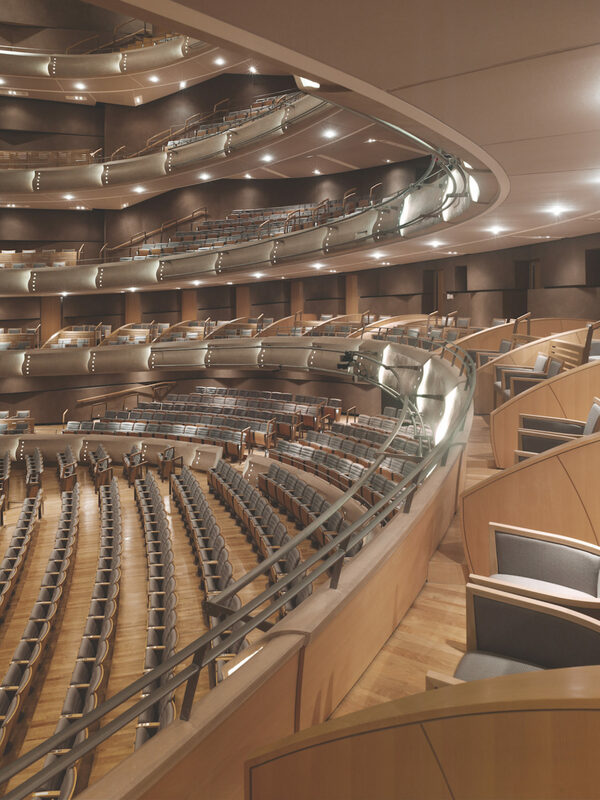 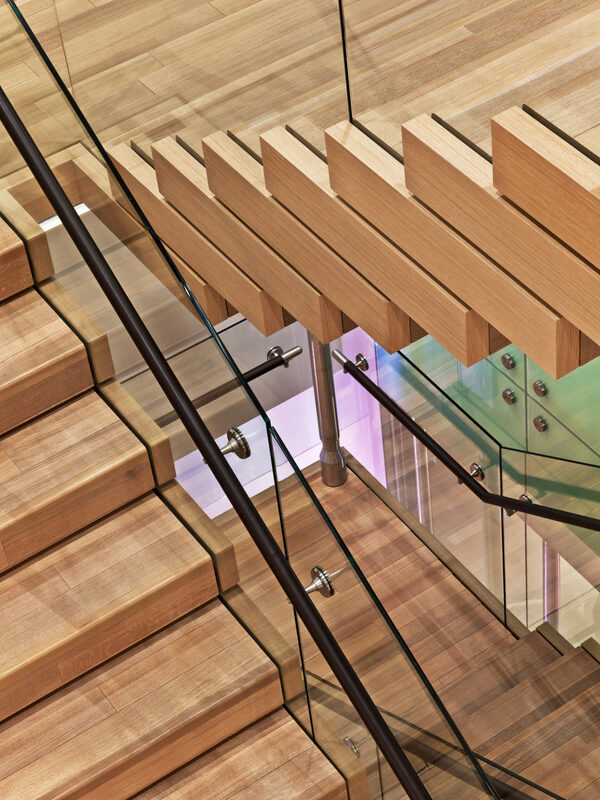 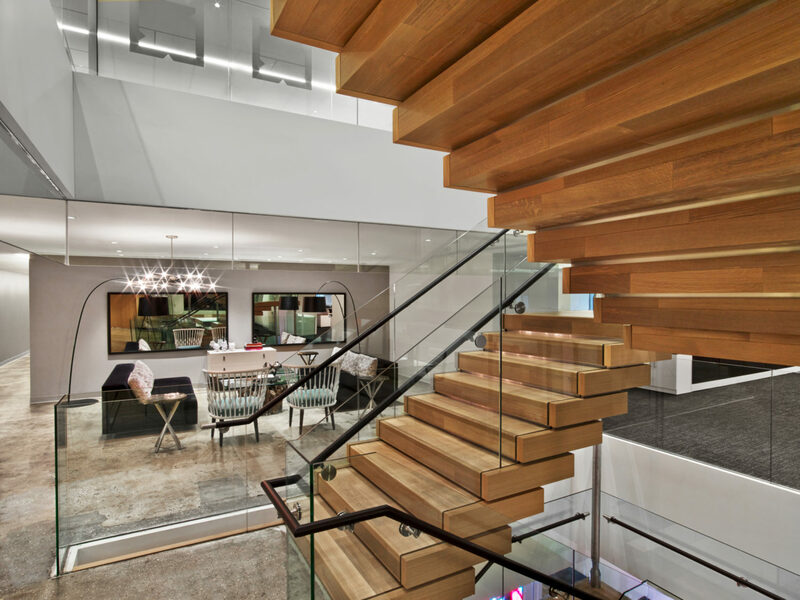 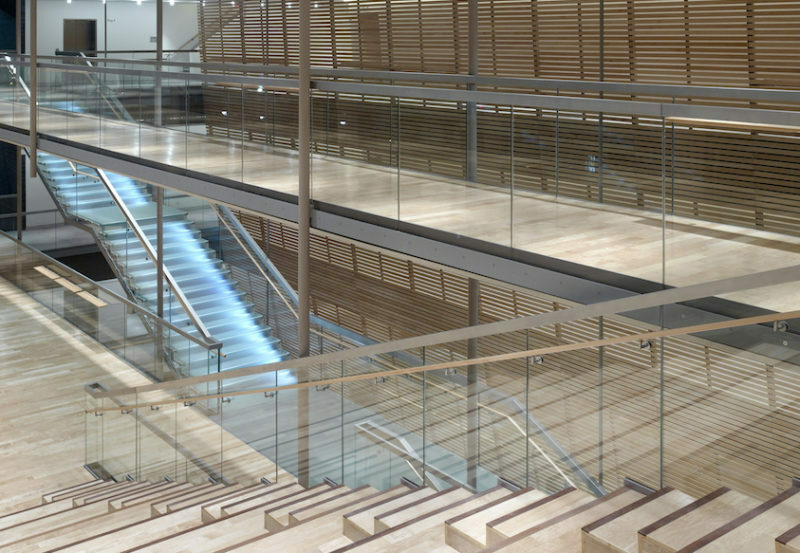 Maple Natural goes well with public lobbies and staircases. 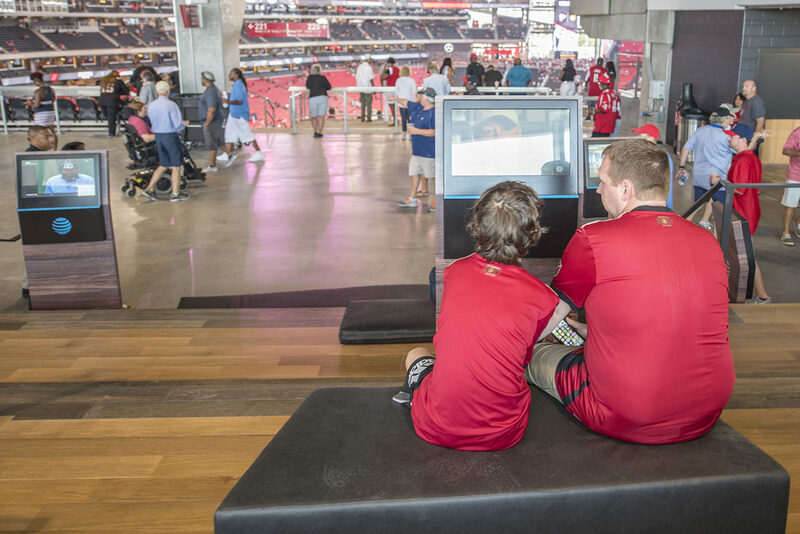 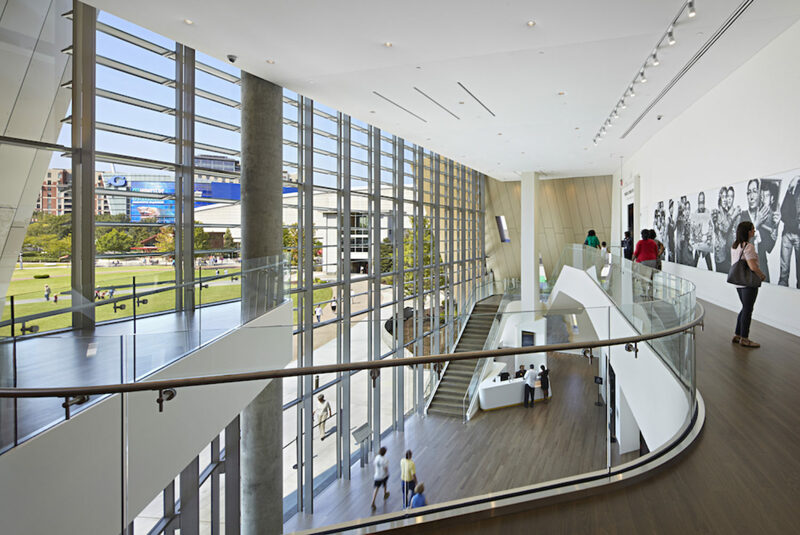 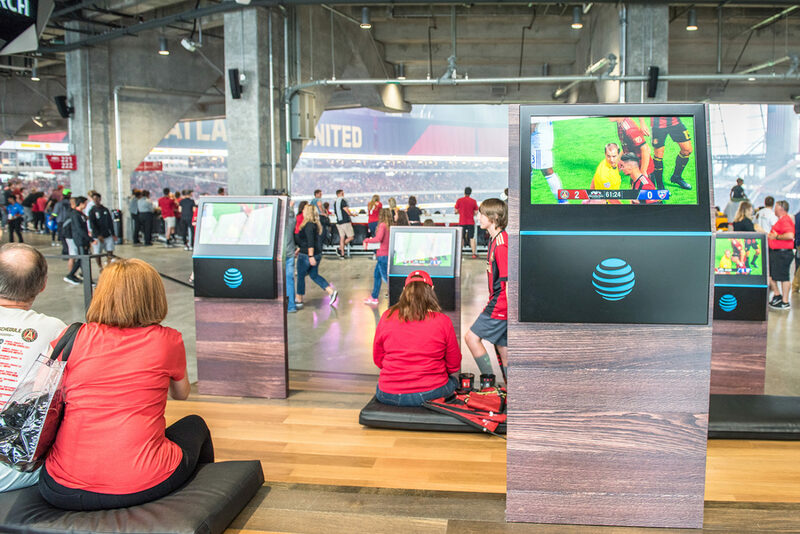 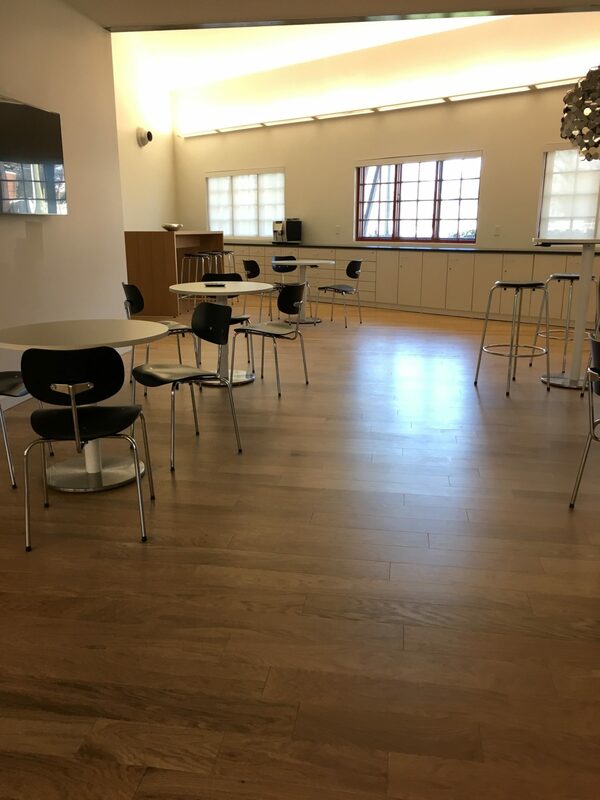 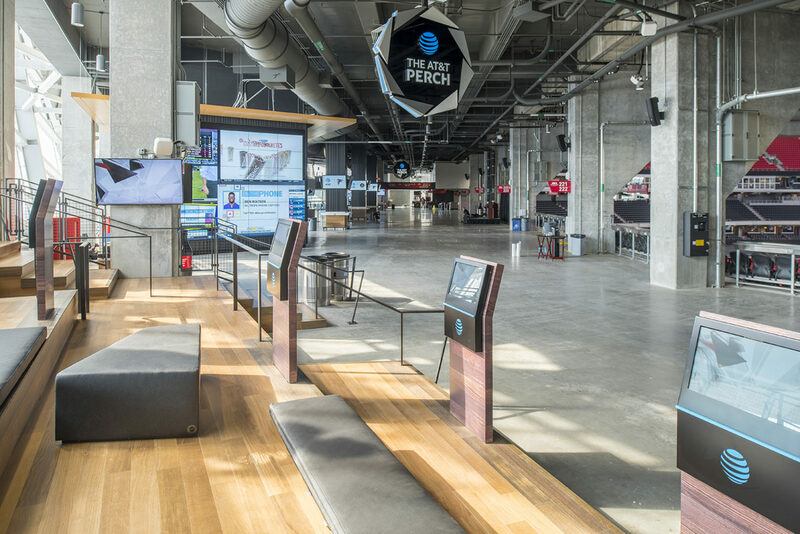 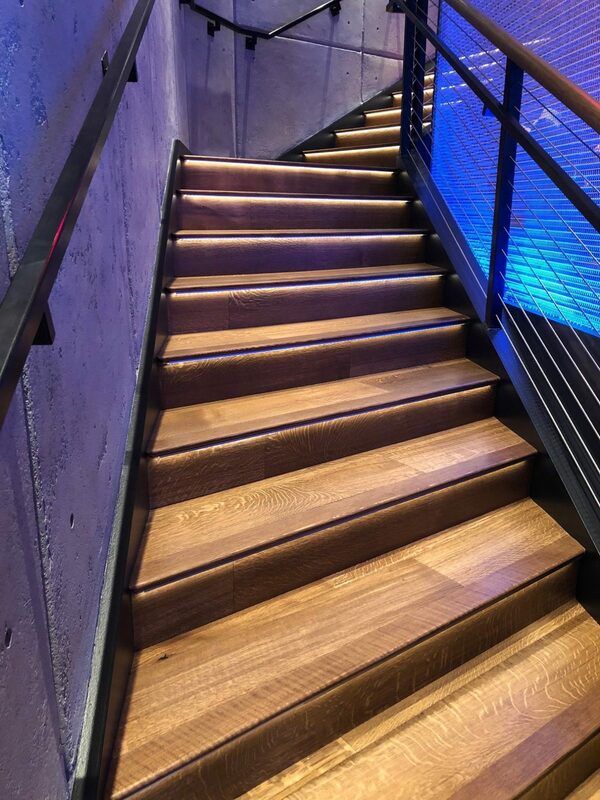 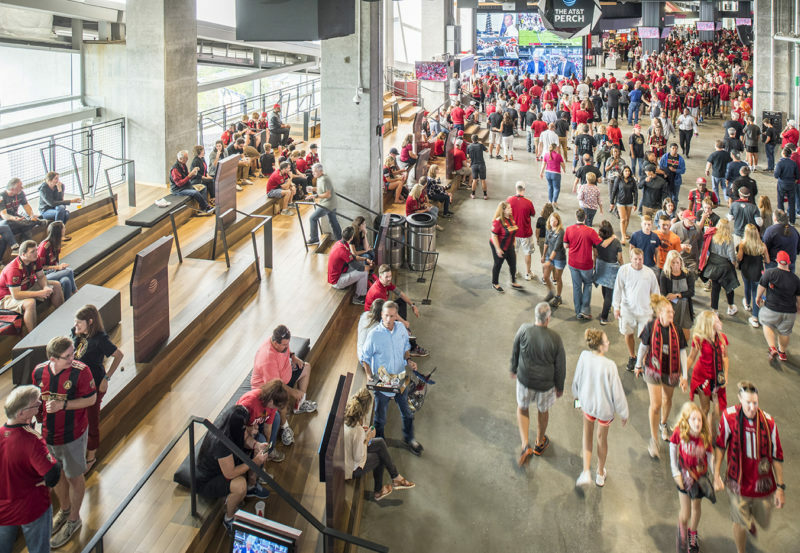 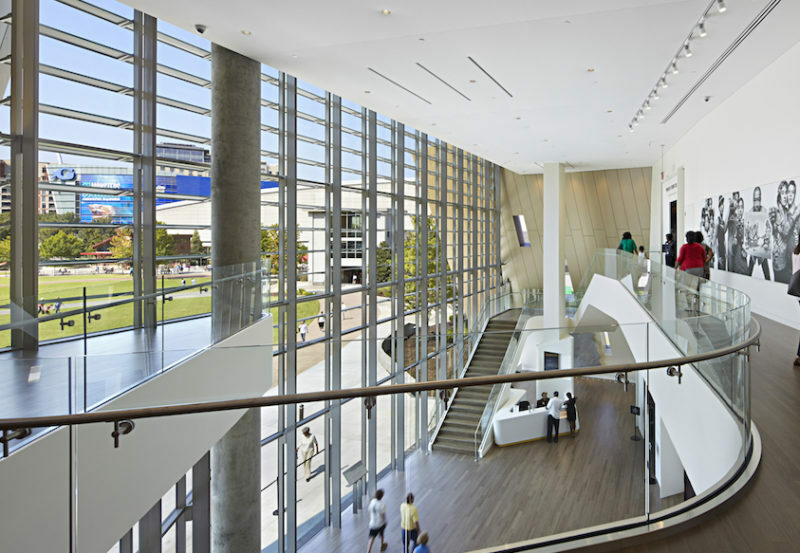 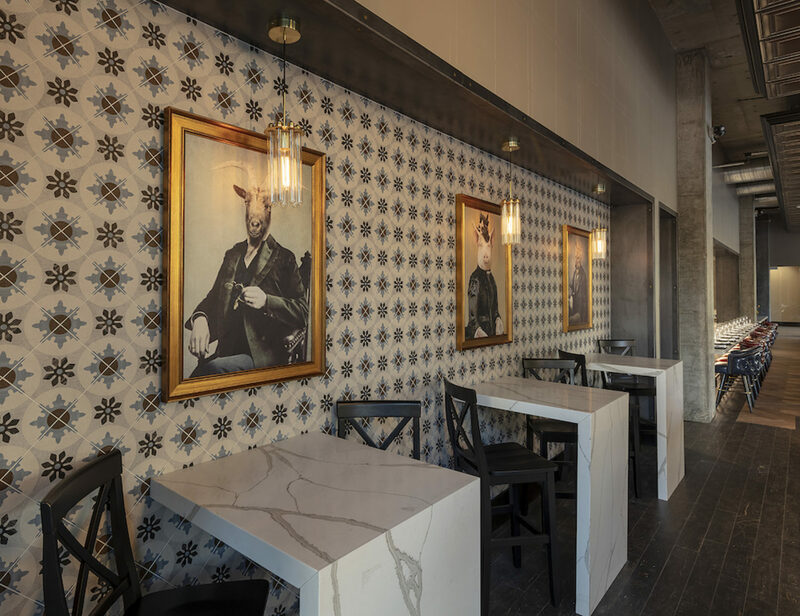 Our Custom Oak wood flooring is an excellent choice for large areas for display, such as the National Civil Rights Museum. 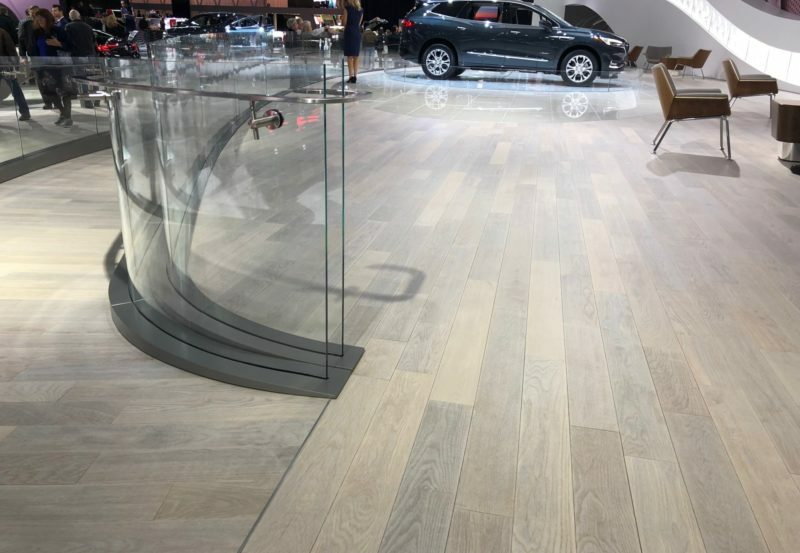 Custom Plainsawn White Oak is an excellent choice for a display area such as a museum. 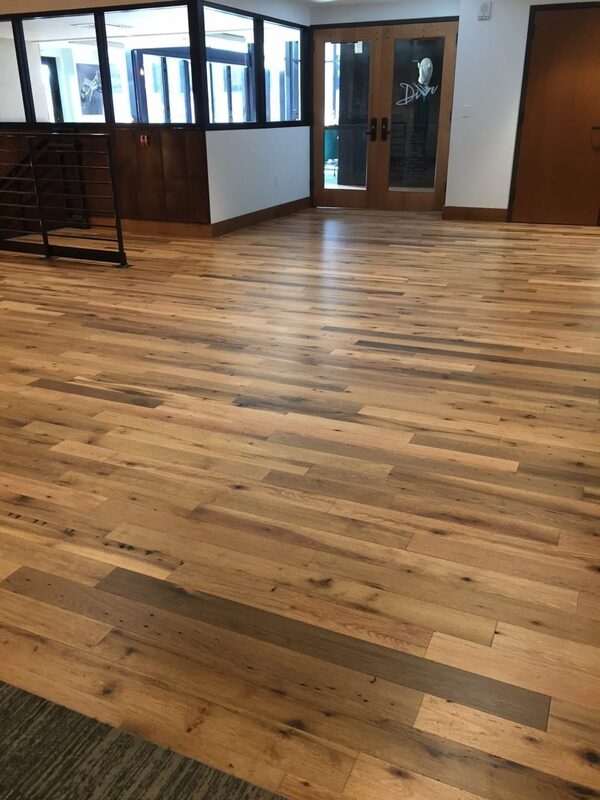 Rift and Quartered White Oak Natural and Rift and Quartered White Oak Starry Night. 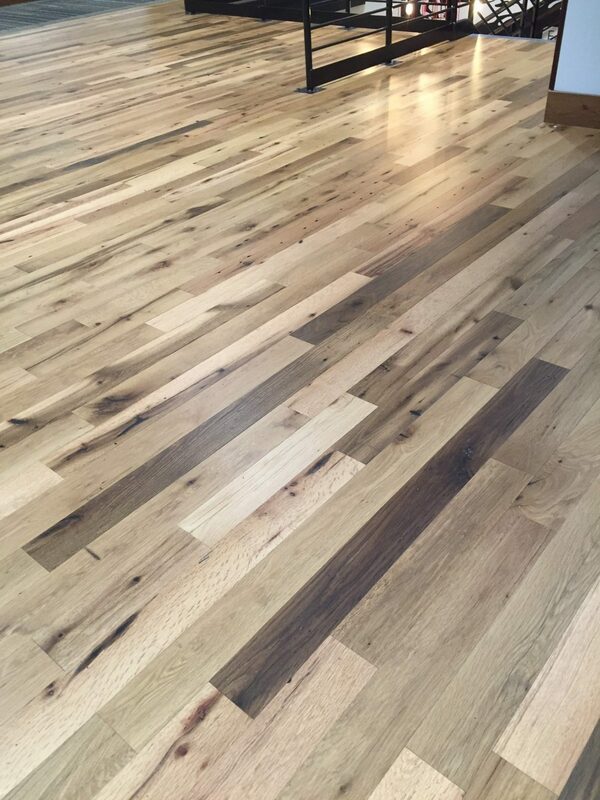 Rift and Quartered White Oak Natural is a great option for a spacious area. 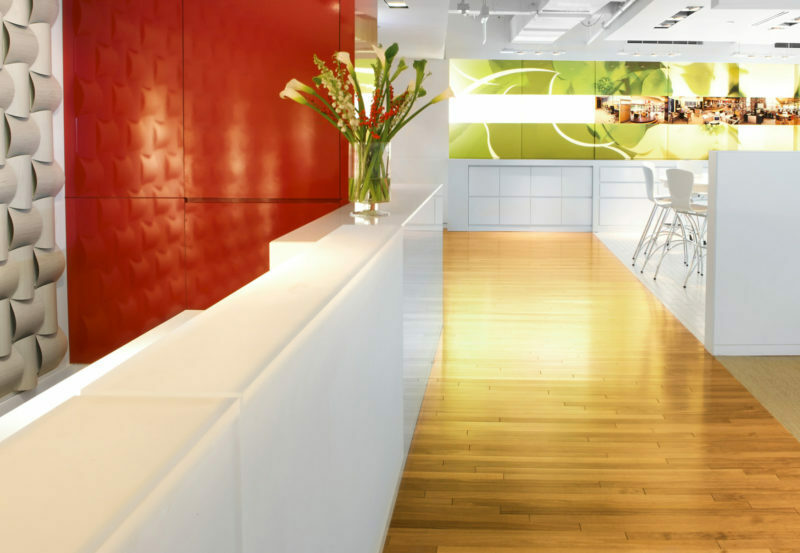 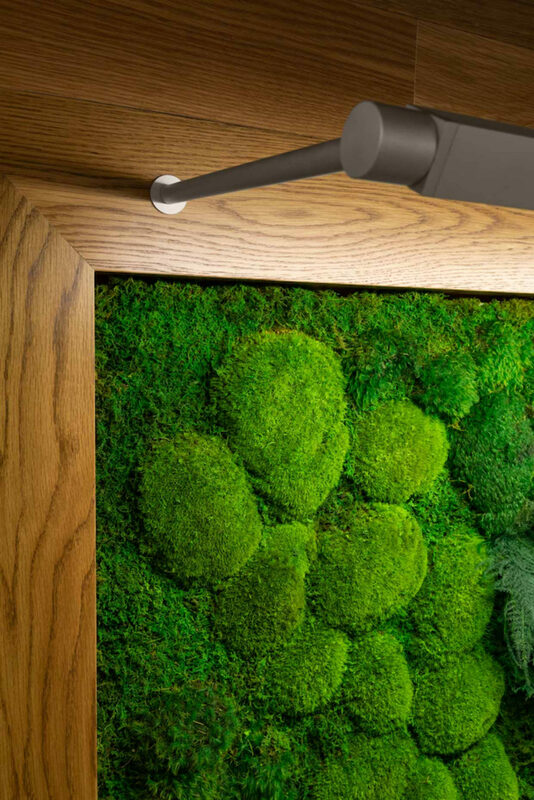 Cherry Natural gives a welcoming feel for a lobby or foyer.